When it comes to cloud computing, NAS and networking equipment, Synology needs no introduction at all as they are leading the market from the front with their continuous Software and Hardware innovation backed by customer support service. The company was founded in 2000 and is primarily engaged in network-attached storage (NAS), IP surveillance solutions, and network equipment that transform the way users manage data, conduct surveillance, and manage the network in the cloud era. By taking full advantage of the latest technologies, Synology is committed to delivering products with forward-thinking features and best-in-class customer service. Striving to redefine what a NAS can achieve, Synology combines the features of public and private clouds to develop a hybrid cloud solution with a web-based platform, transforming NAS into a multi-functional device suitable for various purposes. Software innovation is at the core of driving the hardware innovation. Without powerful software, the hardware is as good as the poorly designed and deployed software. Knowing this, Synology focuses not only on the hardware but equally focusing on the software. They have simplified the things by hiding the complex hardware abstraction and computing by offering intuitive, user-friendly and highly flexible software that enables the users to deploy and start using Synology products and service to drive and facilitate the data storage and sharing needs with much ease. Synology believes in 5S that serves as the pillars to their core values and their core values are what is driving the continuous innovation and is reflected in their products and services. These 5S are Store, Sync, Service, Secure, and Share. 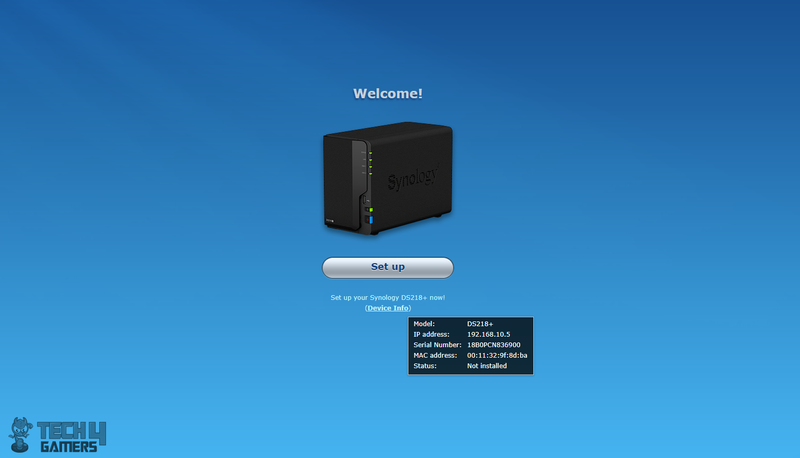 Synology was kind enough to let us test their DS218+ NAS box. As the name indicates this NAS box is from their Plus series of the storage and sharing solution which is engineered for high-performance and data-intensive tasks, designed to meet on-the-fly encryption and scalability demands. The DS218+ is a compact yet powerful dual-bay NAS box which is equipped with a dual-core CPU, AES-NI hardware encryption engine with 2GB DDR3L RAM module. It is compatible with 2.5” and 3.5” HDDs/SSDs with a maximum single volume size of 108TB and maximum internal raw capacity of 28TB. In terms of file system, this box supports Btrfs, EXT4 for internal drives and Btrfs, EXT3/4, FAT, NTFS, HFS+, exFAT for external drives. 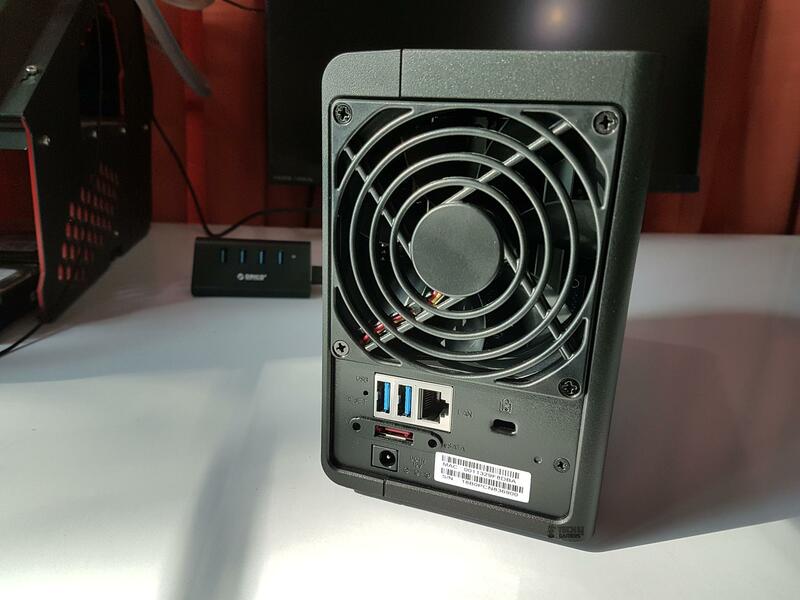 In terms of connectivity, this box has a single 1GbE LAN port, 3x USB 3.0 port, 1x eSATA port and also features a copy button. 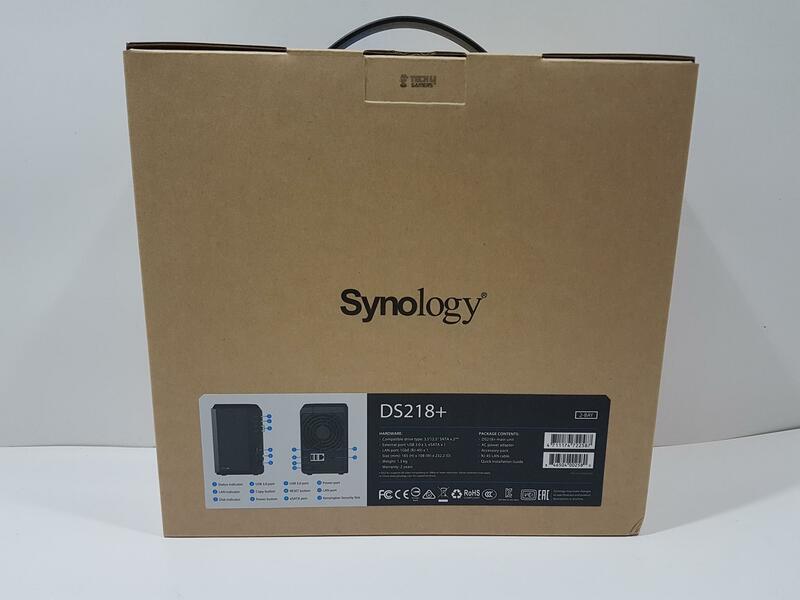 The DS218+ supports Synology Hybrid RAID which is a default RAID, Basic, JBOD, RAID 0/1 with the flexibility to expand the storage by adding an HDD yet supporting Synology Hybrid RAID. We can create a maximum of 2048 local user accounts with 256 maximum share folders and local groups. Up to 400 events can be logged per second. In terms of cloud station server, it can host up to 500 maximum numbers of concurrently connected devices. By adding more RAM (up to 4GB more), this count can be expanded to 1500 at a time. It can host a maximum of 80 concurrent downloads. If setting DS218+ up as a surveillance station, then maximum 25 IP Cams can be hosted. Using H.264 protocol, this device supports 120 FPS at 4k whereas this count is 200 FPS using H.265 and 130 FPS using MJPEG. The maximum no of hosted files is 500,000 under Synology Drive. It can feature a maximum 2 channels transcoding using 30 FPS at 4k and FHD resolutions. 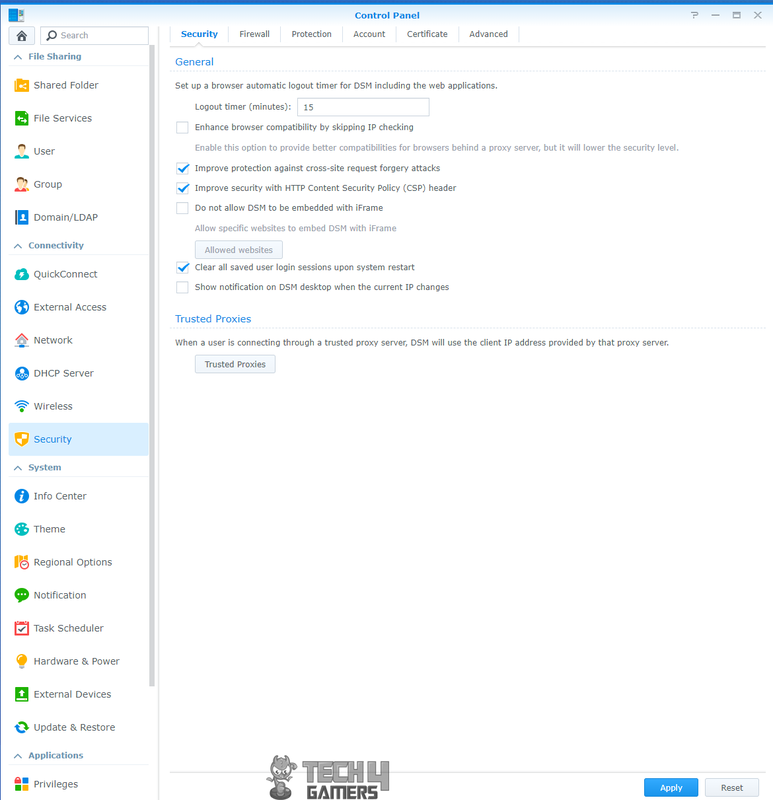 Maximum 20 connections are supported as a VPN server and maximum of 2 virtual machine instances are supported which is understandable given the basic RAM and CPU configuration. 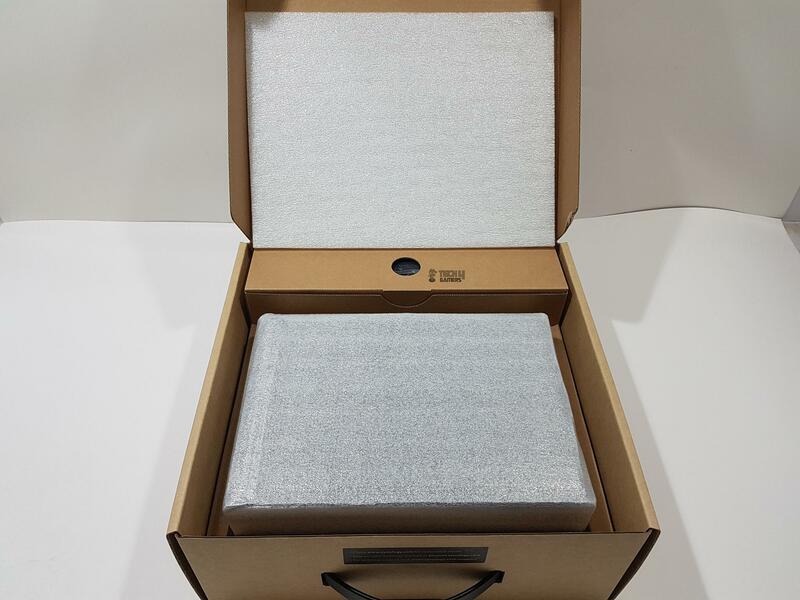 The product is shipped inside a rugged cardboard box packing of typical brown color. 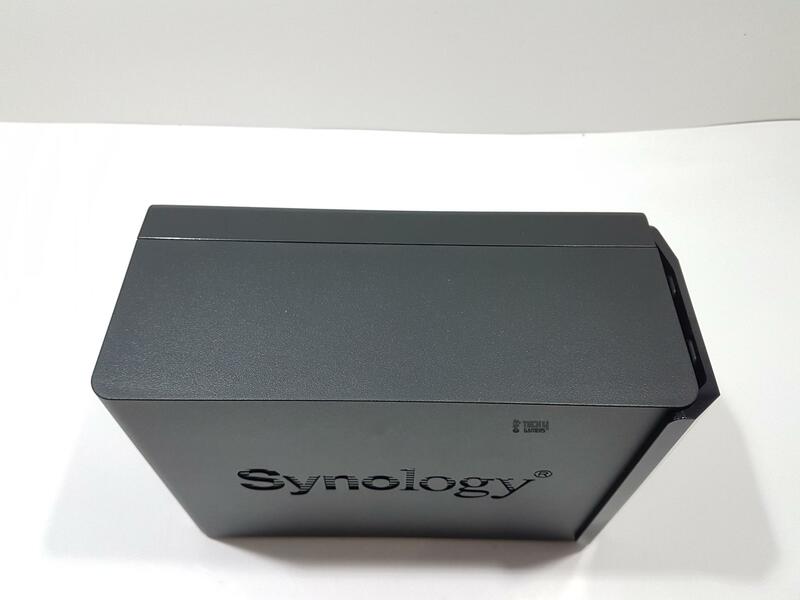 The front side of the box has Synology DiskStation printed at the bottom left side. There is a sticker pasted on the top right side which is extending from the top side. DiskStaton DS218+ is printed on its left side followed by the picture of the box on the right. It is a 2-Bay DiskStation. Salient features of the NAS box is printed further down. 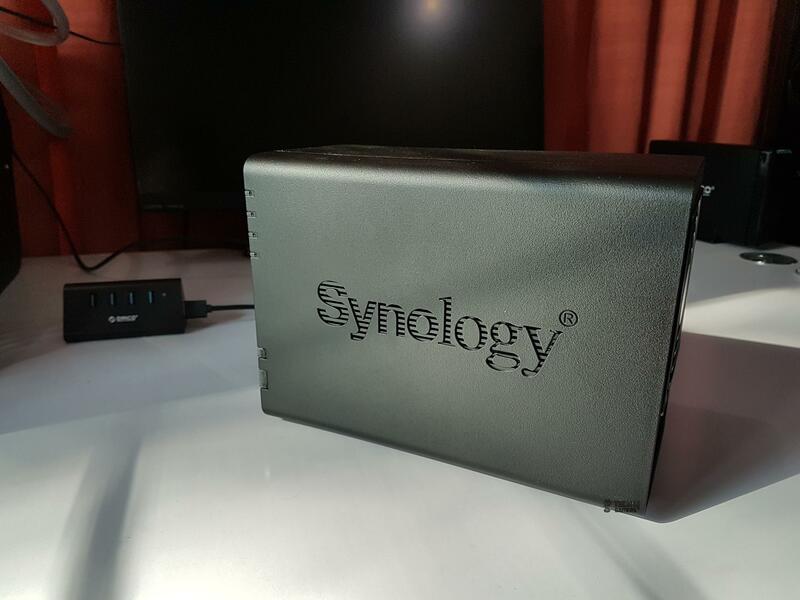 The backside has Synology printed in the center of the box. There is a sticker pasted at the bottom. Its left side has labeled diagrams of the unit. Salient specifications are printed on the sticker’s right side. 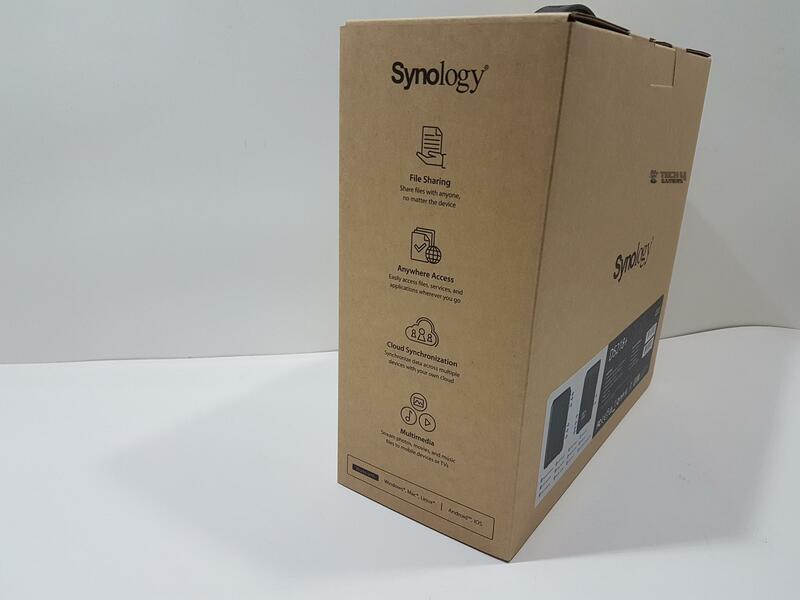 The left side of the packing box has Synology printed on the top. Salient feature highlights are printed on the main section. The unit is made in Taiwan. The right side has an identical layout as is on the left side with more features highlight and OS compatibility information printed on the bottom. 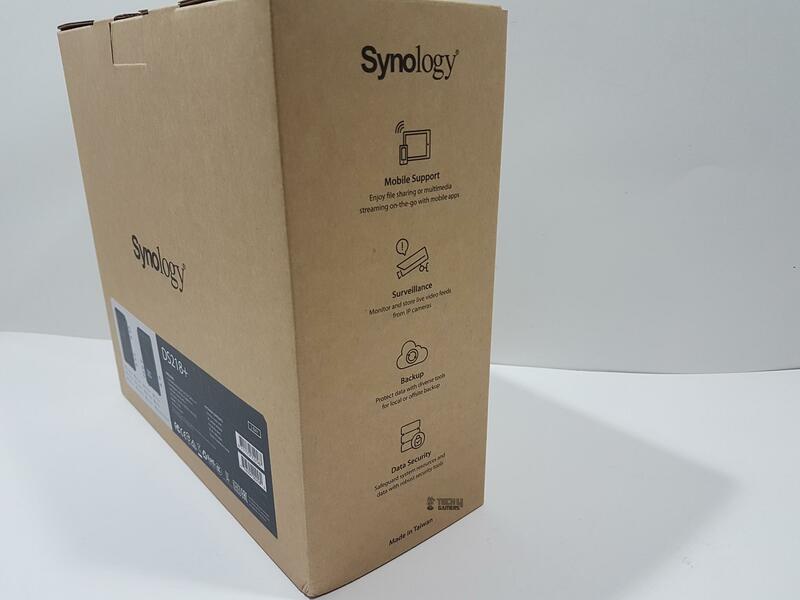 The top side of the packing box has Synology DiskStation printed on the top left. There is a black color handle coming out of the box in the center for easy carriage of the box. EAN and Serial No sticker is pasted on the top right side. The top portion of the sticker that is extending towards the front side shows the Plus series of the product along with the model of the unit. Opening the box will show the contents of the box nicely stacked and packed. There is a white color Styrofoam pad on the top. The DS218+ is placed inside a protective sheet. The far end of the inside has accessories and user manual placed inside. Before taking a closer look at the unit, let’s first discuss the NAS. What is NAS? NAS stands for Network Attached Storage. It is an intelligent and convenient way of adding storage solution with scalability in mind in your network. This network could be your home network or office one depending upon your requirement. You can store all your family and colleagues’ files on the NAS, from important documents to precious photos, music and video collections. By using a web browser or mobile apps, you can access files and use various services provided by the NAS via the Internet. The main feature of attaching a storage solution in the network is the centralized storage solution which can be accessed by anyone with rights within that network. For home users, this could mean storing their photos, videos, and documents in a central place from where anyone in the home can access the media. This becomes more important when size and no of digital files increases overtime particularly the 4k content which is known to take more space. Also, this centralized storage brings its own features of protection hence the safety of the data is guaranteed as well. Probably the next question on your mind would be one can save their digital content on cloud services like Google Drive, Dropbox to name a few. While you can definitely do that but there is a catch to it. The free account has limited storage capacity and to get more storage capacity, you would have to buy a subscription. Second, we are fully dependent on the third party for safe custody of our data. Another question that could come in one’s mind is the pen drives. One can use pen drives to share the data. Again, the size of the pen drives is a major constraint in addition to the hassle of copying data from one device and then downloading it on the other device. Also, these drives don’t have any automation hence you can’t get an automatic backup feature on them neither there is any off-site access feature. While USB flash drives are handy but in a longer run, this is not a convenient solution. I have two PCs at home, one laptop and three smartphones. My wife and I have to share multiple files with each other most of the time. In addition, she wants to save the pictures and videos on her mobile phone to the PC and wants to access them on her laptop as well. One can imagine the pain of copying these files from one PC to other and then to watch them on the TV is another consideration. I am only giving you one typical scenario. What NAS would do here is that it will sit between all these devices using my home network and will be visible to all these devices and user accounts. 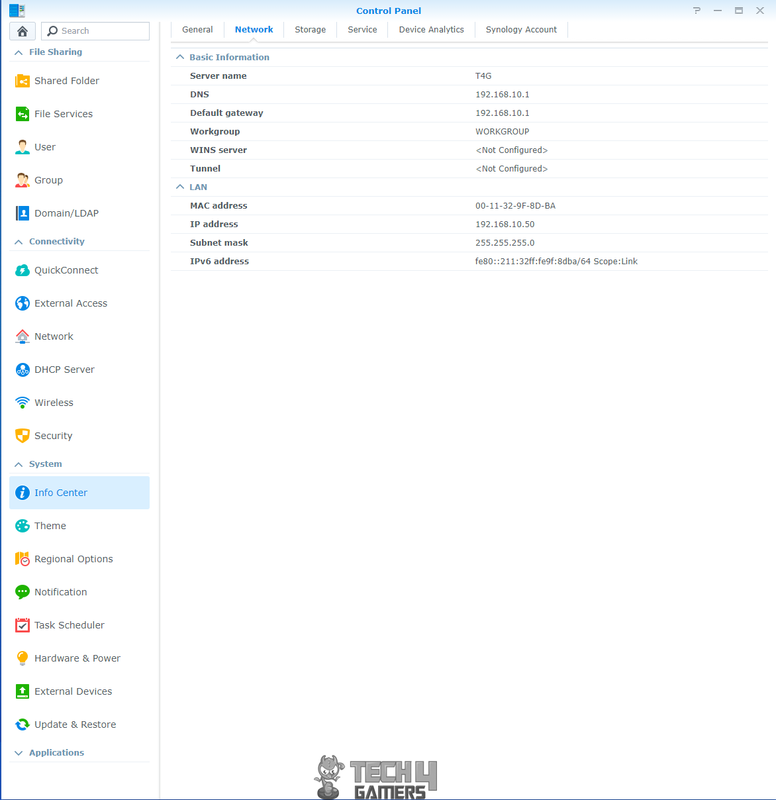 My wife is now sharing data from her smartphone to the Synology DS218+ as well as contents from her laptop. This data is visible to me as well. We can now stream the videos from our NAS box which is yet another feature in addition to basic storage solution and there are so many other features that the NAS offers. No longer I have to copy my files from one PC using a USB drive and pasting them on to the second PC as there is central storage which both PCs can access. 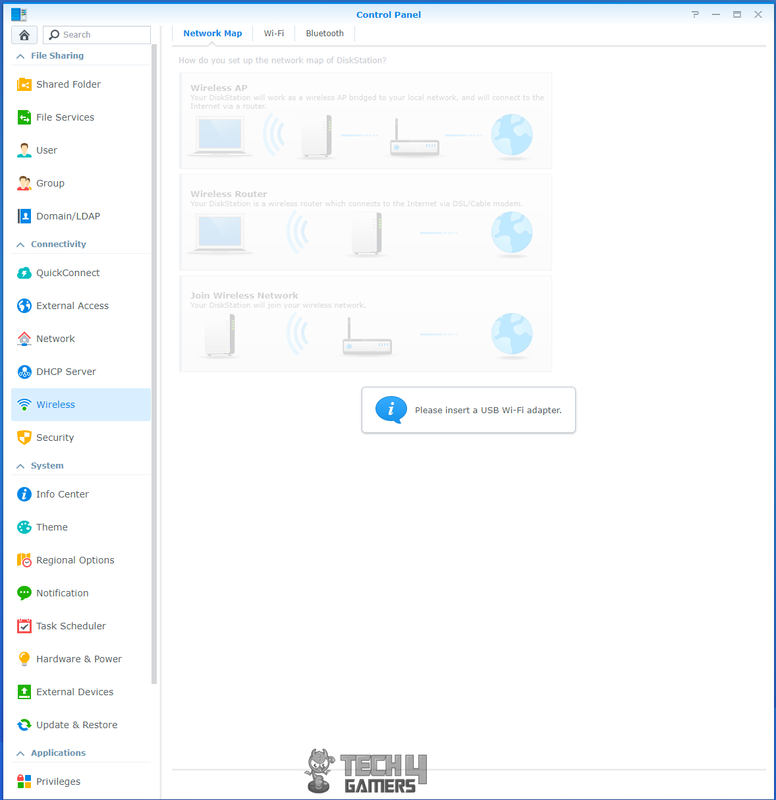 Drive allows your family to sync files between a centralized NAS and their PC/Mac. 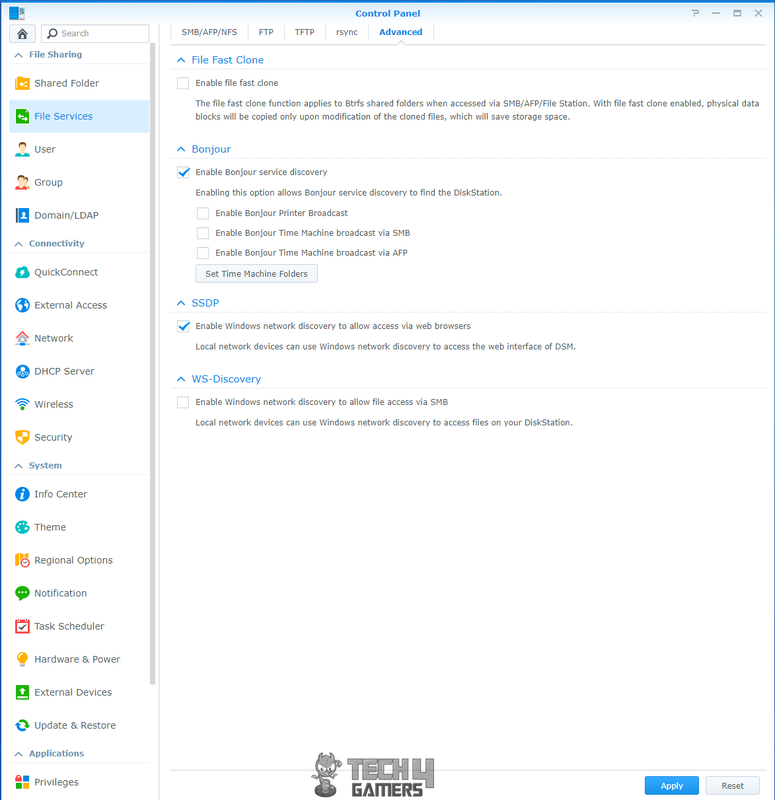 Drive supports restoring previous versions and sharing files directly from local computers to maximize efficiency. The further customization is provided using efficient packages like moments which helps in organizing your pictures with automatically backing them up from mobile devices. As I have mentioned above, you can use NAS to stream your videos as well. If you want to watch videos from computers, mobile devices, Apple TV, and Android TV without having to copy them between devices, Video Station streams videos to these devices. It also enriches your video collections with auto-downloaded posters, searches subtitles from the Internet, and lets you share videos with friends. You name it. The NAS solution from Synology is features rich that one can only realize after using it. So far, I have been discussing the benefits of NAS with respect to the home user. Definitely, NAS makes more sense when it comes to the businesses. For a small scale business set up, there is an ever growing need to safely place the continuously growing data in the central location which would allow the employees to back up their data, share their files and working on a single file at a time. NAS does all this without much need of any expertise. Many begin by storing files on a traditional file server, but when backup or collaboration issues arise, the server is quickly rendered inadequate. Others choose public cloud storage, which is convenient for collaboration but raises concerns about control of the data and costly subscription fees. NAS can simplify the work and solve the above issues. Most of all, it’s easy to use and cost-effective. The benefits of NAS for small office setup include setting up the NAS as a next-gen file server as an on-premises centralized storage device fulfilling the needs of modern file sharing and collaboration. 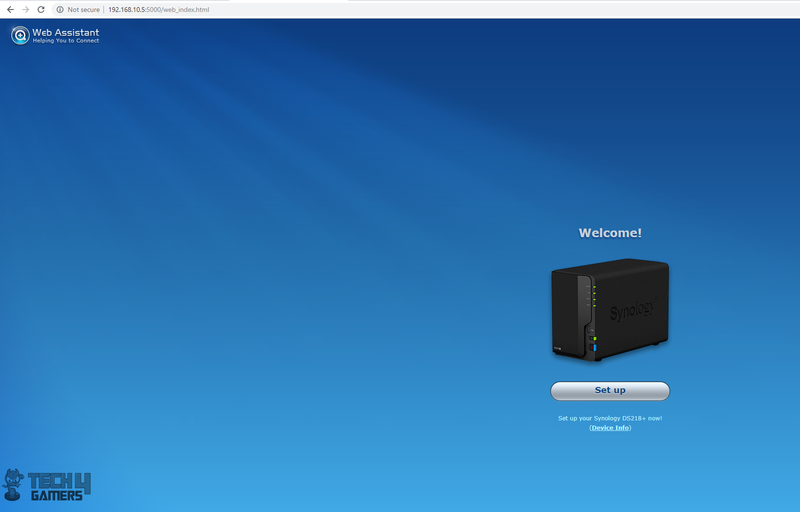 Synology Drive supports the SMB local access as well as the web portal and mobile app for remote access. By simply selecting a DSM account, you can share files internally with notifications. Another feature of the NAS is a centralized backup. Backing up data scattered across PCs, servers, and VMs is always challenging – remote offices and employees can make things even more complicated. 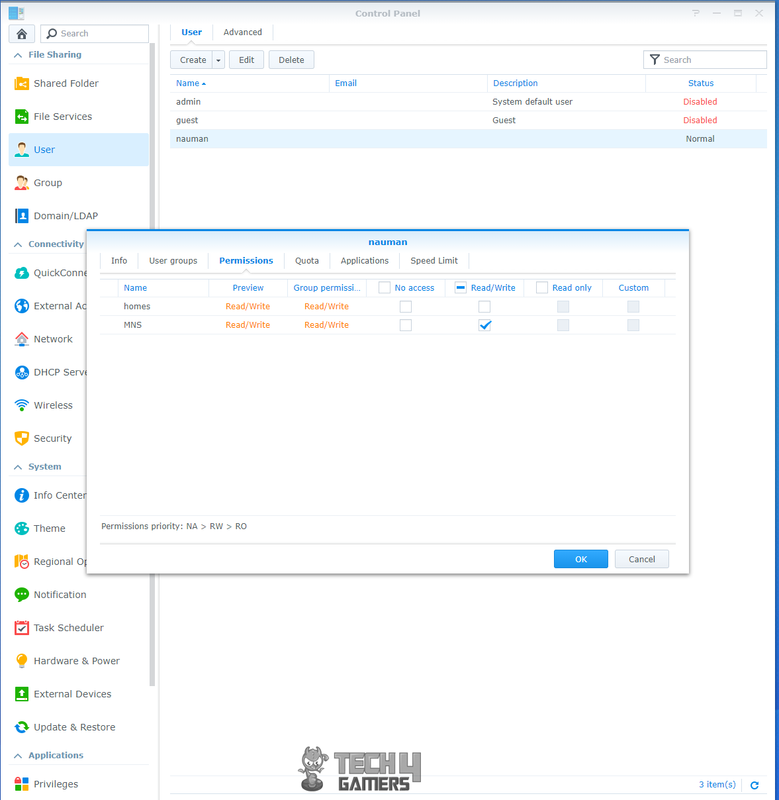 Active Backup for Business makes backup easy through a unified, intuitive console without license fees. Another feature is the service continuity. If you can’t tolerate outages such as server or storage failures, then you need a High Availability (HA) solution to ensure employee access to data and services at all times. Synology NAS can form an HA cluster. All services and data requests are handled by the active NAS and mirrored to the standby, passive NAS in real time. If the active NAS malfunctions, the passive unit will take over in seconds, meaning your employees can continue to access files and services. 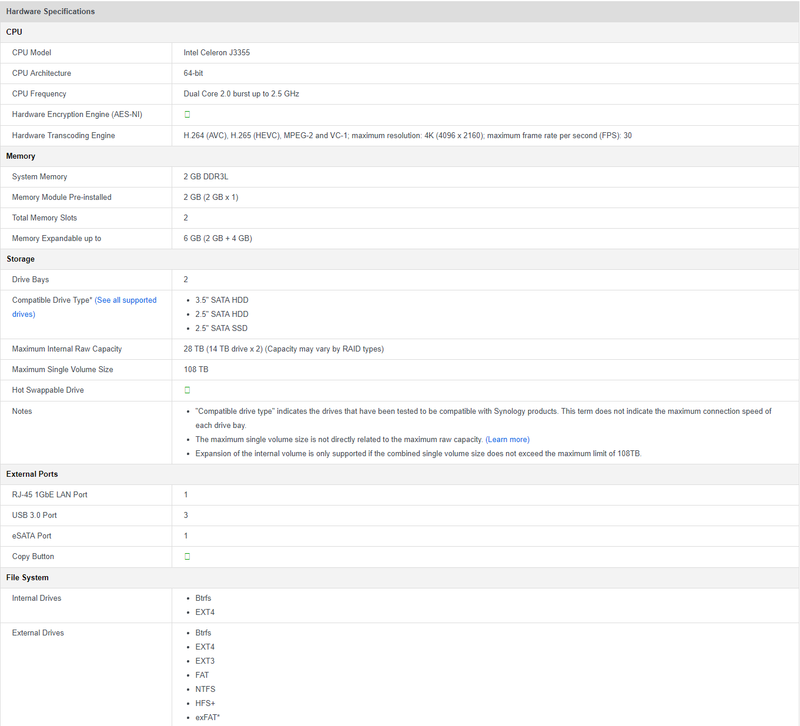 What is even more compelling case for Synology NAS is the ease with which you can configure the High Availablity setup. Another use scenario for the small business is the surveillance. Video surveillance can deter criminals and improve employees’ accountability. With Surveillance Station, you’ll get a wide array of security options to secure your investment and livelihood including the feature of checking the feed remotely and switching to the camera. The above was an attempt to touch the tip of the iceberg when it comes to understanding the NAS and so many features and functionality that it can bring at your doorstep. 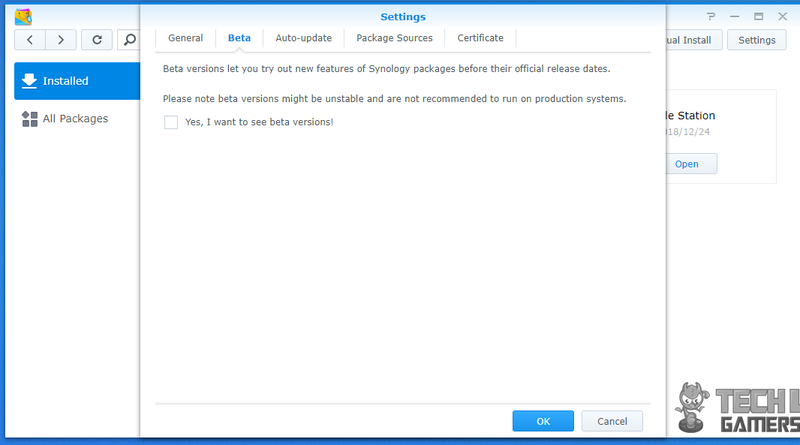 You can check the Synology website if you want to read more about the NAS features in detail. Now, it is time to take a closer look at the unit itself before discussing the DSM and few of the important packages. 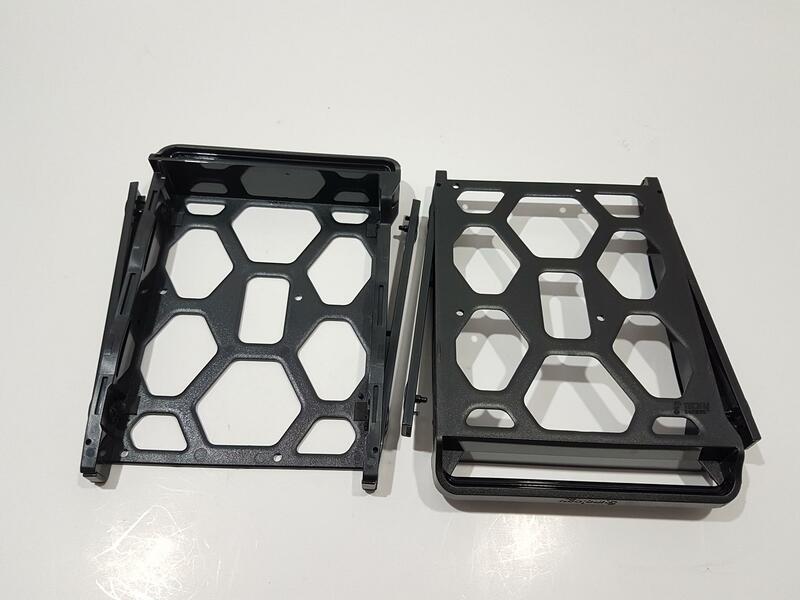 The enclosure is made of the plastic outer frame which is rugged. The dimension of the unit is 165x108x232.2mm (HxWxL). The power supply unit/adapter is rated for 60W using 100V to 240V AC. The power frequency is 50/60Hz using a single phase. The power consumption is 17.23W (Access) and 5.4W (HDD Hibernation). British Thermal Unit rating is 58.79 BTU/hr (Access) and 18.43 BTU/hr (HDD Hibernation). The operating temperature rating is 5°C to 40°C which is a question mark from my side as during summers my ambient temperature ranges from 45°C to 49°C without AC. Storage temperature rating is -20°C to 60°C. Relative humidity is rated between 5% to 95RH. The product carries EAC, VCCI, CCC, RCM, KC, FCC, CE, BSMI certifications and has 2 two years of warranty. Since it is a complete processing unit, we can think of it as a small size PC which in fact it indeed is. The CPU is Intel Celeron J3355 which is dual-core chip with a turbo boost of 2.5GHz. It has hardware encryption AES-NI engine and supports H.264 (AVC), H.265 (HEVC), MPEG-2, and VC-1 with a maximum resolution of 4k (4096×2160) with maximum FPS of 30. The system memory is 2GB DDR3L with one more slot at the user’s disposal to add up to 4GB more to make the total count of 6GB. The box is rated at 113 MB/s encrypted reading and 112 MB/s encrypted writing. The front side of the enclosure has a removable cover. On the right side, we have LED indicators. Starting from the top we have DiskStation Status LED. Next is the Network indicator LED. Next, we have two LEDs to indicate the status of both drives. Above the bottom, we have one USB 3.0 port followed by the USB copy button and Power on/off button. The front cover has two finishing. 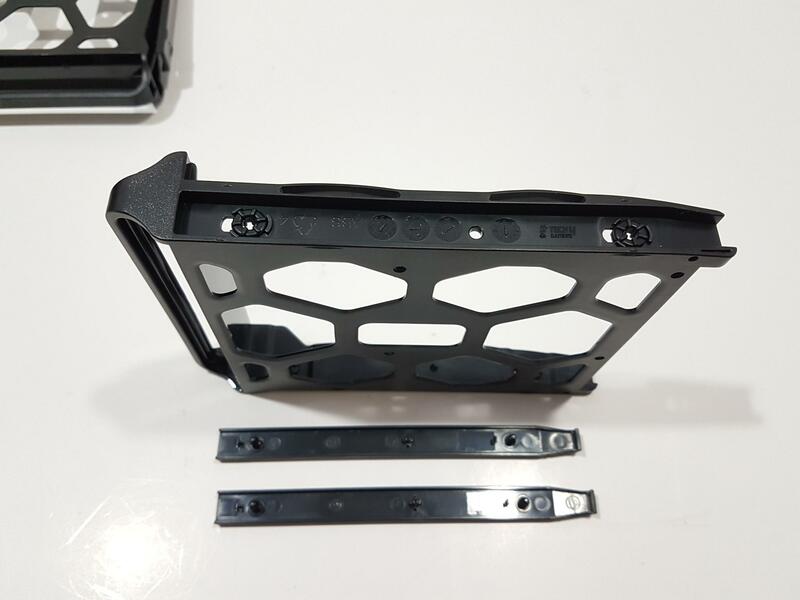 The main body is finished in matte black with a smooth surface which is fingerprint magnet. DS218+ is printed in the white color on its bottom left side. The left, right and bottom sides have a glossy black finish. Status, LAN, Disk 1, and Disk 2 are printed in the white color on the right glossy frame. These printouts directly face the LEDs on the main housing. This cover makes the appearance of the unit in an elegant and bold manner and adds much subtle look and feel. Another striking design element of this cover is its mounting mechanism. It is a smart design for sure. 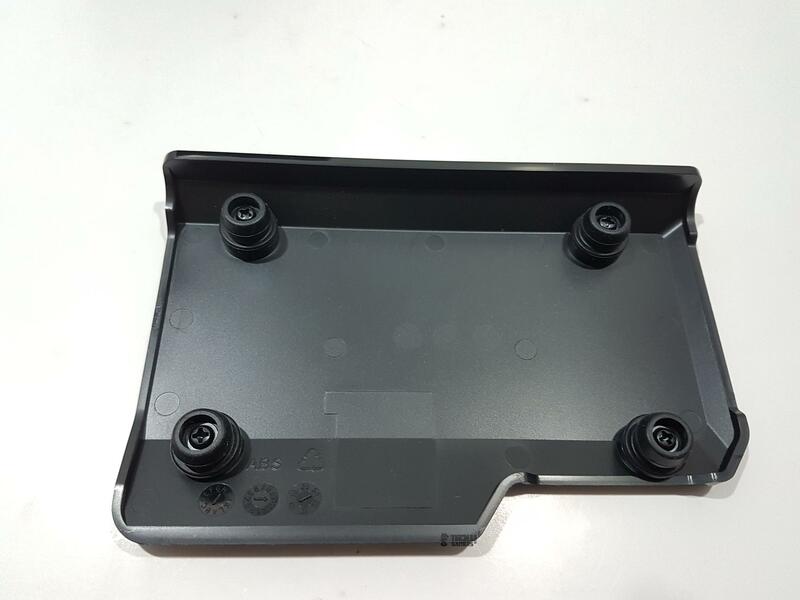 The back side of the cover has four mounting supports with rubber mounts secured to these supports using screws. Idea is that these rubber mounts go inside the unit and occupies the vacant slots to secure the cover on to the main housing. Hence there is no need for any magnetic mounting or screwed mounting. 10/10 to the Synology design team! 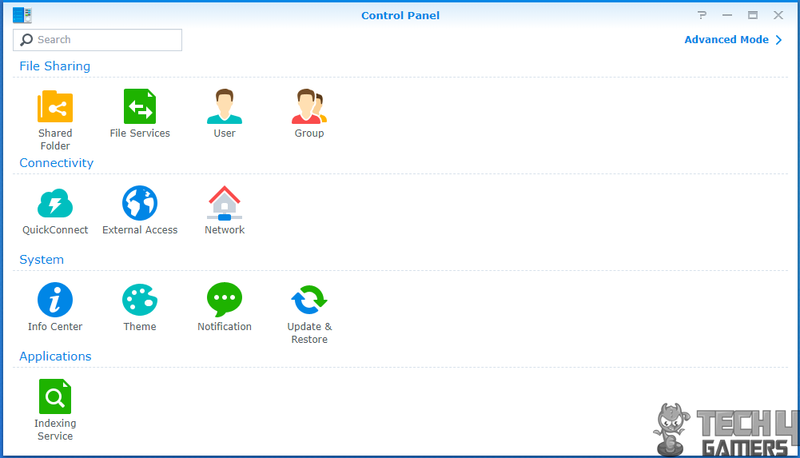 The right side of the unit has large size Synology text in a cutout manner with the lined pattern. This not only serves the cosmetic effect which looks damn good in person but also it has enabled their design team to ensure the ventilation for the disk drives. The right side has an angular or curvature design on the top frame as well. The overall design is coherent. 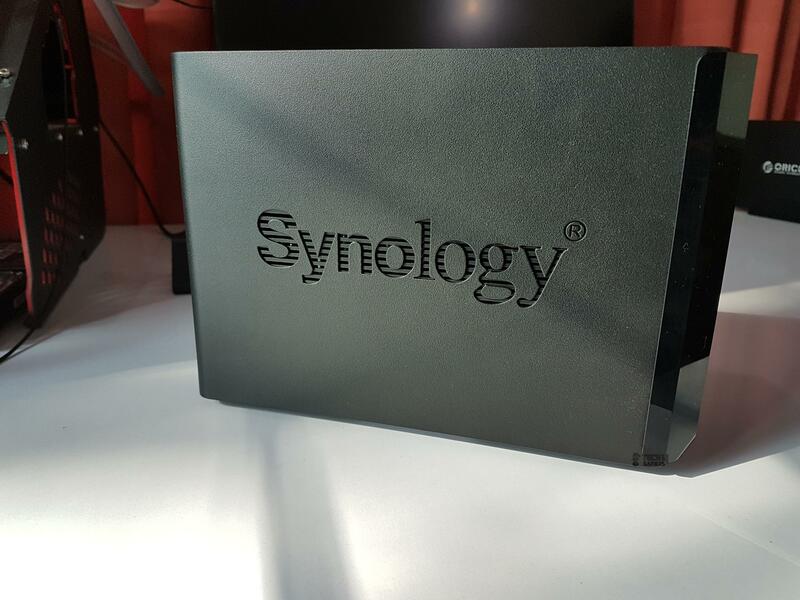 The left side of the unit has the same Synology patterned design except that there is no angular or rounded top frame side. A certain portion of the front cover extends over the left side. This glossy and matte combination stands the unit out and gives that stunning look to the unit. The default is the Quiet mode and it serves the purpose very well. During my testing when some 200GB of data was being copied to the drives with RAID on the maximum temperature on Disk 1 was 27°C and that of Disk 2 was 28°C. This was with the ambient temperature of 16°C and fan in the Quiet mode. The unit is not audible with the fan in quiet mode however, it makes certain hum noise of short pitch which is coming from the vibration of the disk. Although there are rubber mounts on the four feet of the unit, they seem to be inadequate to absorb the vibration sound. I simply lifted the unit up and the noise was a goner. I added a thick Styrofoam padding under the unit and the noise was gone like forever. This fan is rated at 19.3 dB(A). the fan grill is plane of the main housing. In terms of the connectivity, we have two USB 3.0 ports, one RJ 45 GbE LAN port, one Kensington lock, a reset button, and an eSATA port and the DC input. Synology has provided the power adapter and Rj 45 LAN cable which is Cat 5e rated. Taking the front cover off, we can see the two drive caddies. The top latches are on the housing side and they lock the caddies once they are slided. Push is printed on them. If you look carefully, you would see a white color dot and two white color dots on the top side of the main housing. The single dot shows the Disk 1 caddy and two dots show the Disk 2 caddy. In order to slide the caddies out, push the latches upward, this will release the lock. Simply pull them out. There are two arms per caddy with one on each side. Pull them to take them off. Place the HDD on the caddy and put the arms back on. They will lock the HDD to the caddy. The user can also screw the drive on to the caddy. Please, note that SSD needs to be mounted using the screws. In case you are wondering about the orientation of the drive on the caddy. It is simple. 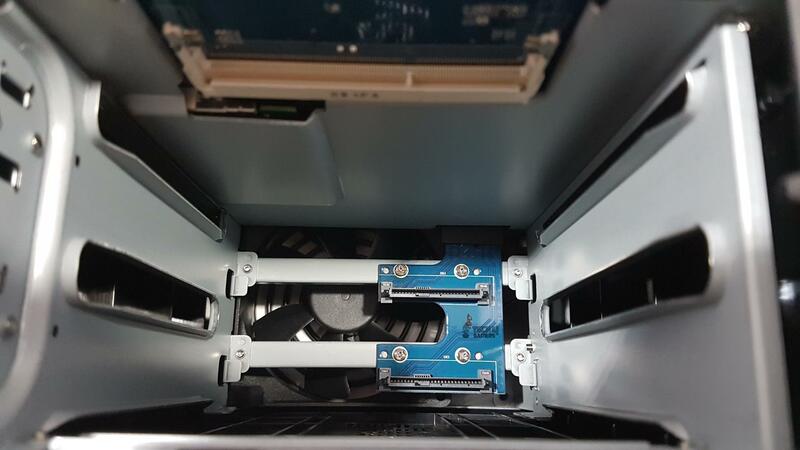 Make sure to face the SATA ports side on the drive facing the open end of the caddy i.e ports side on HDD should not face the handle side of the caddy. See the picture above for the reference. Remove the caddies to show the inside of the enclosure. We can see the steel frame. 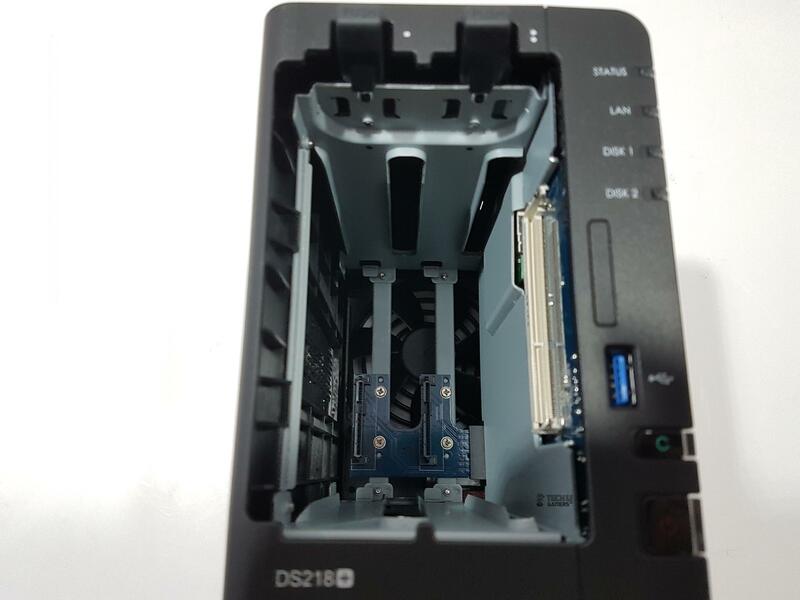 At the bottom, we can see two hot-swappable SATA ports on to which the drives dock. We can also see the front side of the 92mmx92mm fan. It has 7 impellers and is in black color. The PCB of the NAS box is in blue color. 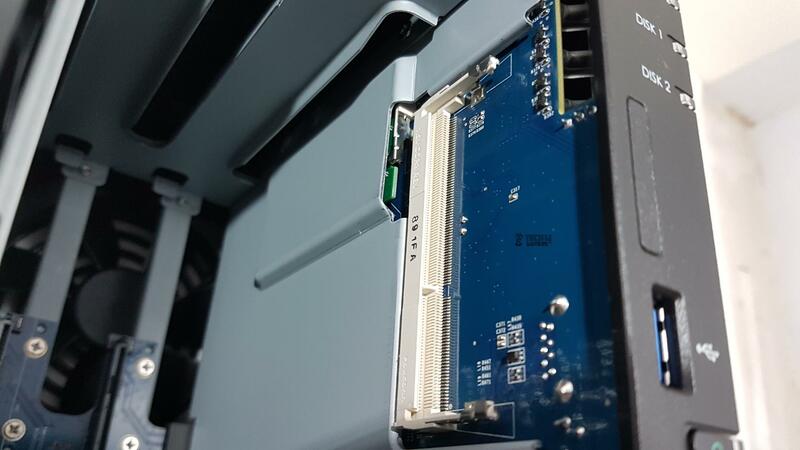 There is a second RAM slot which is located on the backside of the PCB to allow the user to install additional RAM should there be any need. It is DDR3L and compatible RAM should be using the same interface with preferably 1866MHz for parity. The underside of the unit has 7 cutouts on the front side and 4 cutouts on the bottom or right side of the unit. There are four feet with rubber mounts on them. They have sufficient height to give enough clearance to the unit from the surface for optimal ventilation. An information sticker is pasted as well. The top side of the unit is plain and solid surface without any branding or a particular design. Looking at the unit from the top side gives a clear idea of the gap between the front cover and the main housing. This is smart design as it will allow the unit to breathe some fresh air inside. 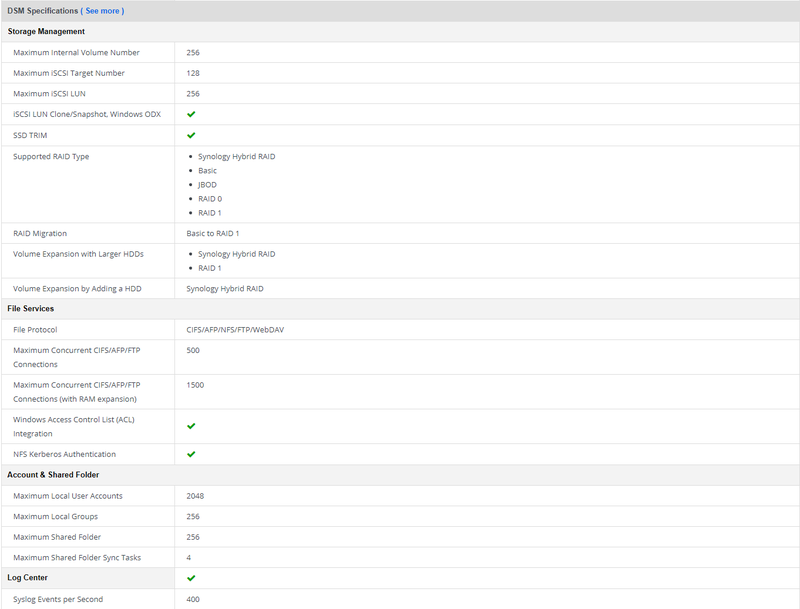 Setting up NAS on Synology DS218+ is pretty much straight forward task without any frills. Before setting up NAS there are a few things that you would need to take care of in advance. The LAN port on the Synology NS218+ is Gigabit one. The normal LAN ports on the ISP provided DSL modems/routers in a local area are not Gigabit rated. Though this does not mean you can’t connect the NAS box to these modems/routers. You can! But in order to fully utilize the high speed rated connectivity, it is better to use a medium with Gigabit ports. Here is what I have done for my configuration. I bought a Linksys 8-port Gigabit Ethernet switch. Though it is not a managed one I did not need a managed one to test the performance of the NAS box or that of the network as it is quite a basic network setup at my home. I have connected the switch to the PTCL (Local ISP) DSL Modem using Cat 6 Ethernet cable. Again I know it is useless as that modem does not have high-speed ports. But still, this cable would come in handy for future upgrades. Next, as my motherboard has Gigabit LAN port, I hooked it up with the switch using the Cat 6 Ethernet cable. In my last step, I have connected the Synology DS218+ to the Switch. In this way, the NAS box comes on the network with the Internet and at the same time got hooked up with any device on the network. You can simply connect it to the PTCL modem/router. Here the bottleneck if any would come from the ISP’s modem/router. Now, that you know the configuration, let’s proceed on how to set up the NAS box. Make sure that your entire network is powered up and online. 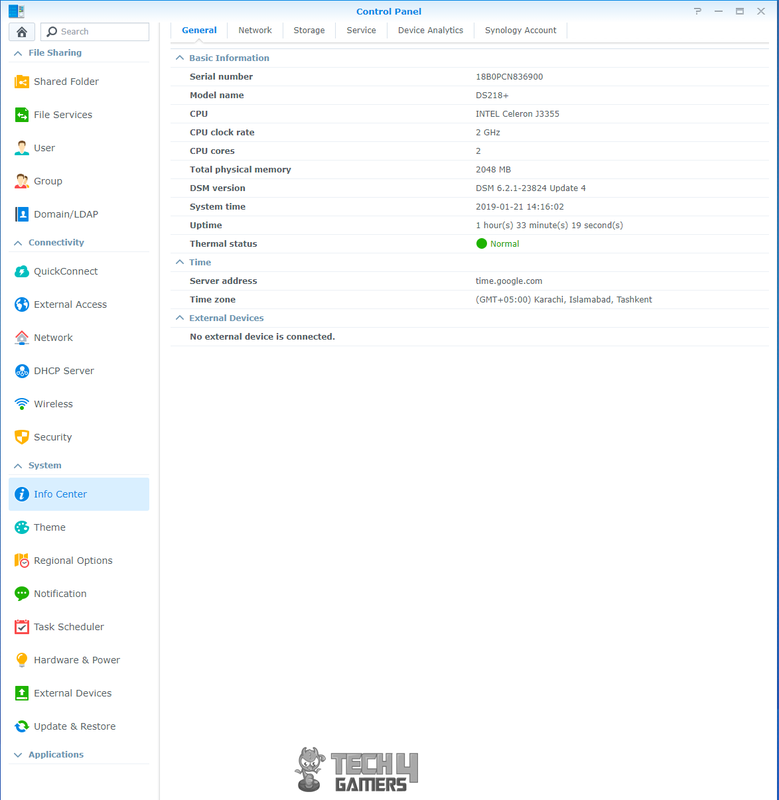 Open the browser window and type find.synology.com. I am using two Seagate IronWolf 2TB drives as this is a two-bay NAS box. This would make the website look for the local Synology on your network. If it finds any, it will show you the picture, model of the unit, IP and MAC addresses, and the status of the NAS. As can be seen, it is not installed yet. Click on the Connect button. 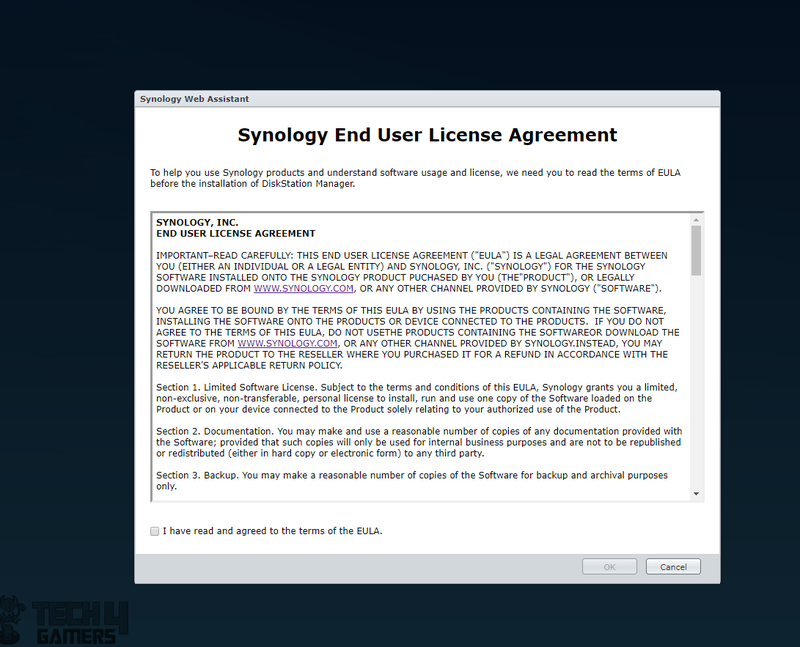 Next, you will be asked to agree to the End User License Agreement (EULA). I guess I don’t need to tell you what to do to proceed! Next, you will be welcomed and there will be a picture of your Synology NAS box. Hovering your mouse over the Device Info will show the summary like Device, Serial No, IP, MAC addresses. Click on Set up and rock and roll. Pay close attention to the address bar of your web browser as it will now be showing the local IP address like 192.168.10.5:5000/web_index.html. This is the default IP address picked up. You will be prompted to install DSM. 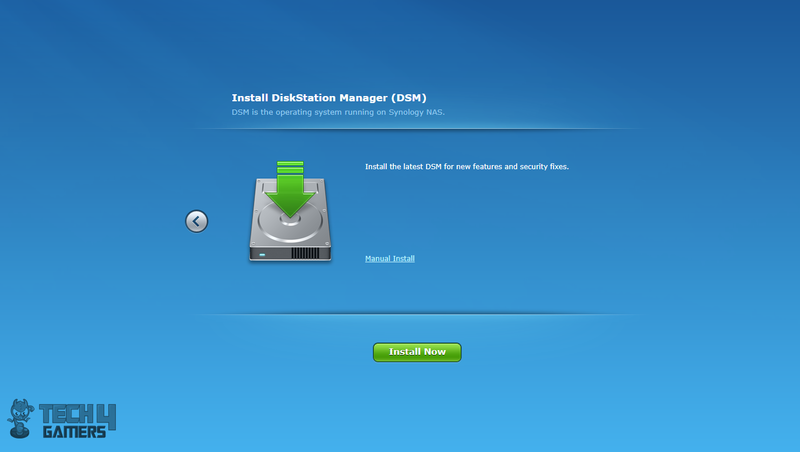 DSM is DiskStation Manager which is an OS name for the Synology NAS Boxes. I would suggest to do it now though you can do it manually as well. Next, a warning will be shown stating that all the data on the Disk 1 and 2 will be removed during installation. Check I understand that data will be lost and click on Ok which will now be enabled. This will begin the installation of the DSM on your NAS box. It could take some time before the installation is completed so sit back and relax. Once, the DSM is installed, you will be prompted to provide certain key parameters input. Pay close attention to these. The server name is not pre-assigned. You can input any name that would like to use. Similarly, input the user name and password. Password strength will be shown below the Password text boxes. Make sure to input a strong password. Click on Next. It will start preparing the storage space. On the next screen, you will be given options regarding the DSM update and maintenance. There are three options. One is to allow the updates to be installed automatically. The second option is to let it automatically update the important ones. The third option is to notify you about the available updates and to let you install them manually. I chose the third option though you could do any. There are two more options at the bottom. One is to run the S.M.A.R.T test the health of the drives periodically and the other option is to enabled bad sectors warning if the number of bad sectors crosses 50 counts. This is important and I would suggest checking both options. On the next screen, you will be prompted to setup QuickConnect. 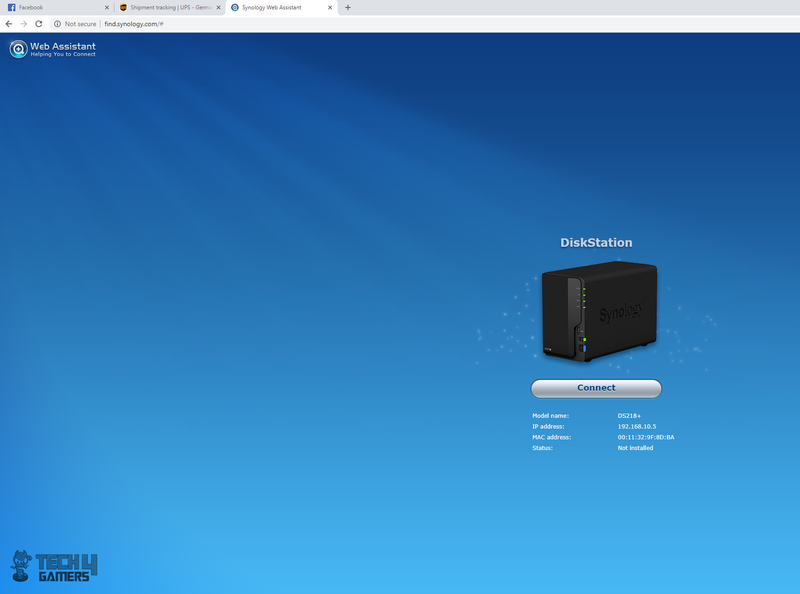 QuickConnect is one of the several methods to connect to your Synology NAS box on the internet even without port forwarding. This is an optional step and can be skipped though I created my QuickConnect ID right here. Enter the email address and the password. Select the correct Region if not already shown and enter a unique ID. Click on Next. 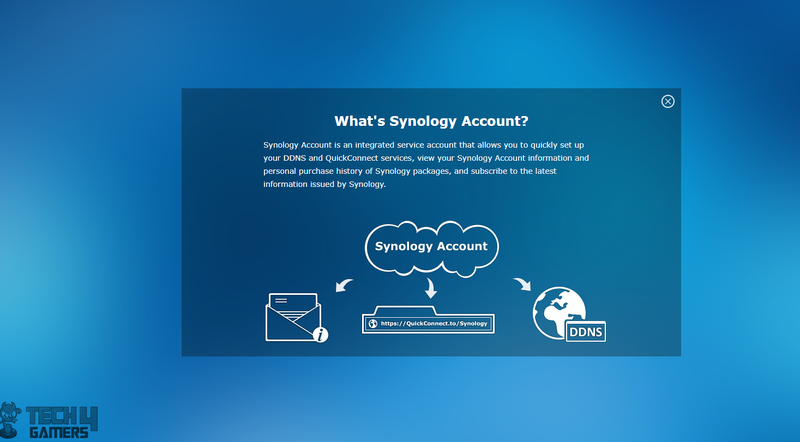 You will be shown an introduction to the Synology Account and its potential benefit. 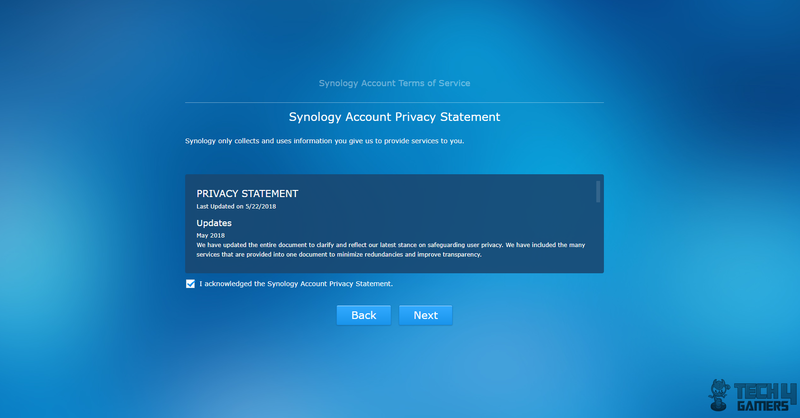 Next, you will be presented with the Synology Account Privacy Statement. Do the needful and click on Next. You will be confirmed that QuickConnect is ready and your QuickConnect address will be shown. Save the link and click on Next. 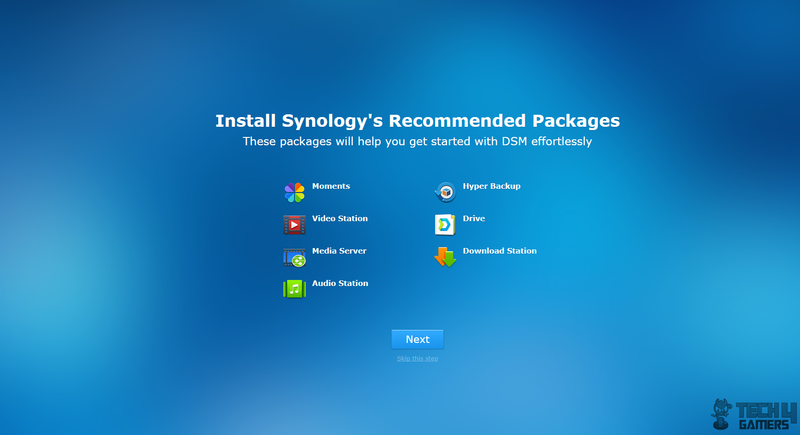 Next, you will be prompted to install the Synology’s recommended packages. You can skip this step and install them later on or do that right now. It depends upon your requirement from the NAS box. 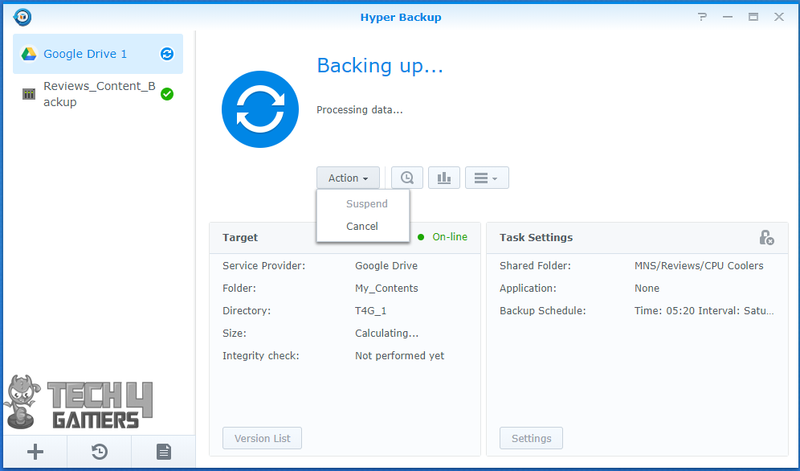 Hyper Backup is the one I would suggest to download and install for effortless data backup. Click Next. Next screen will state that you are all set and good to go. 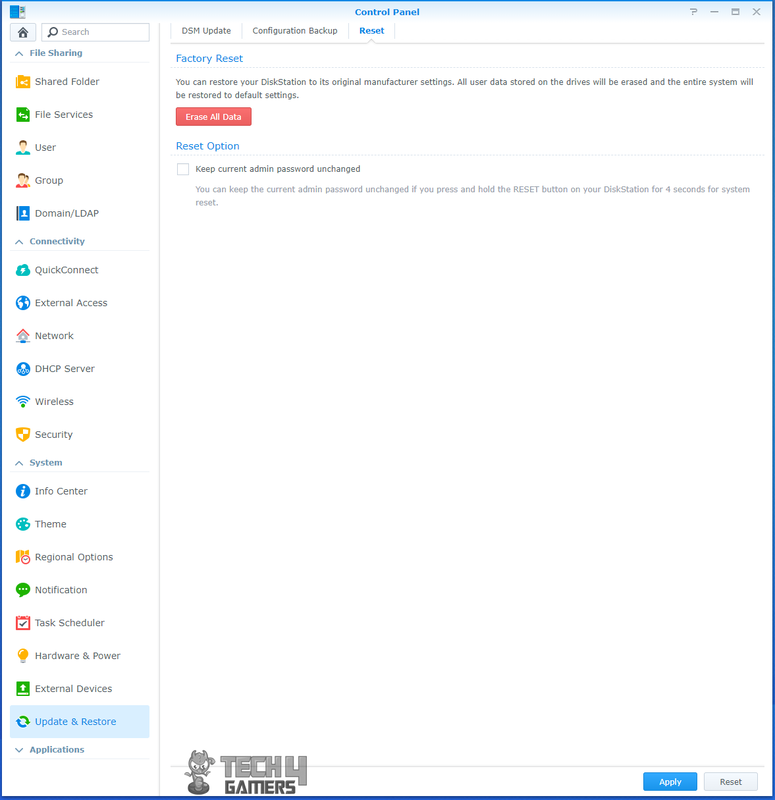 There is a checkbox with the statement to share your network’s location to locate it using find.synology.com. I did not check it. Click on Go to start a guided tour of DSM. Once all is done, you will find inside the DSM interface. That was all that needed to be done to set up your NAS box. It was an effortless and quite convenient so much so I would say it was a walk in the park. 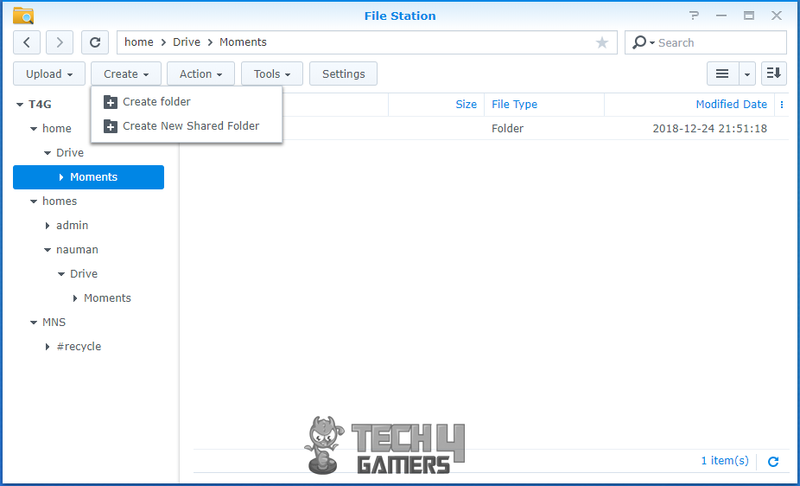 There is a package called File Station in DSM which is used for file sharing. DSM provides fast and secure ways to share your critical digital assets. 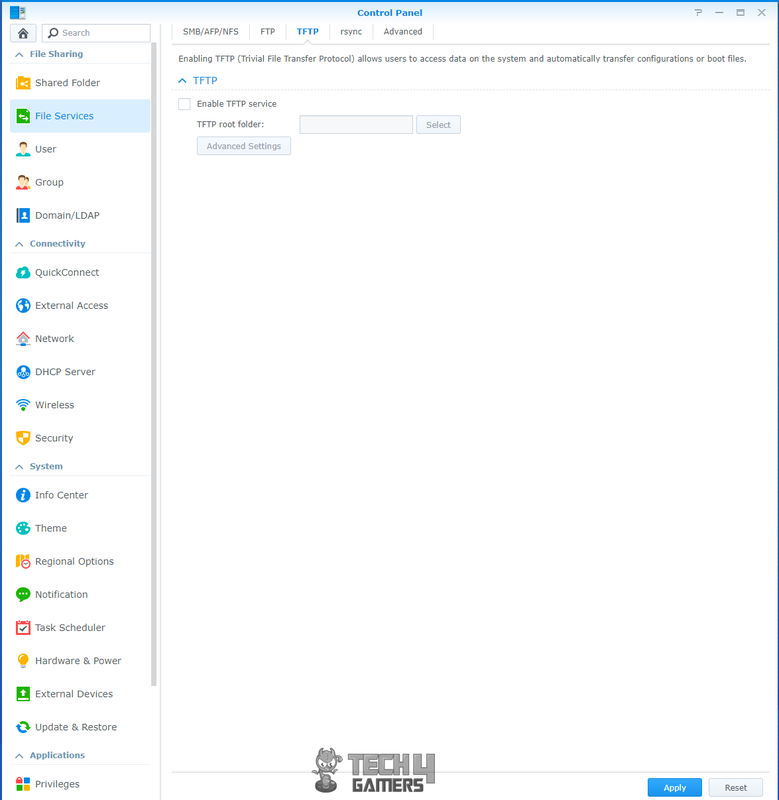 With File Station, you can share files on your Synology NAS to anyone, and customize access permissions for optimal security. File Station makes it easy to share files across multiple platforms — whether it’s Windows®, macOS®, and Linux® computers or mobile devices. The options are endless as the users are provided with an intuitive interface to easily create shareable links to their data. These links could be public meaning anyone with the link can access the connected data or customizable in which password protected links are generated. Anyone with link and password can access the data. Files and folders can be accessed and browsed using PC, MAC or digital devices without any hassle and user-friendly interface. 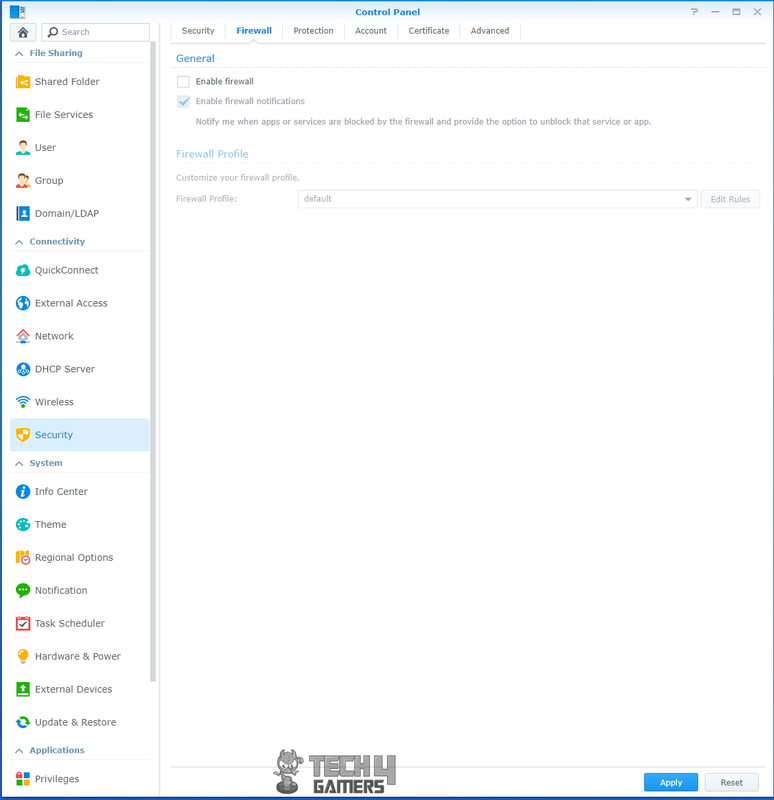 Centralized file access is also possible if the public cloud storage is mounted to the NAS. DSM comes with comprehensive support of networking protocols — FTP, SMB2, SMB3 (encrypted), AFP, NFS, and WebDAV — and provides seamless file sharing across Windows®, macOS®, and Linux® platforms. The Recycle Bin feature supported on AFP, SMB, File Station, and WebDAV, allows you to flexibly decide when to permanently remove the files, according to the different rules. All businesses nowadays face a high demand for fast, global, and stable file exchange with customers and work partners. DSM is your ideal file server solution that provides unified support of FTP, WebDAV, CalDAV, and CardDAV services. 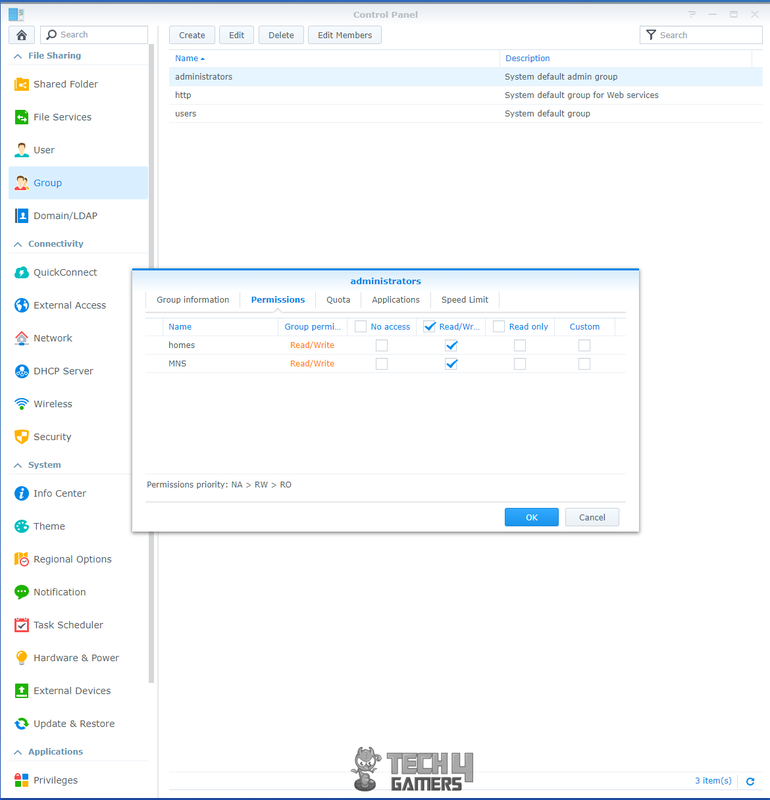 As the name indicates, files syncing allows the users to sync their files between the multiple computers, public clouds, servers. 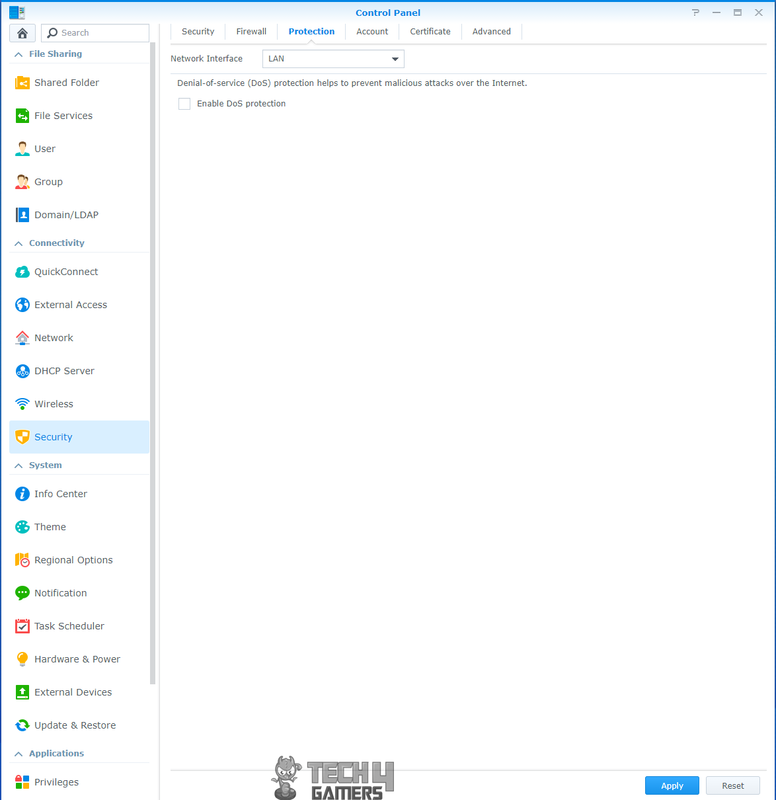 Synology Drive package sits at the core of this functionality and it allows unification of multiple file portals on Synology NAS and greatly simplifies data management by synchronizing files across various platforms. To fulfill your need for office collaboration, Drive also provides seamless sharing features to ensure that you do not lose important files. 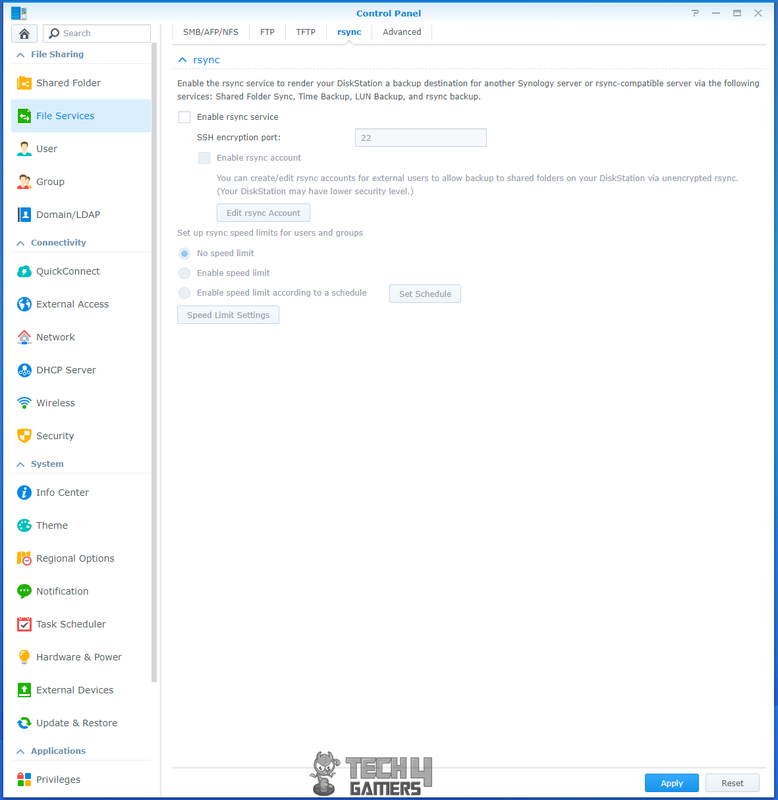 Utilizing the Team Folder feature in Synology Drive, all team members can manage files together without extra permission settings required. With its directory service integrated with an internal account system, Drive enables you to share files internally with your colleagues simply by selecting their accounts. External link sharing can be secured with unique passwords and validity periods. Supporting the powerful Synology Universal Search, Drive ensures that you can quickly find your files. 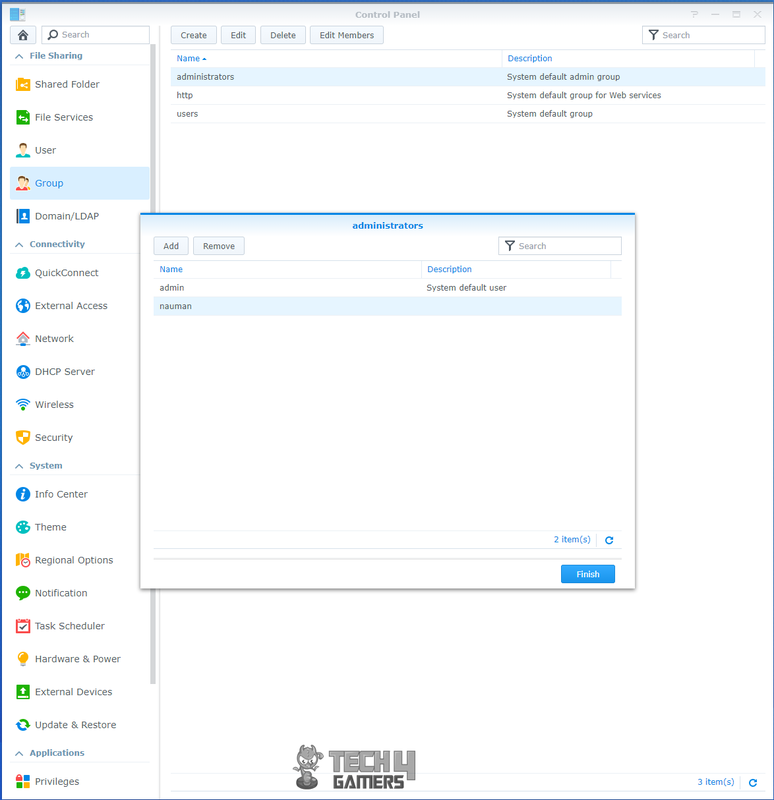 A desktop client for major platforms is also available for the users in addition to the web-based client. 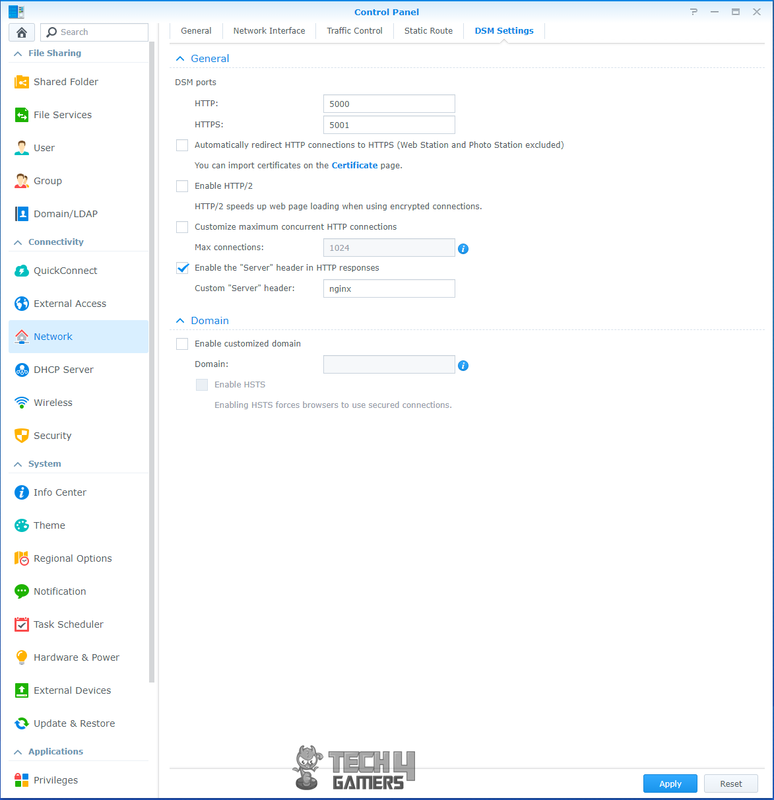 With Cloud Station Suite, every change made to your files will be automatically synced to other devices such as PCs, mobile devices, or another Synology NAS, while multiple data versions are retained so that you can recover files from a previous point-in-time when needed. 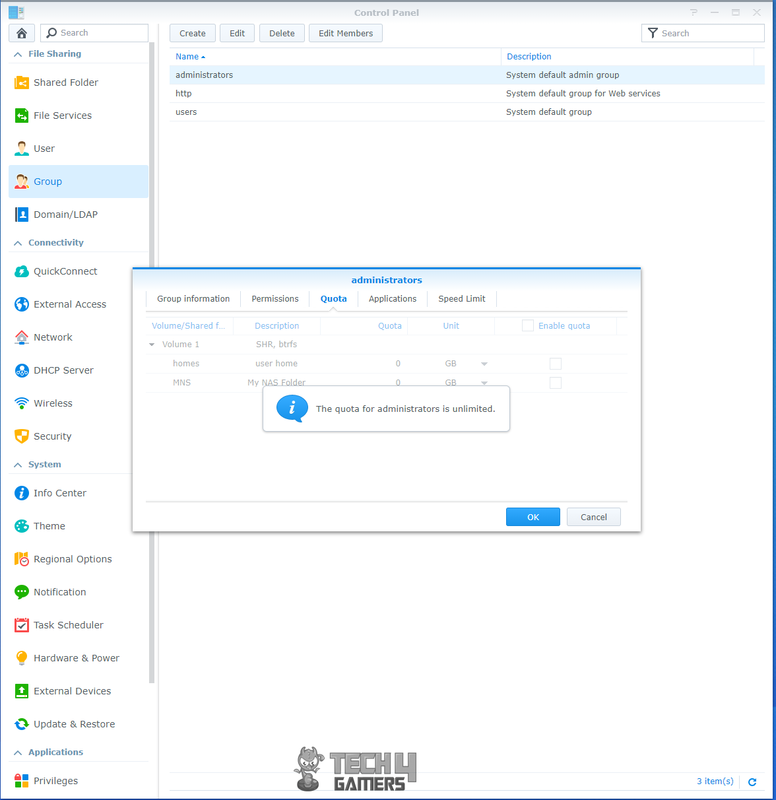 Cloud Station Suite features Selective Sync and offline editing, enabling files to seamlessly sync to different devices once the devices are connected to the Internet. Users can choose one-way or two-way synchronization according to their needs. 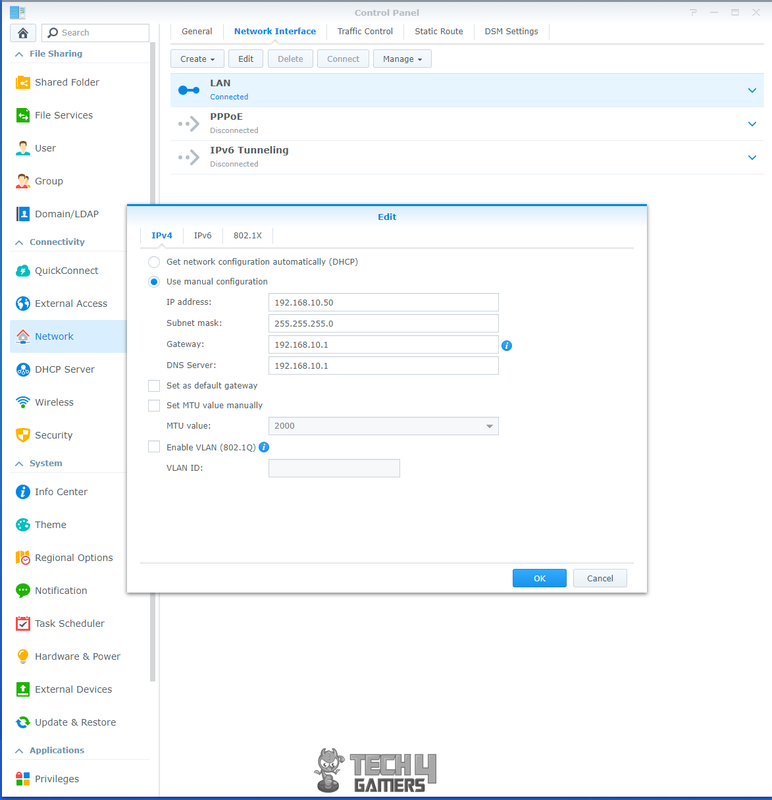 Cloud Sync enables you to seamlessly connect your local Synology NAS to public cloud services or on-premise storage through Amazon S3 API, OpenStack Swift, or WebDAV protocols. With Cloud Sync, you can enhance the collaboration when accessing between your local NAS and other remote cloud services, and can efficiently and easily back up data from or to public clouds. Cloud Station provides an optimized PC backup solution. 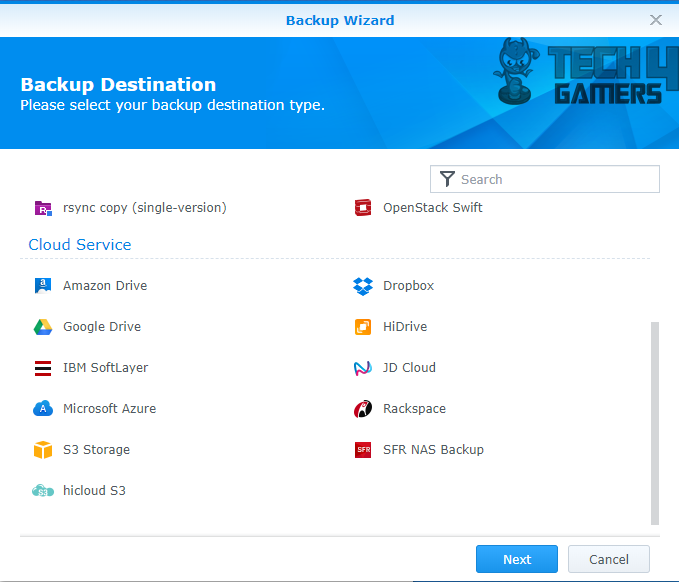 With the incremental backup technology, Cloud Station backs up only the modified files and divides them into even smaller parts, demanding significantly fewer system resources than traditional backup methods. Cloud Station Backup carries out the most complete backup tasks in real-time. When data is voluminous, a real-time backup prevents massive data loss due to unexpected disaster during backup cycles. 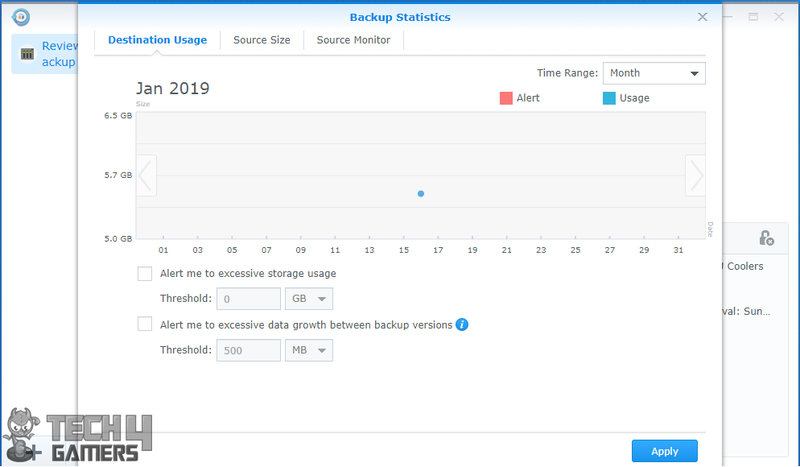 With Synology Active Backup for Business, IT can now manage and back up the data scattered on physical devices and virtual machines. Should a disaster strike, service can be instantly recovered on the production site or Synology NAS to help companies achieve business continuity. As cloud collaboration is becoming increasingly relied on in the workplace due to the flexibility and convenience it brings, businesses are also facing the need to own and protect the corporate data created and stored on cloud services. 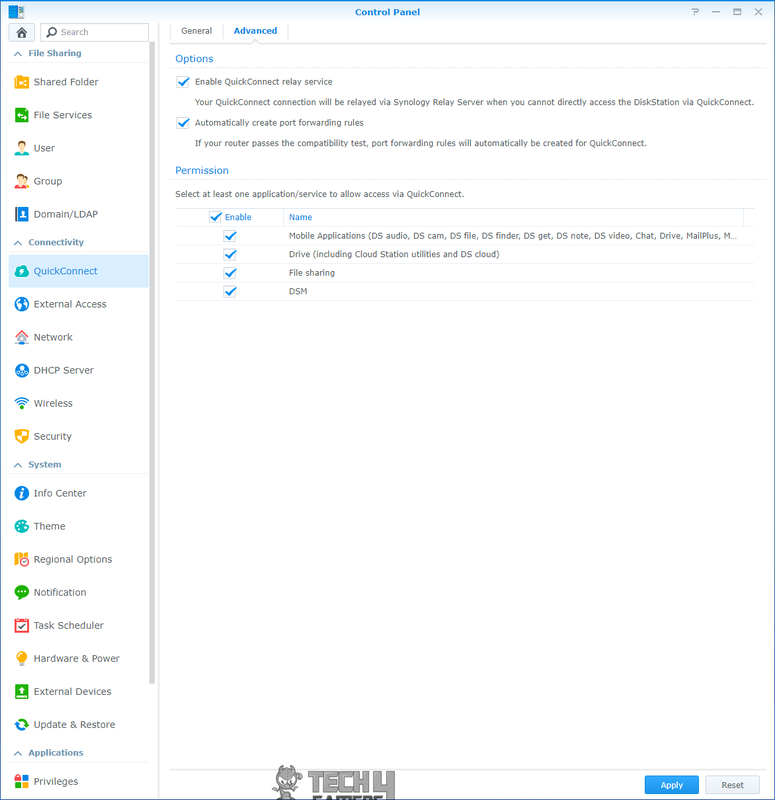 Hence, Active Backup for Office 365 is introduced to provide an on-premise backup solution to help prevent accidental events and to retain data for legal or litigation hold, thereby ensuring complete control over employee data. Active Backup for G Suite allows businesses to control and protect corporate data stored on G Suite. 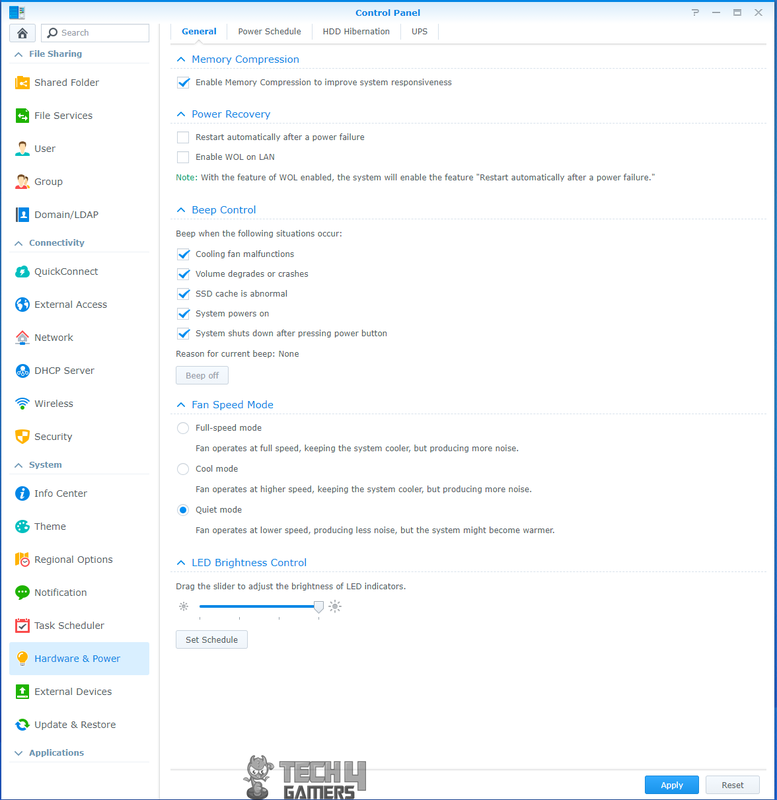 Mail, contacts, calendar, and Drive data can be backed up and centralized to Synology NAS, protecting against accidental events and satisfying data retention needs. NAS protection involves protecting your precious data against accidental deletion, disaster, and unexpected hardware failure. By leveraging the availability of Btrfs file system to more models, the Synology NAS includes state-of-the-art data snapshot technology, allowing for flexible point-in-time recovery of files, while only using a fraction of the storage space and computing resource compared to traditional backup. Recovery can be intuitively done with File Station or Windows File Explorer when the operators are with eligible privilege, without the intervention of system administrator. The snapshot calculator provides a transparent report on the storage space consumed by shared folder snapshots. IT administrators can utilize storage space more efficiently by deleting sizable snapshots. 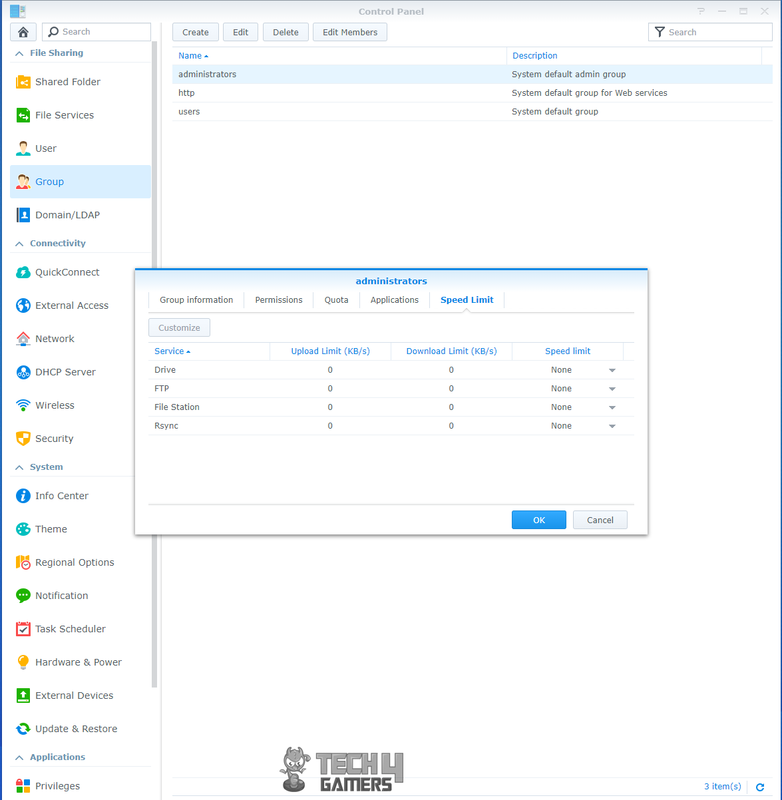 Synology High Availability (SHA) combines two Synology NAS servers into one high-availability cluster (or HA cluster). One server assumes the role of active server, while the other becomes a standby passive server. The active server handles all data requests and services, while everything is continuously replicated to the passive server. This provides complete hardware and data redundancy solution in case of unforeseen accidents. Ensuring data safety on your Synology NAS requires a reliable backup plan. With Hyper Backup, retrieving data from multiple recovery points with minimized storage consumption is never a big challenge. 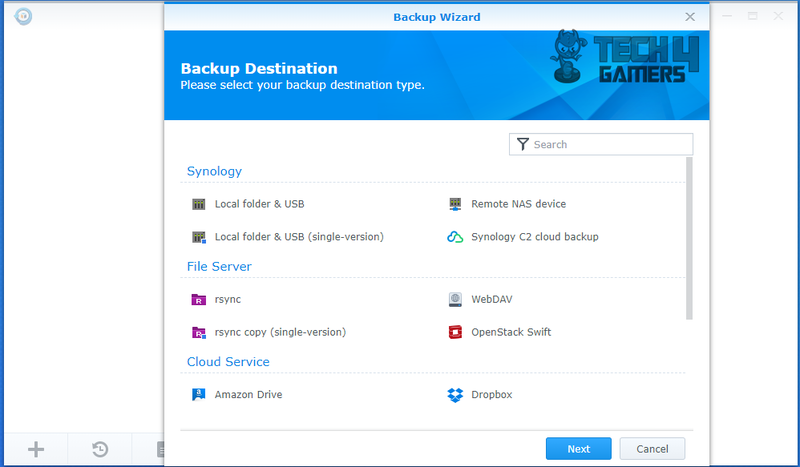 Your backup destination can be a local shared folder, an external device, another Synology NAS, an rsync server, or a public cloud service like Google Drive, Amazon Drive, Dropbox, Microsoft Azure, S3-compatible storage, and Synology C2, a cloud backup service dedicated to Synology users. Synology provides storage solutions for virtual environments of high performance and reliability. These solutions ensure the continuity and efficiency of business for large and demanding enterprises. 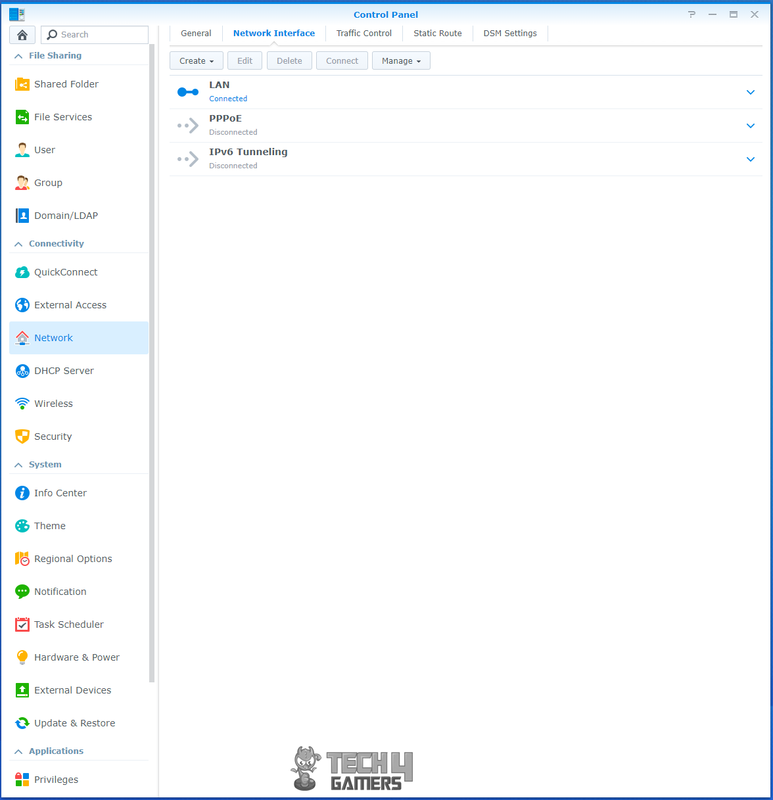 Synology storage solution supports most of the productivity-enhancing virtualization solutions, such as VMware® vSphere™, Microsoft® Hyper-V®, Citrix® XenServer™, and OpenStack Cinder. Virtual Machine Manager opens up abundant possibilities. 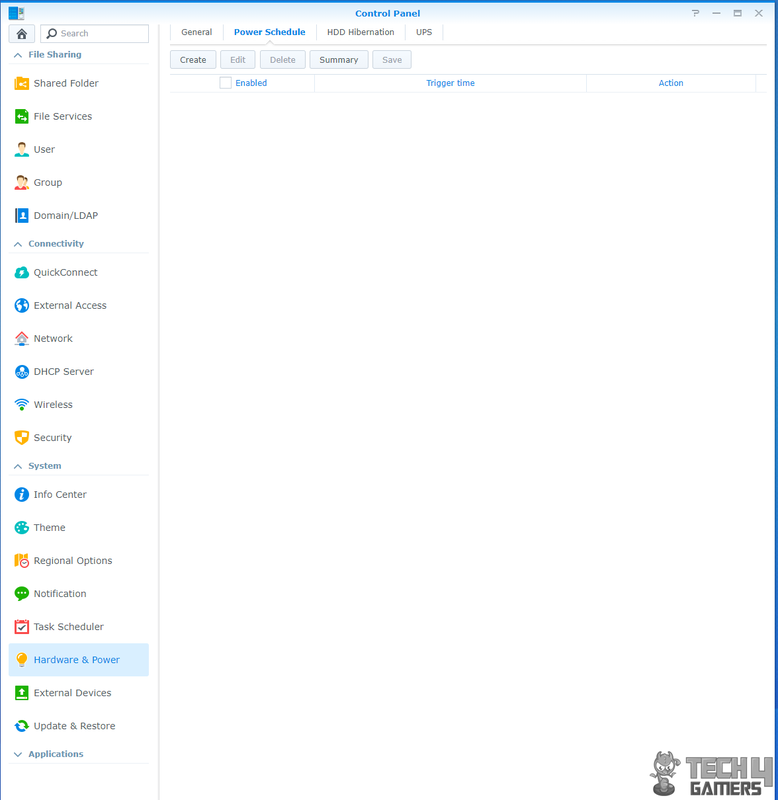 You can set up and run various virtual machines, including Windows, Linux, or Virtual DSM, on one Synology NAS. 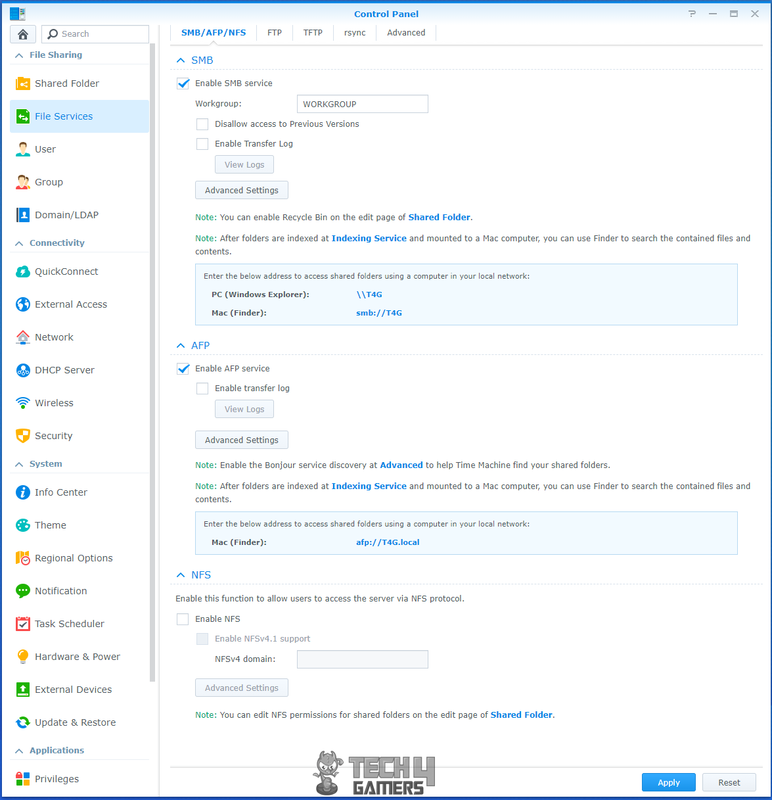 What’s more, you can also test a new software version in a sandbox environment, isolate your customers’ machines, or increase the flexibility of your server. Make sure to check the hardware’s ability to setup up required no of virtual machines. Docker is a lightweight virtualization application that gives you the ability to run thousands of containers created by developers from all over the world on DSM. The hugely popular built-in image repository, Docker Hub, allows you to find shared applications from other talented developers. As mentioned above, Drive is an extremely flexible yet critical package to boost productivity. 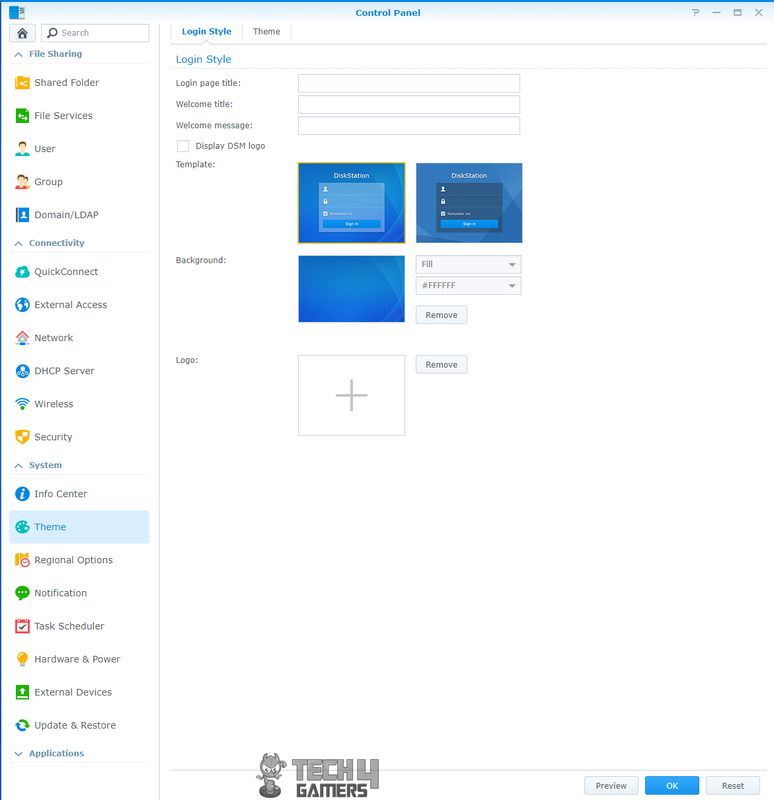 Synology Drive unifies multiple file portals on Synology NAS and greatly simplifies data management by synchronizing files across various platforms. To fulfill your need for office collaboration, Drive also provides seamless sharing features to ensure that you do not lose important files. How about setting up a mail server on NAS? The MailPlus suite allows your business to set up a secure, reliable, and private mail server while giving your employees a web-based client for managing emails and boosting productivity. Do you need a more effective way for your employees to communicate? Synology Chat reduces the time users spend on composing emails and optimizes companies’ internal communications. Chat is a messaging service that runs on Synology NAS and transforms the way you collaborate with colleagues. Do you need more flexibility in setting up alerts, agendas and what not? 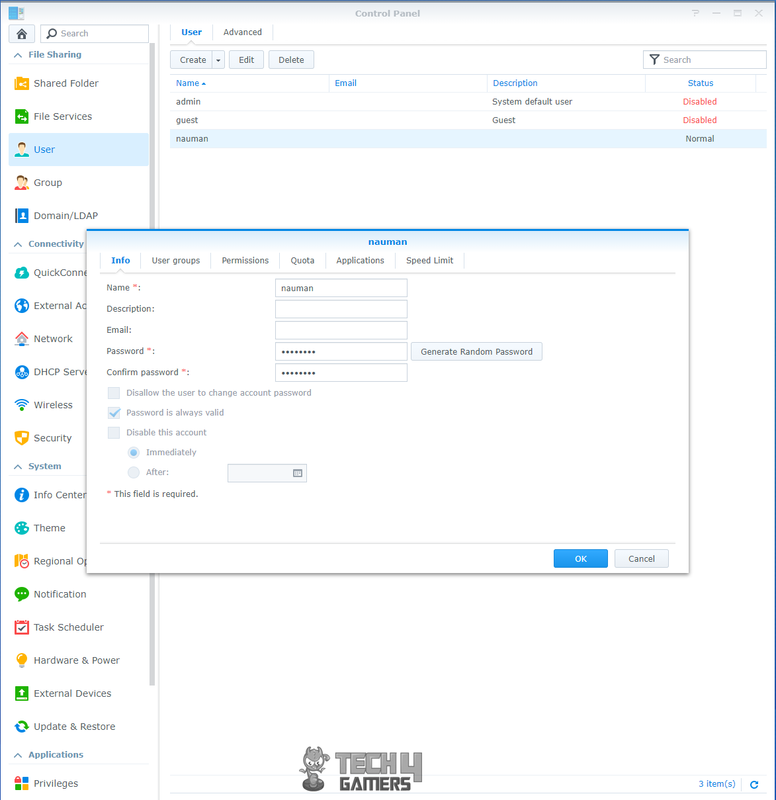 Calendar, running on Synology NAS, can ensure sensitive corporate information remains safely stored on company premises and allow users to share calendars and schedule meetings easily. Office solutions are definitely not forgotten by the Synology. The professional editing tools offered by Office help you create word documents, spreadsheets, and slides with ease and efficiency, while real-time synchronization and saving allow your team to achieve solid productivity and ensure data security at the same time. The important and the trivial, in one place yet everywhere. Note Station allows your precious ideas to be synced to all your devices with maximum privacy and security. Having any thoughts or feelings now? Just open the package, then create, edit and enjoy! While we are at it, why not provide more robust software packages for the users to perform no of functions on their stored data is the theme behind some powerful packages offered by the DSM. Enjoy high-quality playback, listen to radios, manage own music collection, create a personal playlist and share with friends on Audio Station and its mobile app DS audio everywhere. Your mobile device’s storage space will never be the limitation of your imagination again. Backup your photos captured in daily life securely in Moments and easily free up the spaces. All the photos will be shown in timeline mode just like what you’ve experienced on your own smartphone device. With the deep learning algorithm on Synology NAS, random photos are automatically grouped together according to similar faces, subjects, and places. Photo Station lets you efficiently manage photo storage, share and access files on the go, collect client feedback, and do a lot more. Video Station helps you manage all the movies, TV shows, and home videos on your Synology NAS. Moreover, it can stream videos to various devices — computers, smartphones, media players, and TVs — to provide you with non-stop, fun watching experience. With a wide range of cloud services, Synology allows DSM users to connect to their Synology NAS in the most intuitive, painless, and flexible way possible and protects their important data in a dedicated data center. 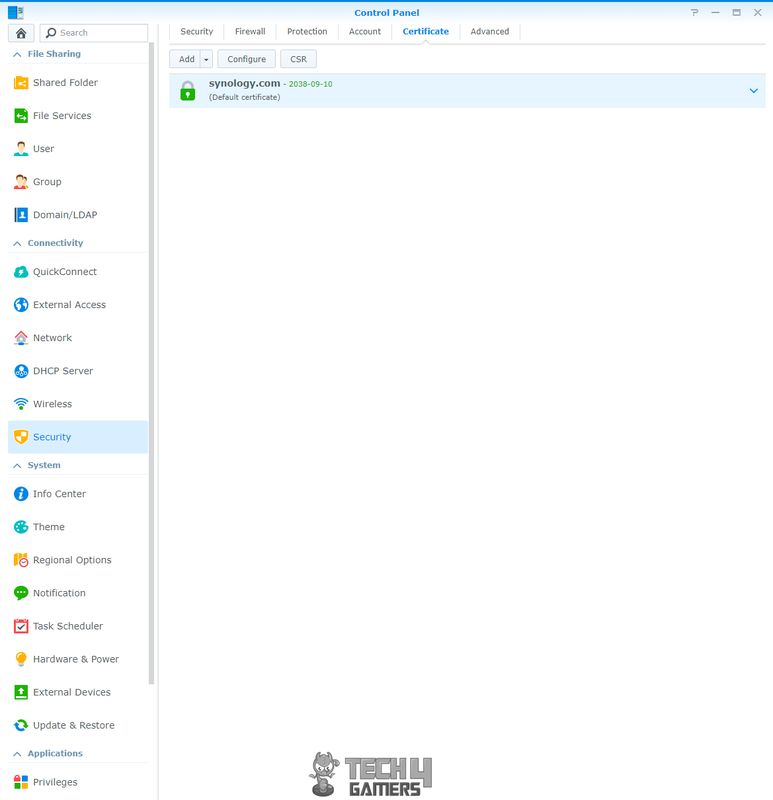 Based on Synology’s reliable global infrastructure and hole punching technology, QuickConnect allows you to access your Synology NAS anytime, anywhere, from any device and browser, without having to set up port forwarding and firewalls. With DDNS, you can access your NAS using the domain name you set, which is easier to remember compared with the IP address. Synology DDNS offers support for IPv4 and IPv6 in addition to the SSL certificates supported encryption that allow you to set up DDNS on your own. Dedicated to Synology’s customers, Synology Cloud² is a powerful public cloud storage service offering comprehensive plans for data availability on the cloud to maximize business continuity. Do you need full control of your NAS using intuitive and seamless software packages? Synology has already taken care of it. Control Panel combines the tools that you need to control every aspect of NAS. 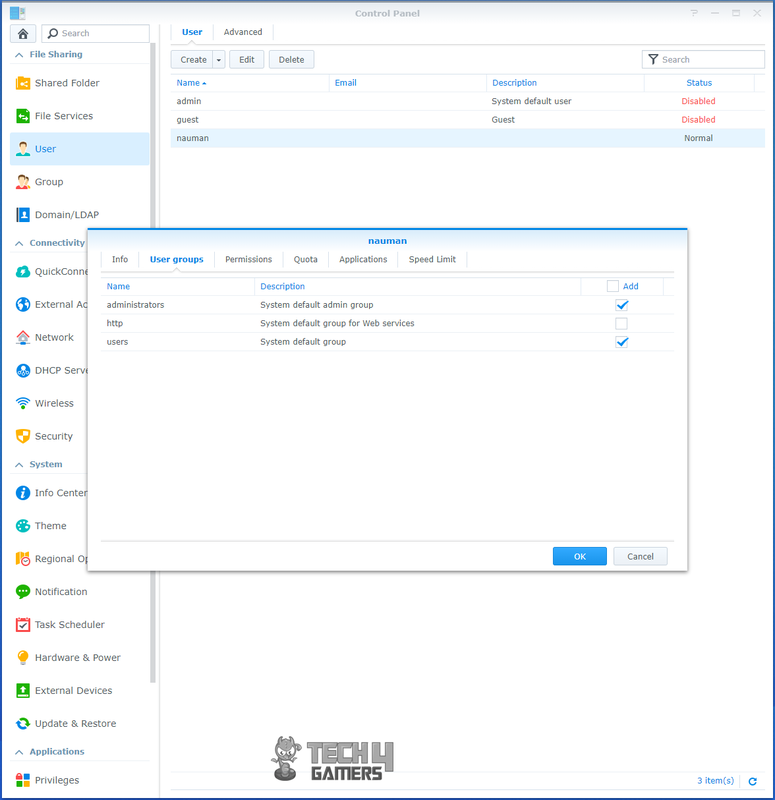 The native accounts management tools on DSM allow you to assign specific storage quotas, speed limits, and access privileges to individual users, or manage the accounts as groups. What’s more, each account can also share files with other DSM users and have their own private “Home” folder without worrying about prying eyes. In order to meet the demands for data integrity, faster performance, and cost-effective maintenance, DSM offers next-generation file system Btrfs with flexible RAID solutions such as SHR and RAID F1, delivering the best for your NAS. Businesses require a solution that offers reliable backup and prevents file corruption. The next-generation file system Btrfs stores two copies of critical metadata on a volume to ensure a high level of data integrity while taking advantage of flexible, efficient data protection and recovery tools. 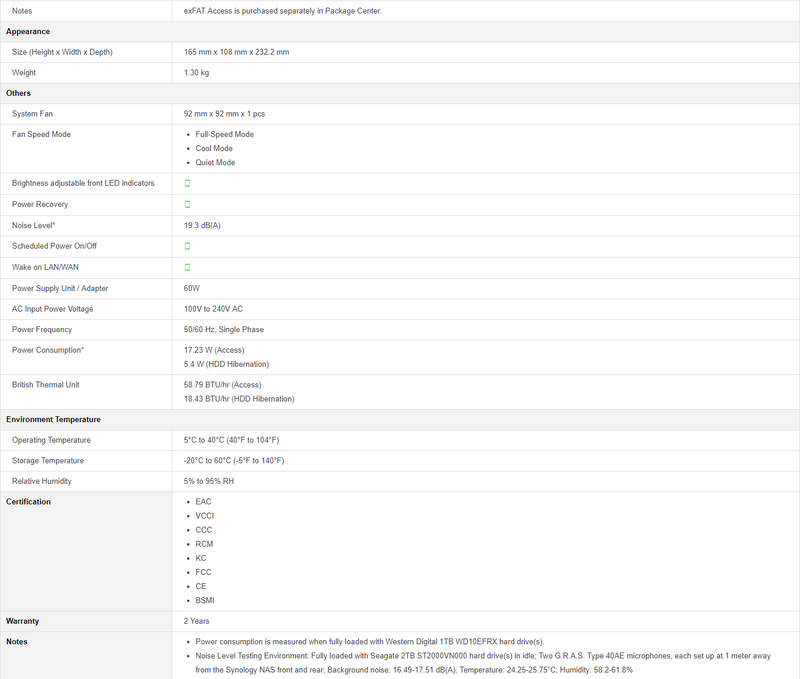 Btrfs is available on select Synology NAS models. When it comes to Network Management, DSM provides rich network management schemes and ensures security at the same time. DSM contains various solutions to best satisfy your Internet or private remote network access needs. For those who prefer to set up port-forwarding and do everything themselves, Synology provides free DDNS service with the support of both IPv4 and IPv6. Furthermore, with the integration of Let’s Encrypt, connecting to your Synology NAS by HTTPS protocol with a valid Certificate is better to secure and even without paying any extra fee. And if the convenience is what you are after then QuikConnect is your thing which seamlessly handles connectivity with your NAS from anywhere using a browser or mobile devices. 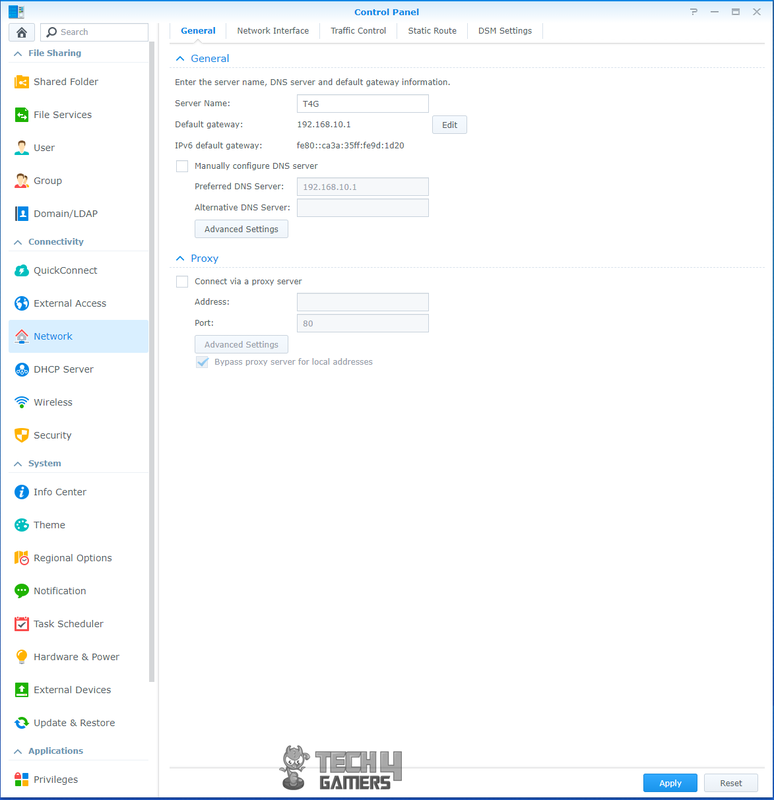 Active Directory Server is an efficient tool that allows your Synology NAS to become a domain controller. With Active Directory Server, IT administrators can manage accounts and install specific programs or system updates on all computers in the office. All these can be achieved just with a few clicks. 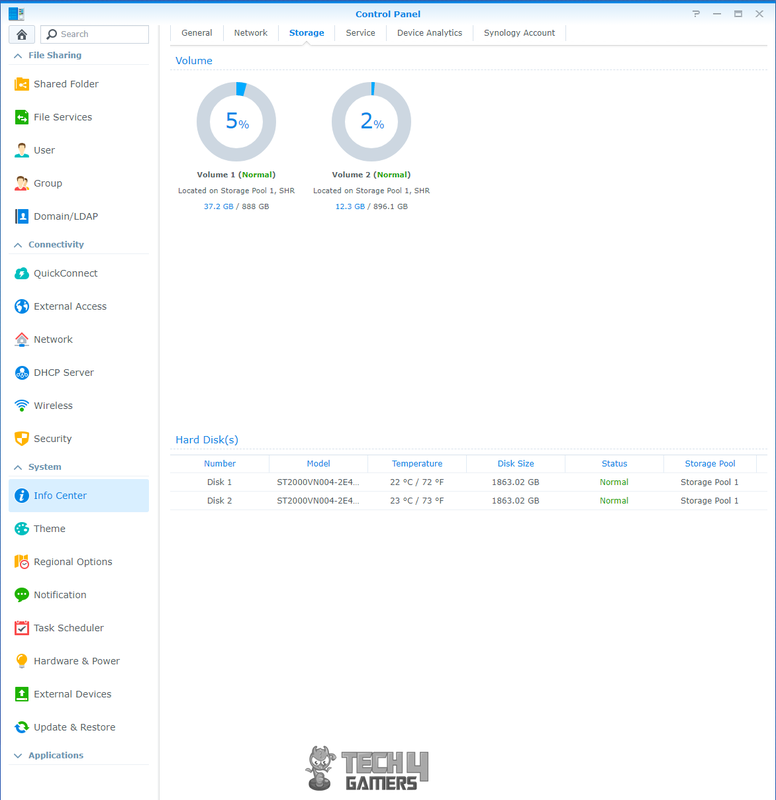 Manage and maintain your Synology NAS servers with high efficiency via CMS, Resource Monitor, Storage Analyzer, Storage Manager, Log Center, and other DSM built-in features. DSM has streamlined NAS management to the simplest form possible, but managing multiple DiskStations is still tedious work. 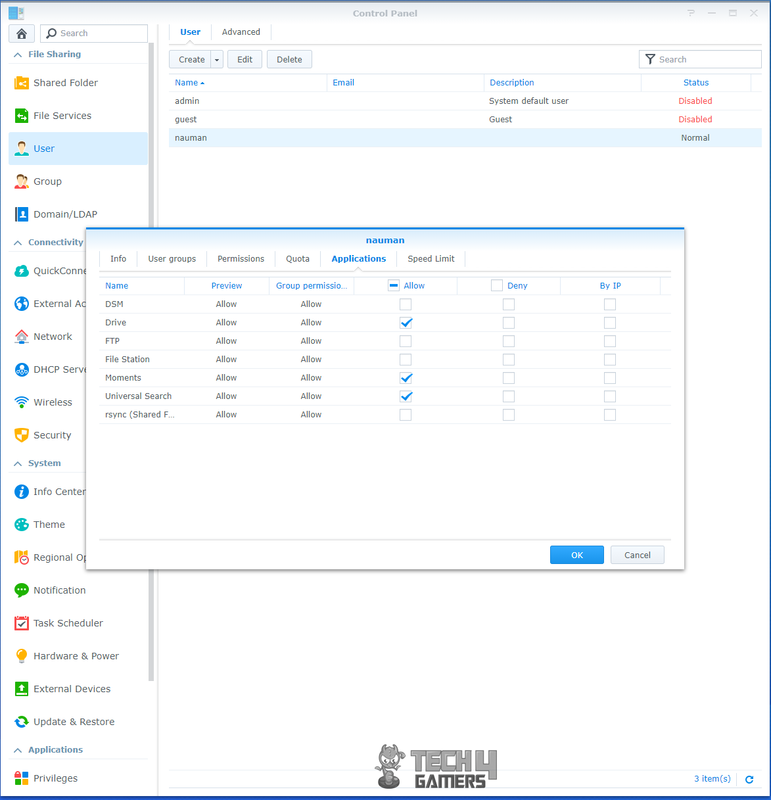 With CMS, you can easily manage multiple Synology products by automating tasks and setting up policies to apply settings to groups of servers, thus reducing the marginal cost of maintenance to the minimum. A single dashboard provides access to relevant information and settings of all DiskStations, so abnormal behavior is promptly noticed. All of the above is what can be leveraged using the DSM on your NAS. Let us take a real look at the DSM. DSM is built around Linux interface and it is intuitive and highly user-friendly. It is a web-based interface with everything under one window. The main interface has a desktop layout. On the top, we have a browser or window bar or even you can call it a taskbar. All the opened applications will have their instances pointed in this bar. The top left most icon is the Main Menu. Clicking it will show the menu. 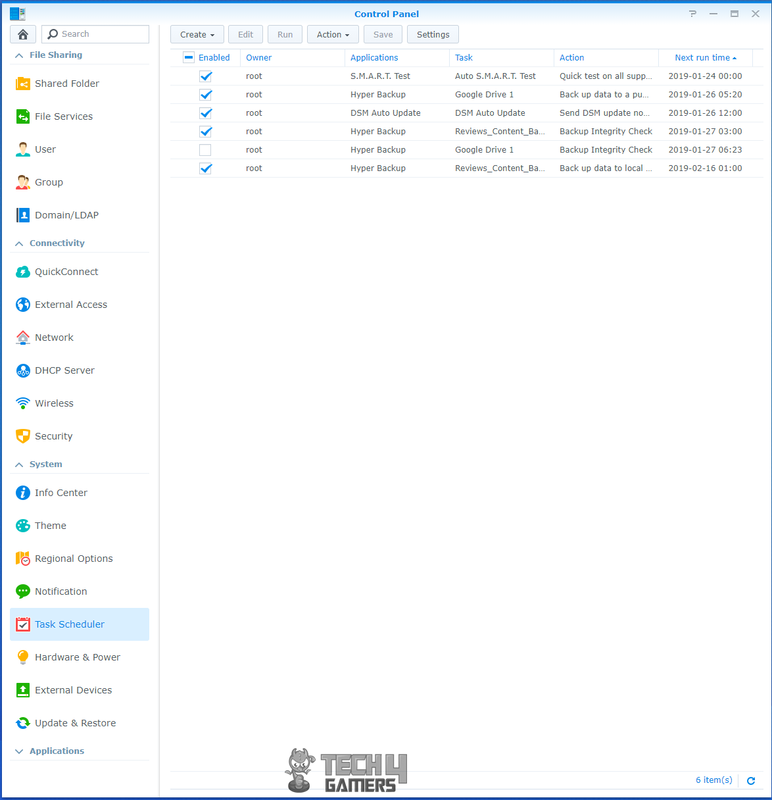 The main menu has Control Panel, File Station, DSM Help, EZ-Internet, Package Center, Resource Monitor, Storage Monitor, Universal Search, Log Center, Security Advisor, Support Center, iSCSI Manager shown by default. Installed packages will also be shown here. You can create a shortcut of the packages on the desktop much like how you do it in the Windows. There are more icons on the top right of the taskbar. The first one is the notifications. This is where your NAS notifications will be displayed. There will be a counter on this icon indicating that there are unread notifications. Next icon is the user icon. There are more options like accessing user account, restarting or shutting down the Dis Station. You will be asked for confirmation before either of these actions is taken. The user can log out from the current session as well. Next icon is for the Public Search which is a handy utility to search for your requisite data from the digital contents. The last icon is the Widgets. It is a toggle button to show/hide the widget bar. The widget is a smart implementation and I have huge praise to Synology for this idea and its implementation. The Widgets allow the summarized presentation of the critical DiskStation information. It can show the Disk drives information like volumes, used space, available space. Resource Monitor widget shows the hardware resources like CPU utilization, RAM utilization, and LAN speeds. System Health widget shows the server name, LAN, uptime along with the health status of the Disk Station. Connected users are also displayed. Remote user connections are shown as CIFS. The widget bar can be docked on the top right, bottom right, top left, bottom left positions. It can also be set to remain visible on top of other open windows. There are 4 icons on the desktop by default. Package Center is on the top. 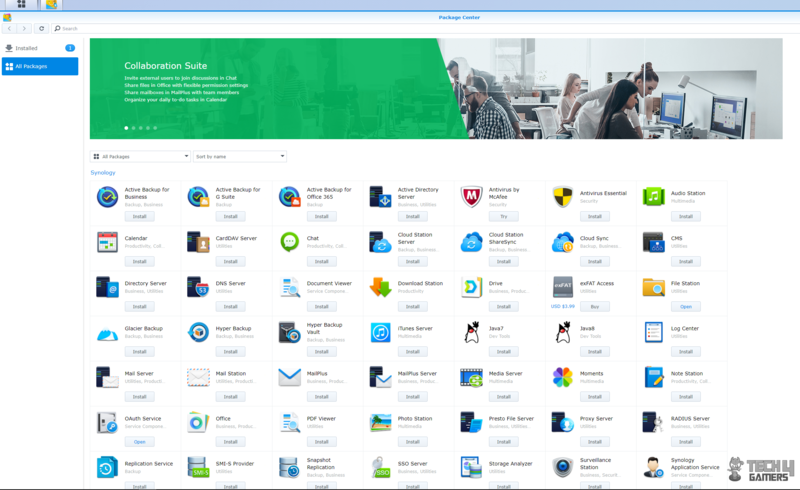 Package center is like a web store from where the Synology apps and third-party apps can be downloaded. For the first time, you will be presented with the Terms of Service. 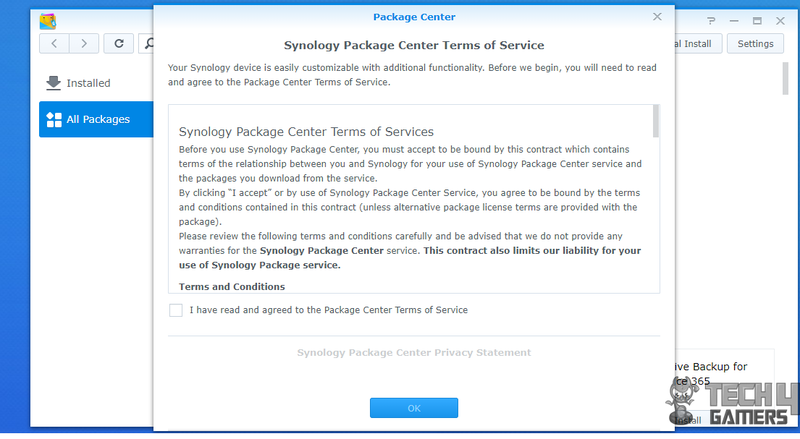 Check the box to agree with the terms and click on Ok.
All packages will show the grid layout of the packages listing on the Synology website. You can choose the package which you need and click on install. Some packages would need additional packages or services and you will be prompted to download/install them. Click ok for them. The user can search for the required package as the list is quite long. The user can also choose to manually install the package. Installed packages will show the listing of the packages that have been downloaded and installed. 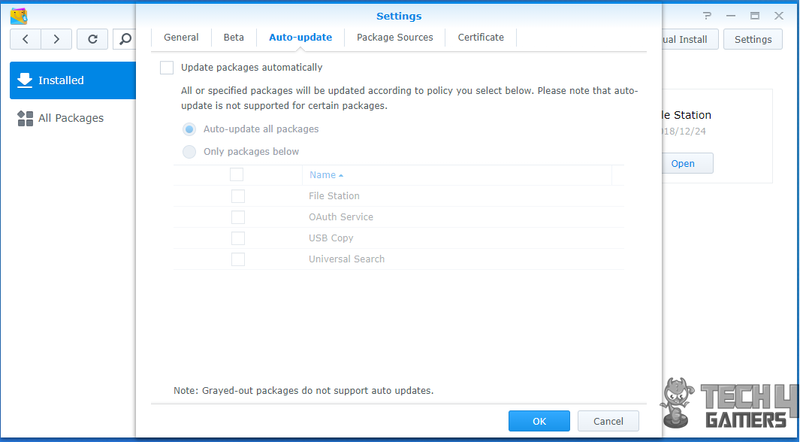 There is an option to update any given package or all of the installed packages. Let’s take a look at the settings of the Package Center. The user can enable notifications via desktop and email. 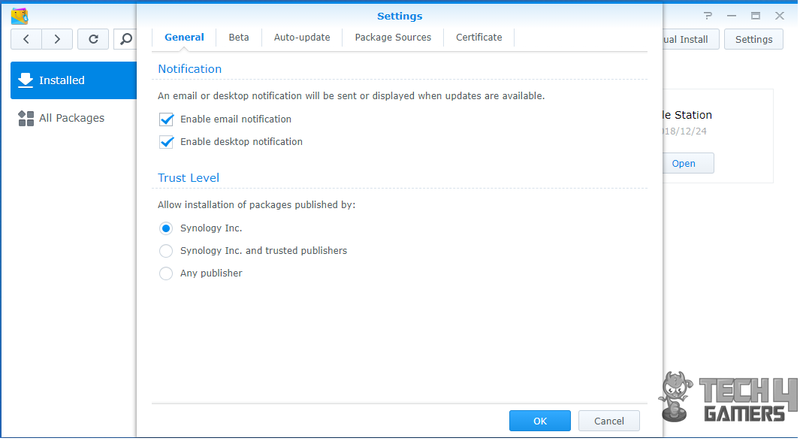 The user can select the source of the package under Trust Level by selecting either of the Synology only, Synology and trusted publishers or Any publisher. Enabling beta versions would allow the users to test that package even before it is released. The user can enable to automatically update the packages or selected ones. Certificates will show a listing of the trusted certificates that have been added. The user can import more or remove the already added one. Since every package has so many features and functionalities, I simply can’t cover them in a single content as this content is already way getting way lengthy and accept my apology if you start to getting bored by now. 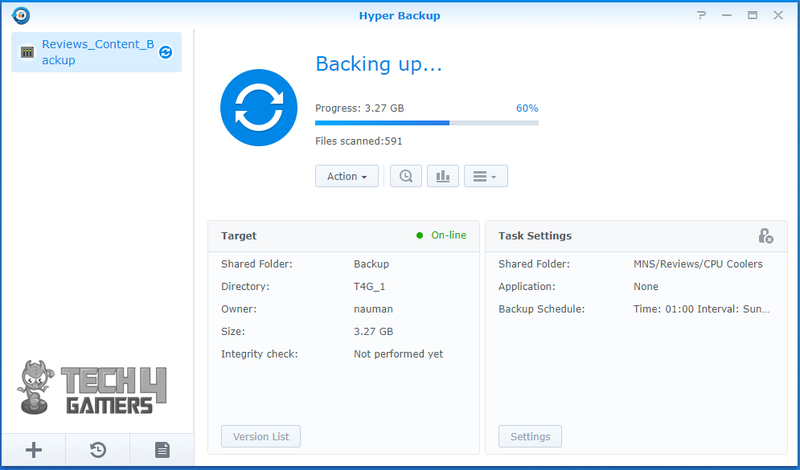 I will only cover the Hyper Backup in detail here as per the Synology request. I will be writing spate guides/overview of the packages in the coming time. 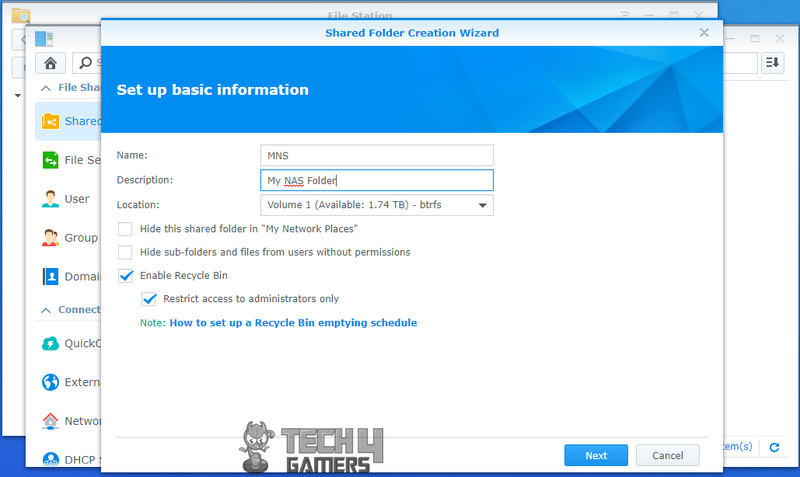 For now, let me show you how to create a shared folder on your NAS disk drives using file station. 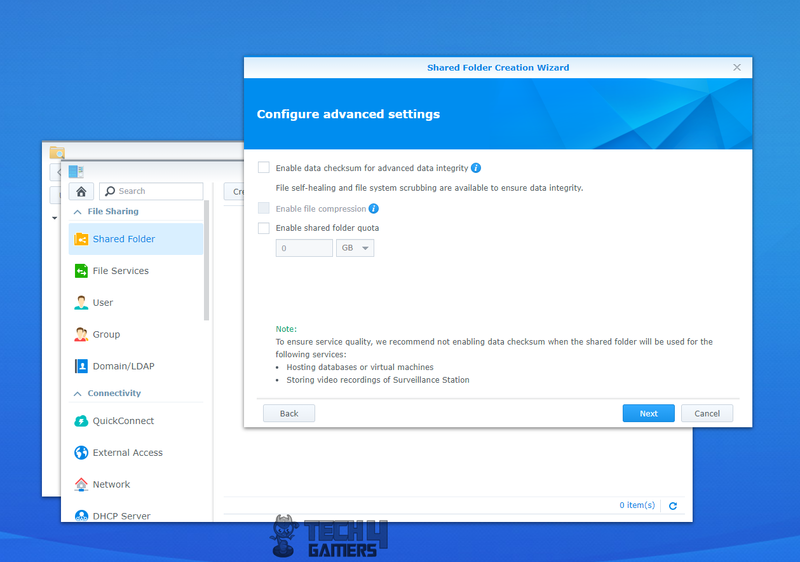 Launch the File Station package either from the desktop or from the main menu. 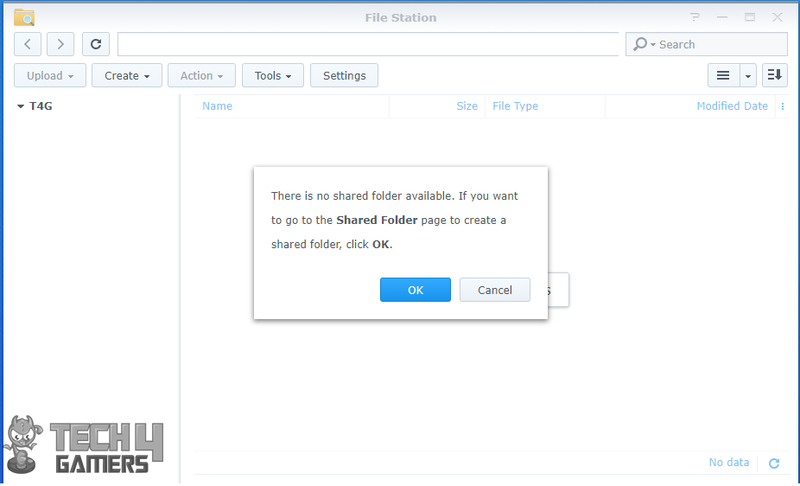 If the shared folder is not created already, it will prompt you to create one. Alternatively, you can create one by clicking the Action button and then clicking the Create New Shared Folder. This will start the wizard. You will be prompted to setup basic information. Assign a useful name to the shared folder and set its location in case there is more than one volume. Be careful when checking the enable recycle bin. Generally, you would want the users not able to clean the recycle bin. It is better to check the restrict access to the administrators for better data protection. Next, you will be asked to enter the encryption key in case you would want the contents of the shared folder to be encrypted. You would first want to initialize the Key Manager from the Control Panel before start using the encryption keys. In the next window, you will be asked to check the option for data checksum in case you would want to ensure the integrity of the data. It is a user bound option. You can also enable the quota on the shared folder in terms of storage capacity. In the next window, a summary of selected options and tasks will be shown. Click on Apply if they are what you need. 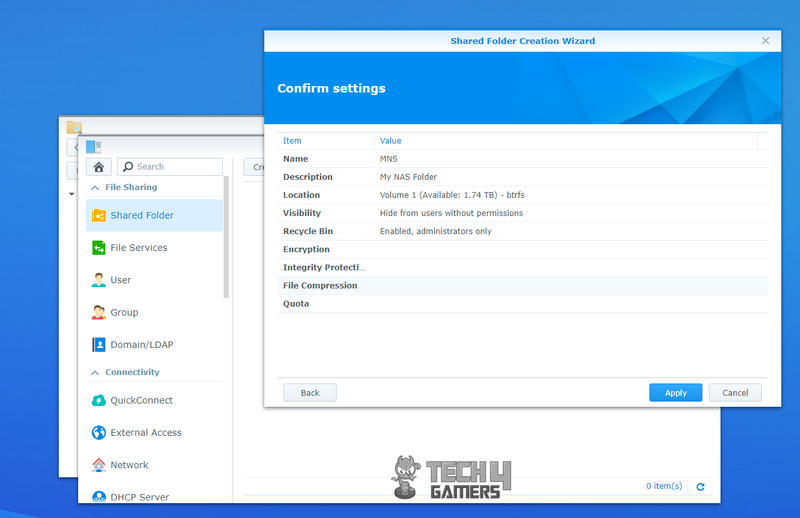 Once the shared folder is created, you can set the user accounts permissions. 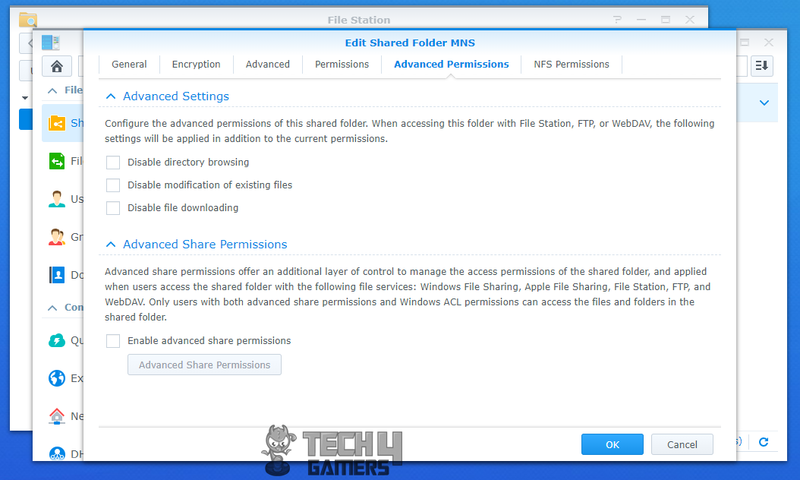 Read and Write permissions can be set from Shared Folder settings/properties in the File Station. Generally, the group permissions are inherited by the user accounts in that group. You can modify these are per the requirement. 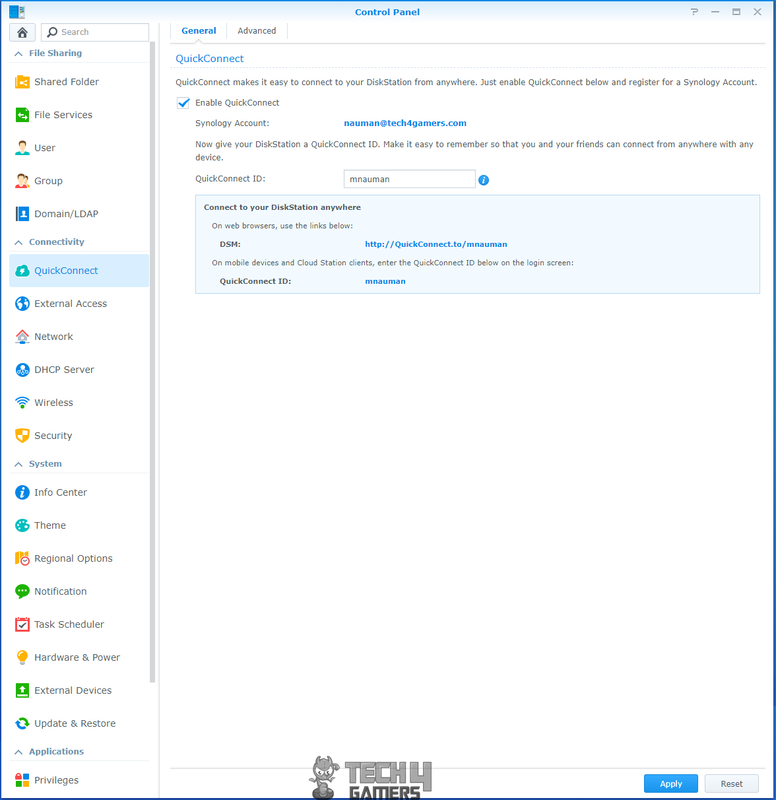 Advanced Permissions allow the administrators to enable/disable directory browsing, files modification and file downloading. 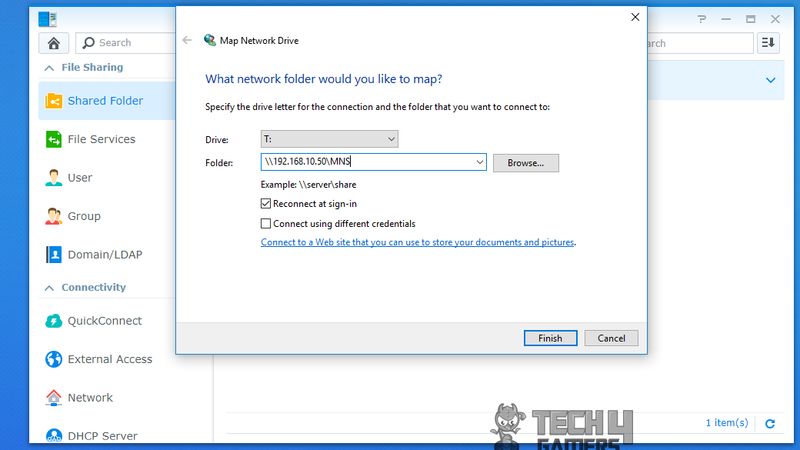 The shared folder will not be visible in the My Computer of your PC until you map the network drive. To do that, open the file explorer. 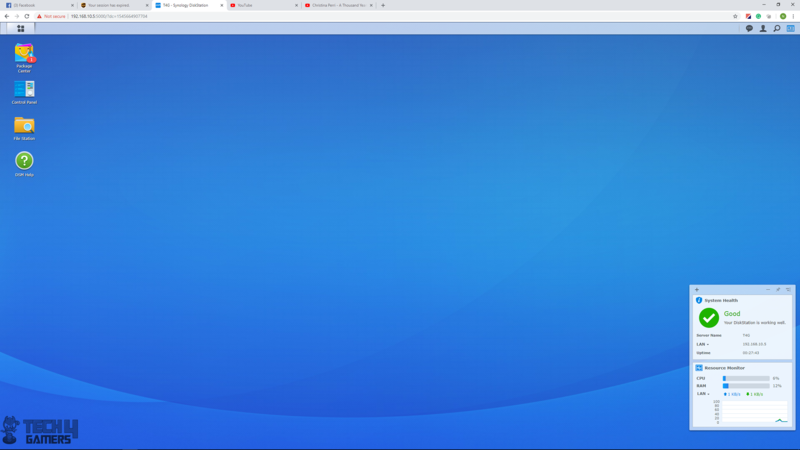 On the top left menu bar, click on the Computer and look for Map Network Drive. Click on the Map network drive and it will start a wizard. Specify the drive letter from the list. In the folder, specify the name of the shared folder using this format, \\server\share. In our case it was 192.168.10.50\MNS. I have already changed the IP address of the Disk Station on my network. I will show you how to do that later in the section. Check the Re-Connect at sign-in so that the network drive remains available. Click on Finish. 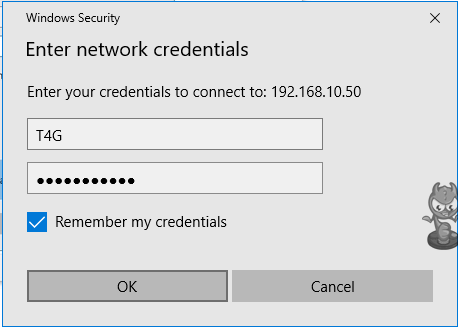 Next, Windows will ask you to enter the login credentials. The user name and password must be entered and it would be same as you created once setting up the NAS. Check the Remember my Credentials otherwise; you will be prompted every time on accessing the shared folder. Click on Ok to complete the wizard. 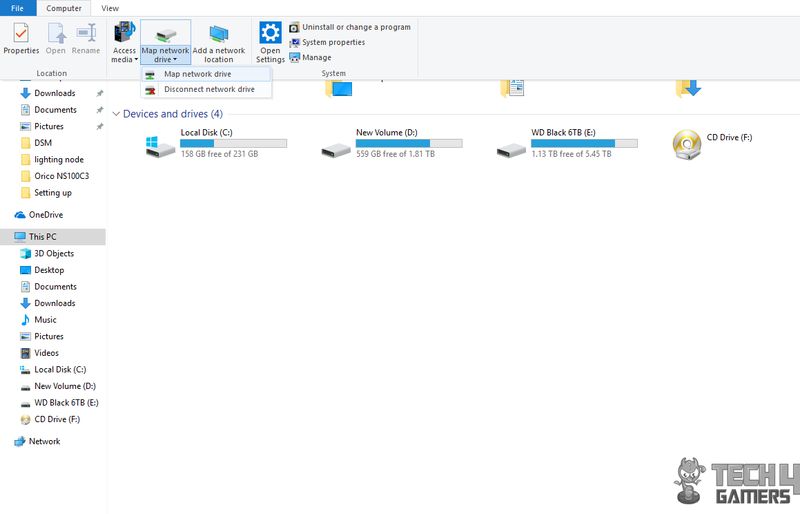 The network drive will now be visible under the connected disk drives on your PC in file explorer. Before digging into the Hyper Backup, let’s take a quick look at the Control Panel. 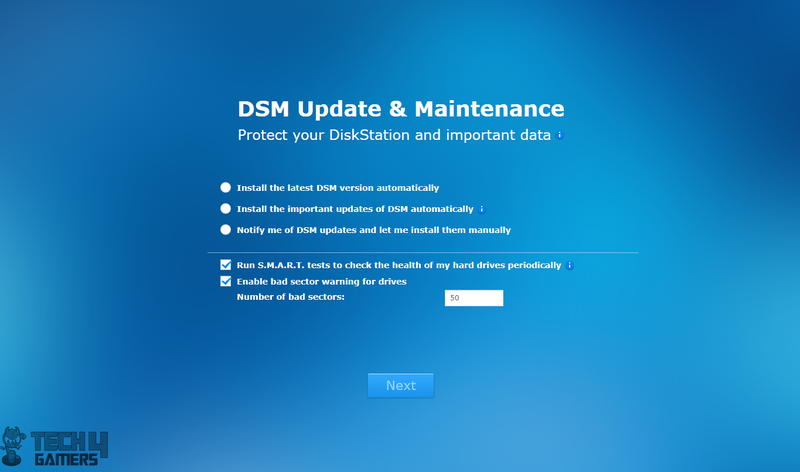 Much like Windows’ Control Panel, the DSM’s Control Panel gives full control over your Disk Station. For each and every setting, this is the place you need to be in. Again, I would not be going into details of each and every option as it is simply not possible to cover all. A bit brief is what is coming below. Click on the Control panel on the desktop or alternatively access it from the main menu. 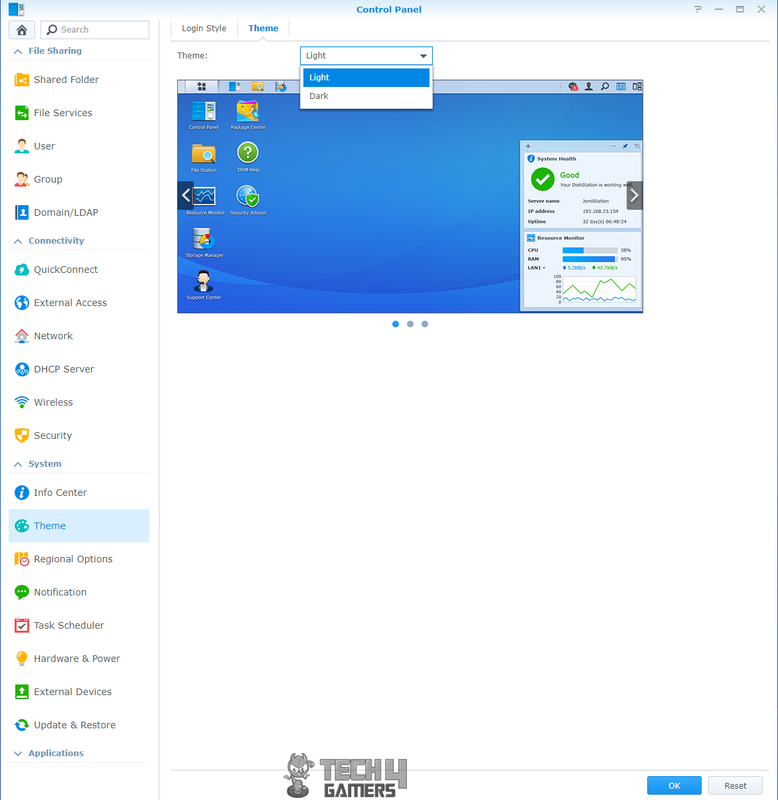 The main window shows four categories which are File Sharing, Connectivity, System, Applications. Basic mode is loaded which can be switched to Advanced mode. Shared Folder related settings can be found in this option. Since I have already covered these settings above, hence I won’t be repeating here. 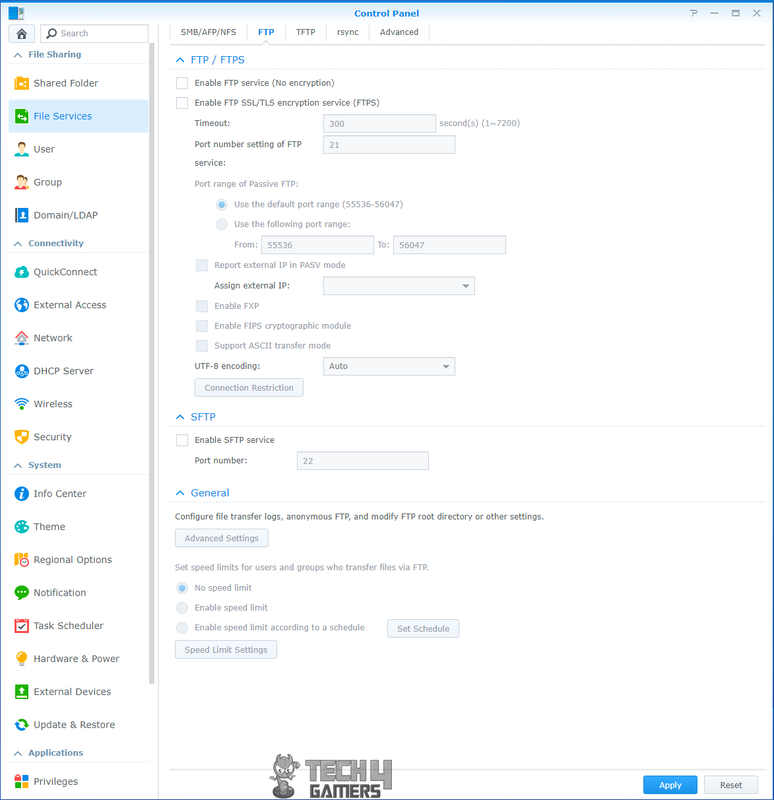 Settings for File Services can be found here including settings for FTP protocol, TFTP protocol, rsync server, and SMB/AFP/NFS. The user’s related settings can be found in the User section. On the main screen, the listing will show the created users in addition to the admin and guest which are there by default. The advanced settings allow to apply password strength rules, enable two-step verification, and password expiration settings. Clicking on the user’s name will load another window. The first page shows the information about the user account. You can change the password from here. You can configure if the users can change their passwords. User groups will show the listing of the available groups. Permission section will allow the read/write permission. The Quota section will allow creating storage space quota per user. The default is an unlimited quota. Under application, the user can be granted permission to use selected applications. Speed limit allows limiting the traffic per user. The groups’ section lists the available groups. New groups can be created as per the requirement and existing can be modified. Clicking on the group name will open another window with loads of options much like how it was for the users. We can set the Group permissions, application permission, quotas, speed limits. Please, note that users pertaining to the group will inherit these settings by default. The user can enable the QuickConnect from the control panel under Connectivity options. 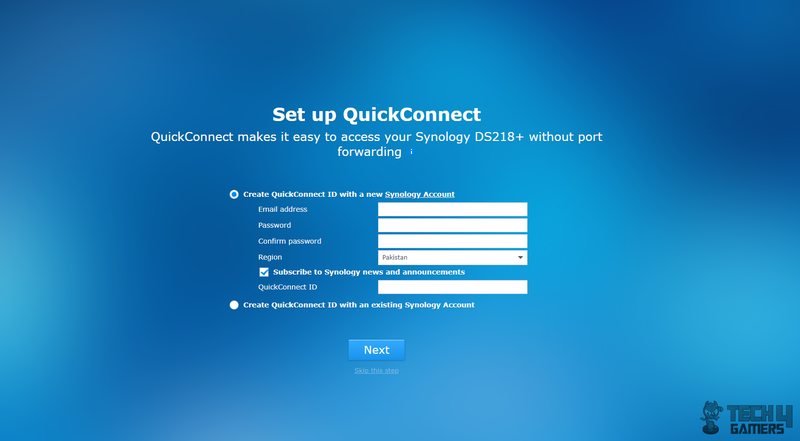 Your Synology account’s information will be shown in addition to your QuickConnect ID for connecting from the remote devices and from DSM. 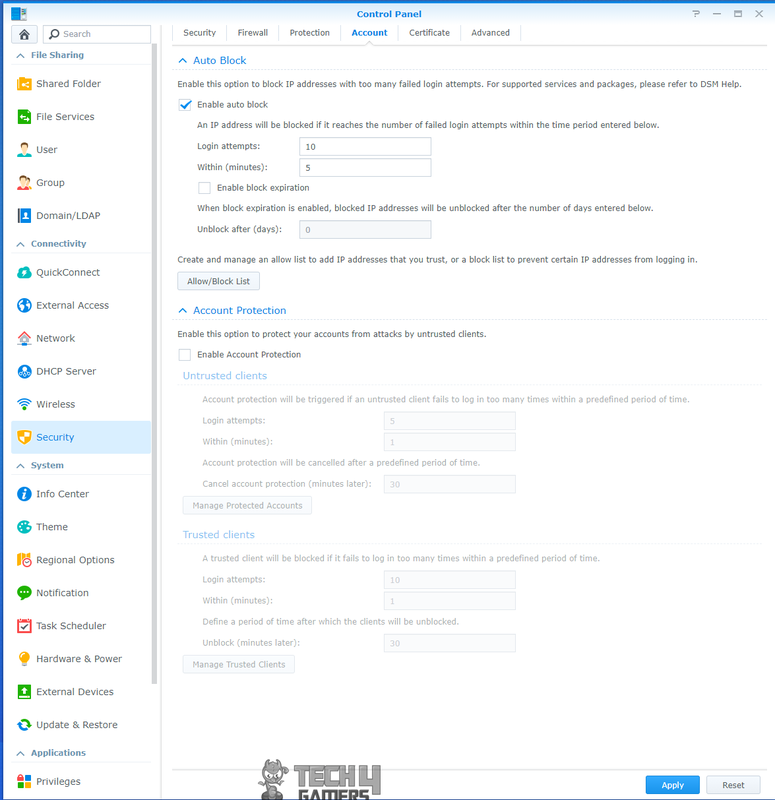 Advanced settings will allow setting permissions applications to establish a connection using the QuickConnect. Without these permissions, the remote applications would not be able to establish a connection with your DiskStation. 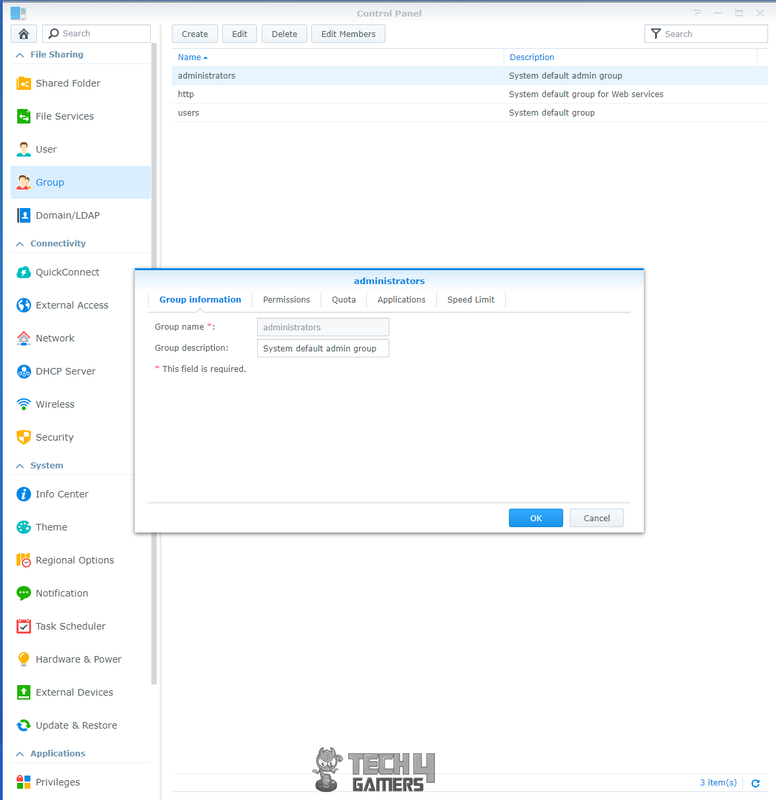 The user can also enable the Synology relay server to be used in case direct connection can’t be established. Port forwarding rules for QuickConnect can be set to be generated automatically if the router supports Port Forwarding. The network is another important setting to control every aspect of the connectivity. The General tab will show the current server name, default gateway related info. Network interface will show the possible networks listing. LAN is being shown as connected meaning it is the connected network source. In order to change the default IP address of the DiskStation, double click the LAN. This will open the Edit window. Change the IP address to your desired one by changing the last two digits. In my case, I changed it from 192.168.10.1 to 192.168.10.50. You can set up the DisStation network map in the Wireless. You will be prompted to connect USB Wi-Fi Adapter or Bluetooth Adapter to the DiskStation before proceeding. You can configure your DiskStation to act as Wireless AP or Wireless router or it may simply join your wireless network. 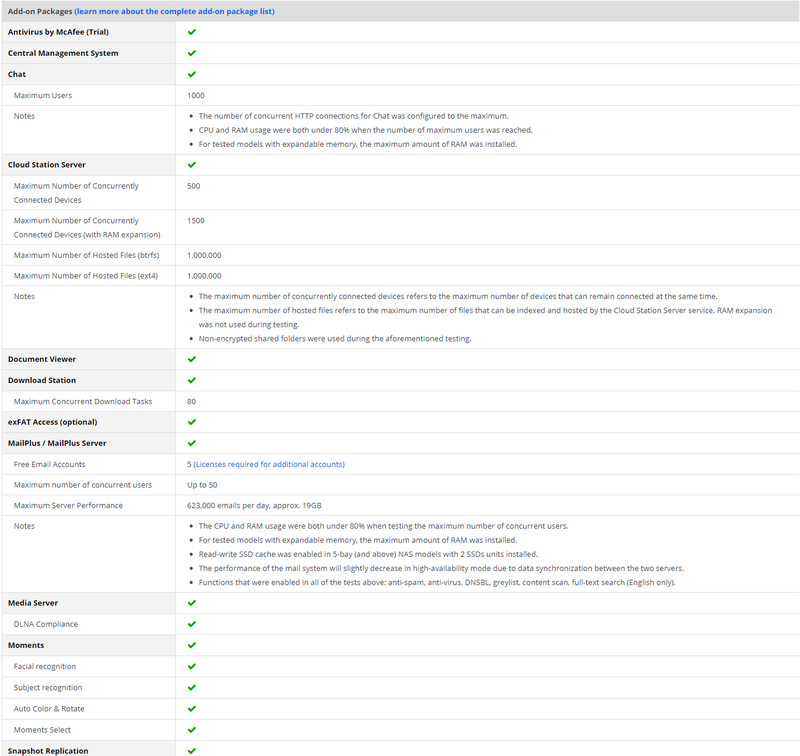 Security section has all the security-related settings like enabling Fire Wall, adding trusted proxies, setting session time out, enabling DoS service on the connected network, enabling auto block after defining the login attempts, adding/configuring the certificates, enabling HTTP compression to name a few. The info center shows the info summary of the DiskStation like its serial no, CPU and RAM information, DSM version, System Data and time info, uptime, thermal status, Time Zone, network information, individual disk information in the Storage section, a listing of the services along with their status. 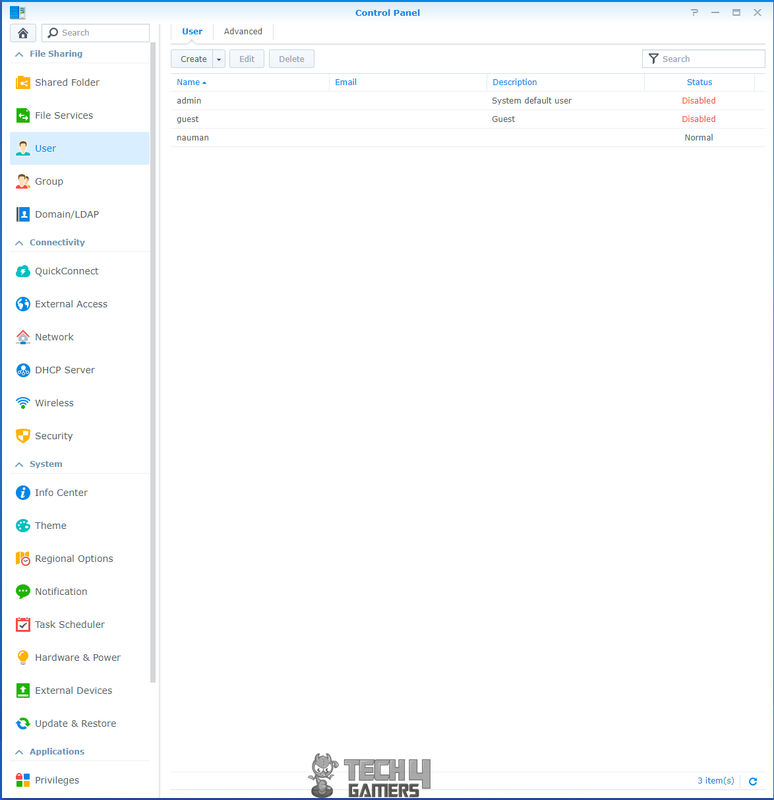 Device analytics can be shared with the Synology should the user choose so. Similarly, network location can be shared as well. 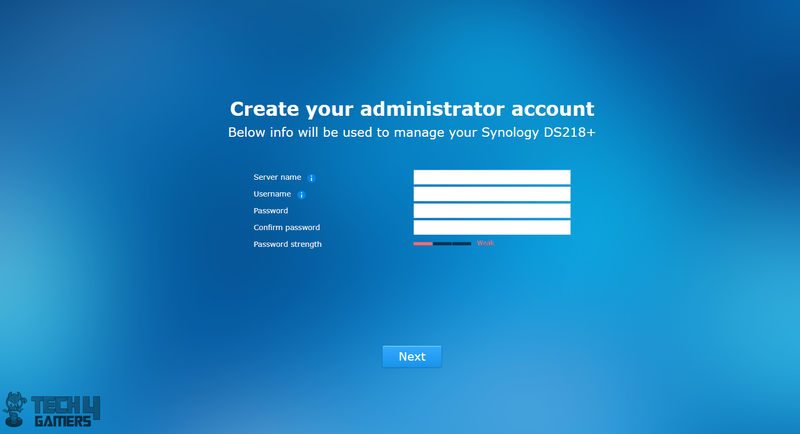 Synology account will be shown and it can be managed. Login style and theme can be set from the Theme section. Light or Dark are the theme options available. Date, time, language can be changed in the Regional Options. 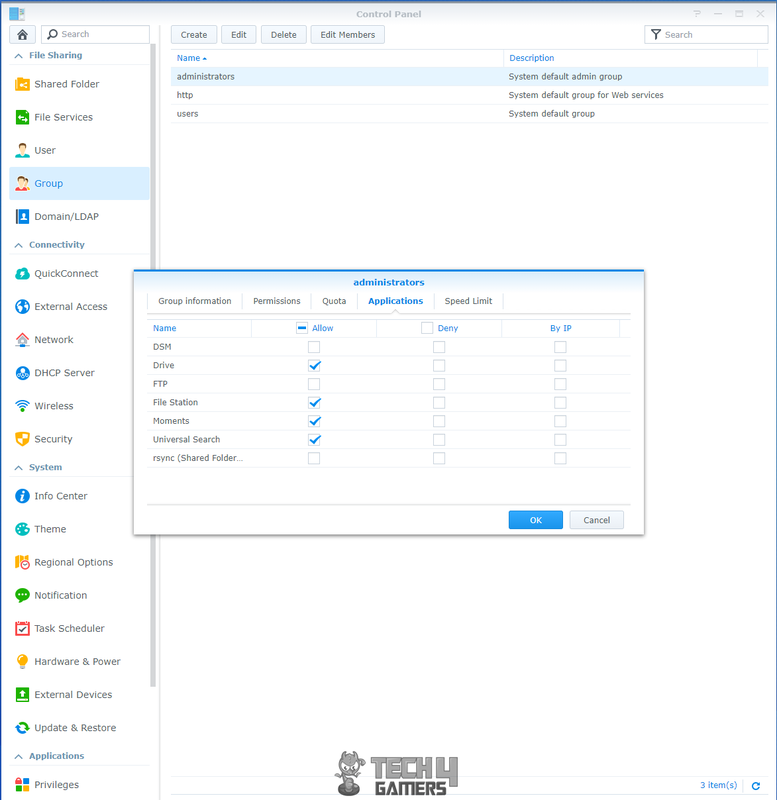 Task scheduler can be used to create or edit custom tasks. The user can control the DiskStation fan speed in three predefined modes. The brightness of the LEDs can be controlled. The user can select when the DiskStation should beep to alert the user. The user can set the DiskStation to power on automatically after a power failure. Disk drive(s) hibernation can be configured as well. UPS can be connected to the device to enable further support and data protection in the case power failure. 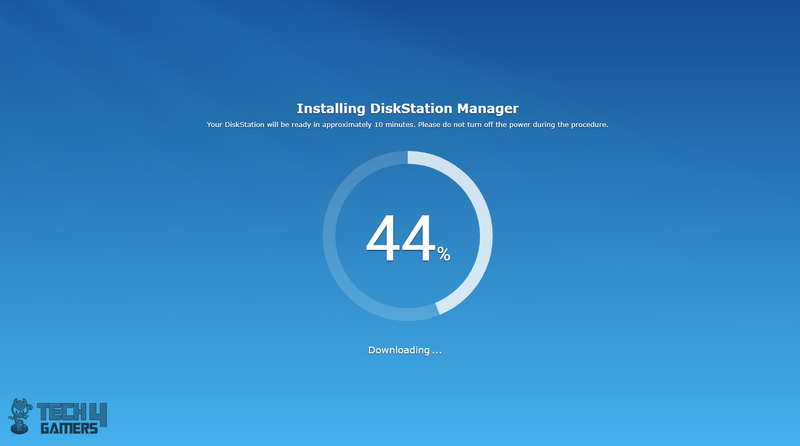 In Update & Restore options, the user can define the update settings of the DiskStation. The user can factory reset the DiskStation by erasing all the data and the settings from here. The settings will be restored to the factory’s default. There is a reset button on the rear of the DiskStation which can also be used to load factory defaults. When it comes to the data management the foremost important element is to ensure the integrity and safe keep of the data hence it is recommended to regularly back your data up and to multiple copies of it just in case. This, of course, has considerations with respect to the single user environment, multiple users’ environment, presence on the local/remote network, enterprise-level computing etc. For a home user, this might be of less consideration than the small business setup or the enterprise setups where data is everything. Needless to say, backups come handy in case of data loss. 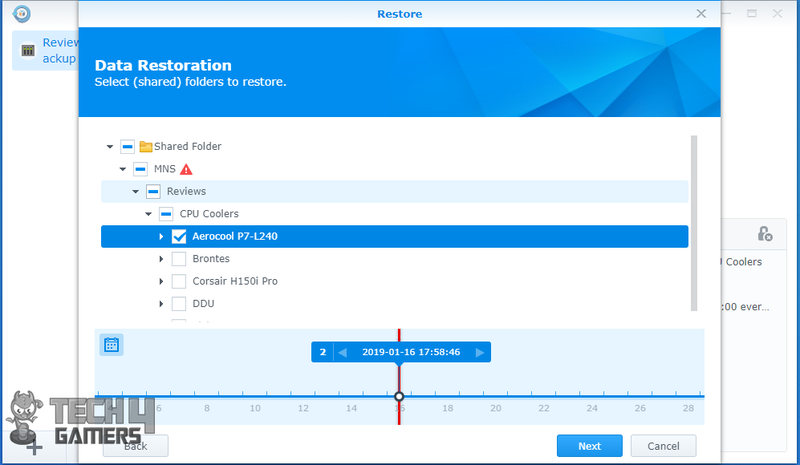 Synology has taken care of this critical aspect in the form of a robust and integrated backup/restoration solution through an application called Hyper Backup. 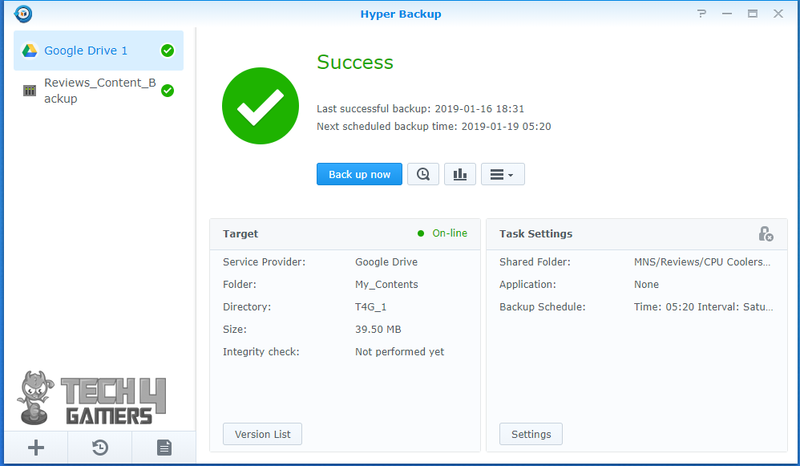 Hyper backup is using intuitive and user-friendly interface allowing the users to back up their data in a more elegant and effective manner. Since we are talking about NAS hence having an integrated app that takes care of your data on its own based on the user-defined settings, is a killer feature. 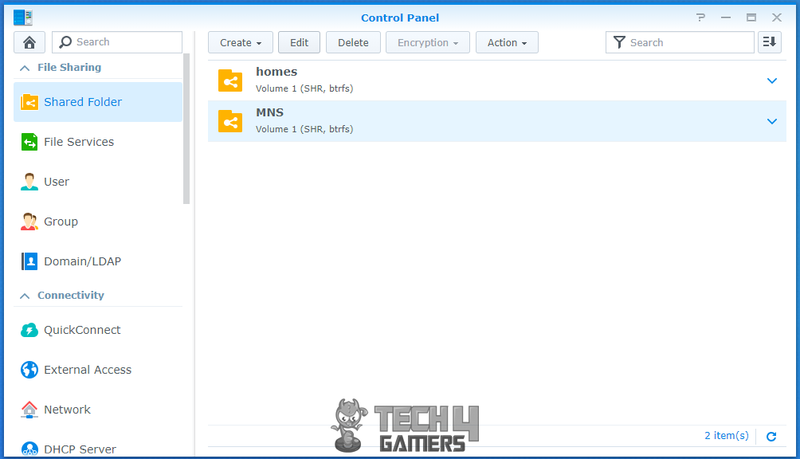 Local/remote Synology NAS backing up involves copying data on a local Synology device or on a remote Synology device. All most, the steps in all three categories are same with few changes which come from different configuration requirements. 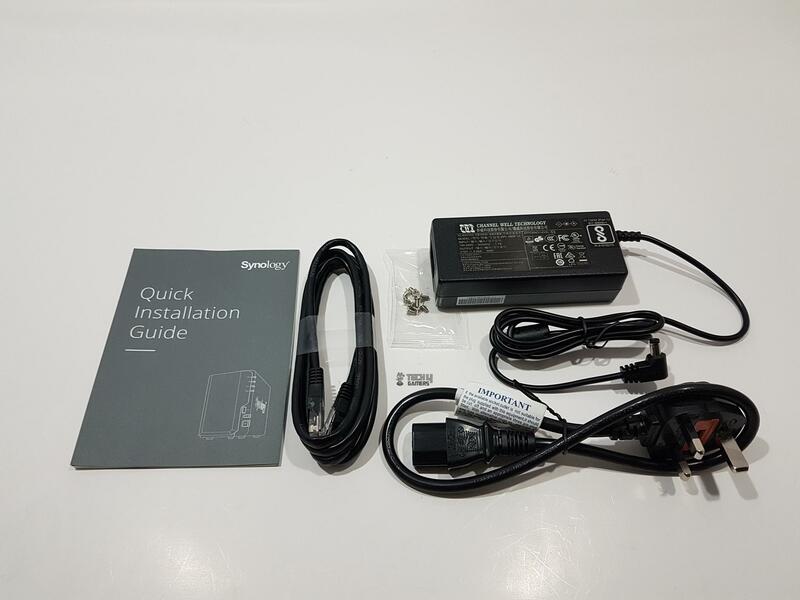 Synology DS812+ enables the users to connect an external USB drive with the NAS box and they were on the point when developing the Hyper backup application as it has a feature to backup the data on the external drive as well. Filer servers allow the user(s) to back up the data on the remote server. All that you would need to know is the IP address of the server, user name, password and the shared folder on that server where the backup needs to be made. Rest of the steps will be the same as for any other type of backup. Synology was thinking way ahead as they have also enabled the users to set up a backup to a cloud service like Google Driver for example. 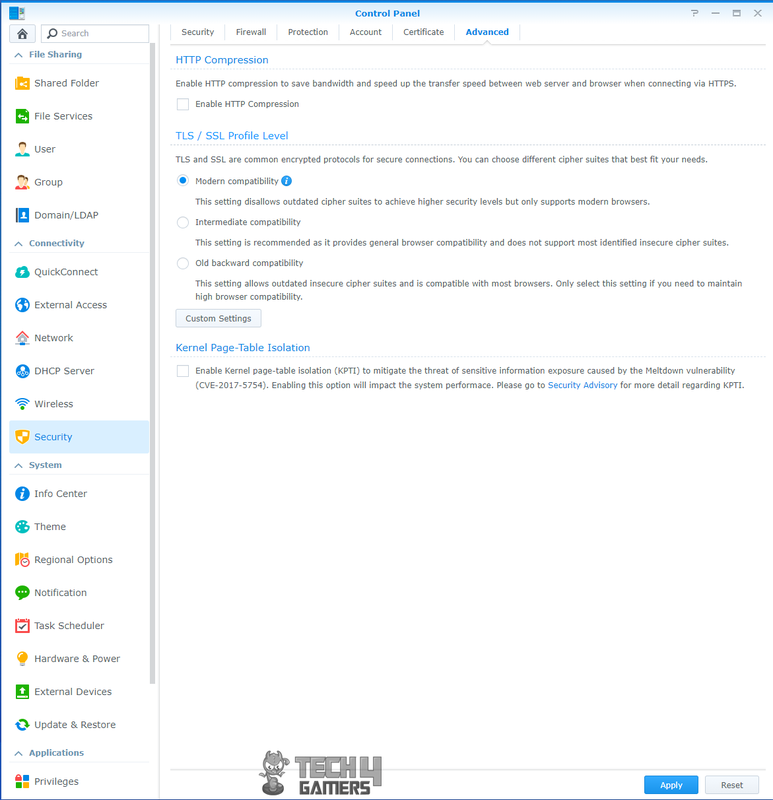 Again, steps are almost the same except to where the interface will ask you to sing-in your respective cloud service and authorize the Synology for the backup. 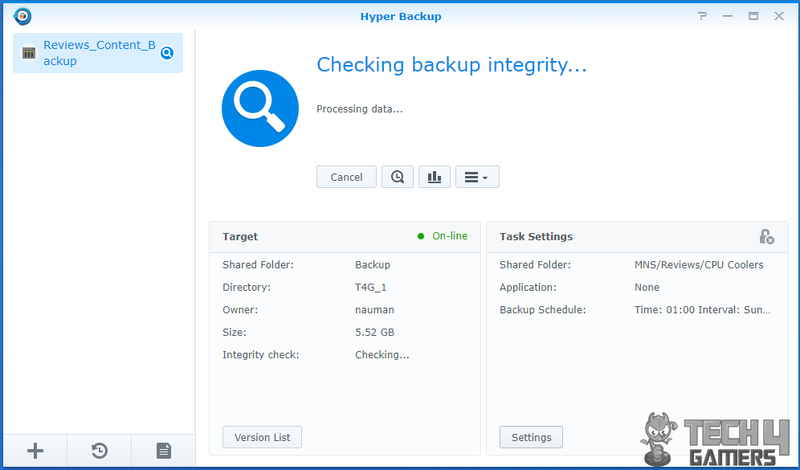 As can be seen, the extent of features that Hyper Backup provides speaks for itself. To make you understand of the scheduling and versioning, I will use my own scenario of data backup requirement. As a content creator, I know the size of my data is ever growing. The nature of data is dynamic i.e it will change over time and more data will be generated/gathered. If I were to back my data for once, surely I would be happy in a simple copy paste. 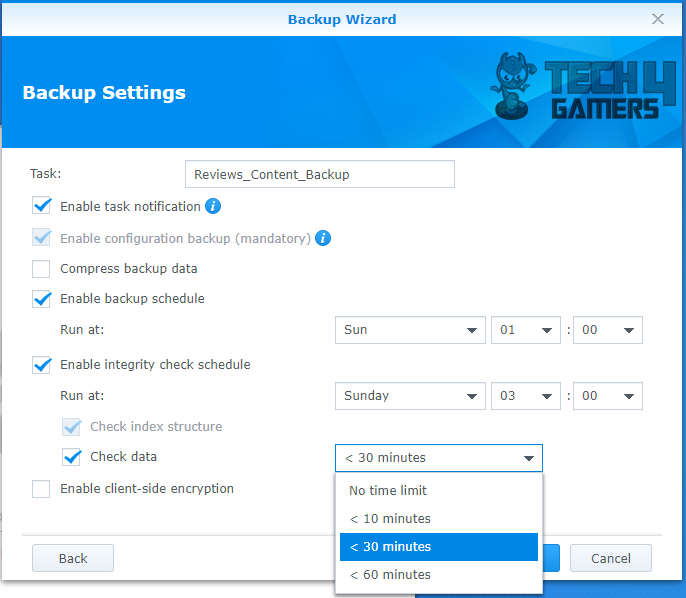 Since I want to ensure a regular backup of my data automatically at regular time intervals, I would like my backing solution to take care of this requirement on its own and saves me from doing it manually every time. This is where scheduling kicks in to play its significant role. 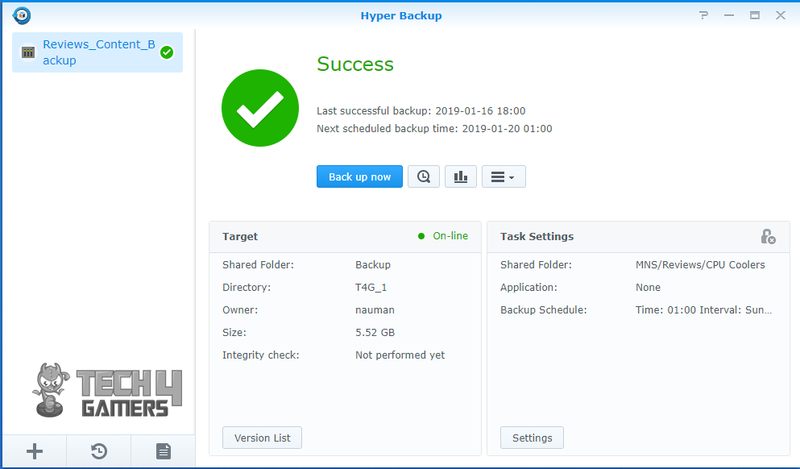 Hyper back provides extensive settings to set up a backup on a user-selected time and date and to repeat it automatically without bothering me. This dynamic feature of the application software is a critical requirement for any NAS. I will be showing these settings shortly. This was one aspect of the copying data automatically at a given time interval. Now, let’s suppose, I have a data set with a size of say 100GB and I know this size will increase manifold in coming time. I don’t want my NAS to hog my resources every time the data backup task is run from the scheduler. Just imagine the pain of copying every bit of this 100GB data set. Instead, I would very much like to have incremental synchronization i.e to back up the change in the data set not the complete data set over and over again. Let’s just say I have 20 main folders/directories and each of these folders have sub-folders/sub-directories with each, in turn, having its own subfolders and files. Let’s assume that I create one more main folder making the count to 21. Now, what I would want my backing up solution to do on the next backup task is to copy the 21st folder and its content only. This will not only reduce the copying time but also will take fewer network resources to complete this task. This is where the versioning comes in to play its role. User(s) can keep multiple versions of the data with maximum number being 256. 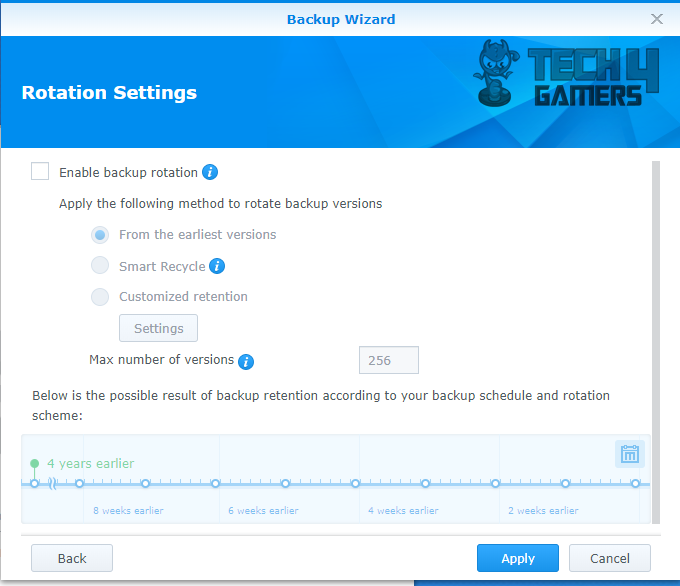 User(s) can also lock the versions effectively telling the Hyper backup not to rotate or delete the locked version(s) and depending upon the selection of the setting, rotate the earliest or last unlocked version once the limit on the number of the versions is reached. This reminds me of the time when I did a project to automate the library system of the local university. They have one central library with multiple of thousands and thousands of the books/journals/magazine etc. Then they have one library per department. Hence it was a centralized yet decentralized configuration at the same time. An added requirement was that the central library has a backup server which was located in another location. We needed to ensure that updated data from the local library gets replicated to the central library’s server in minimal time yet at the same time ensuring the single version on both sides. Anyhow, I digress. 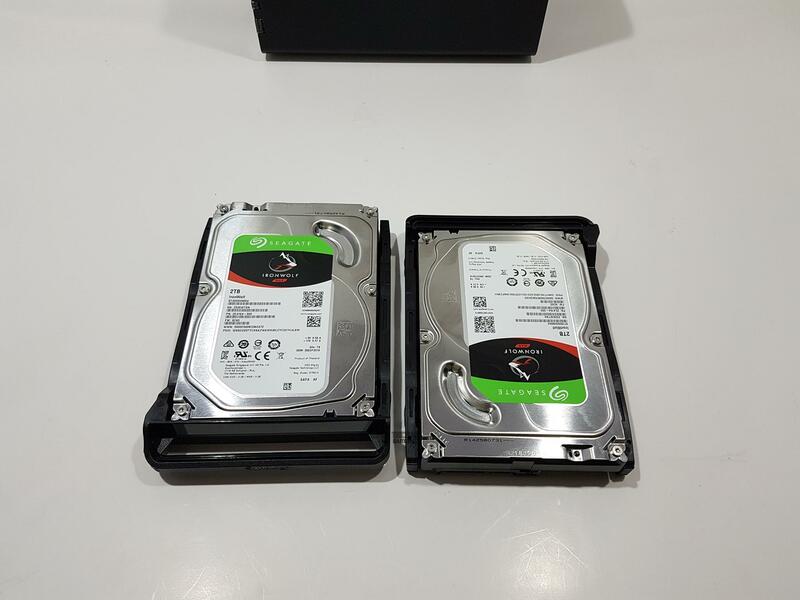 As DS812+ is a two-bay device, I removed the single volume with RAID and made two volumes. One volume on one Seagate IronWolf drive. In this way, I was better able to replicate or backup the data on one volume to the folder on the second volume. This was done to show you how to backup data using Hyper backup. 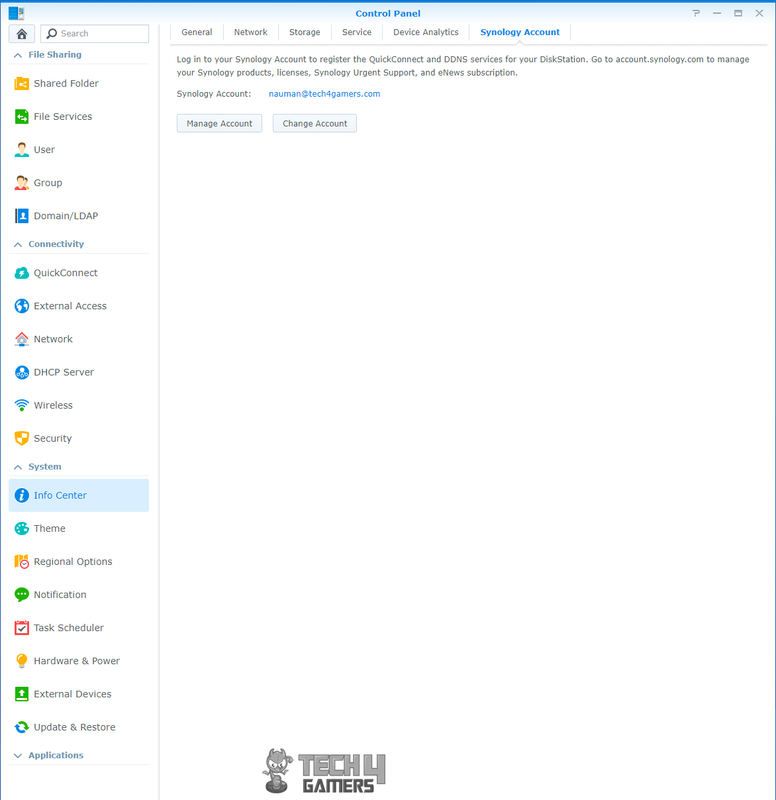 Since I have only one Synology NAS box, I would be showing you the steps on setting up backup on a local Synology NAS and then setting up a backup using Google drive under cloud services. Let’s begin. Hyper backup can be downloaded from the Package Center. Login to the DSM and go to the Package Center. 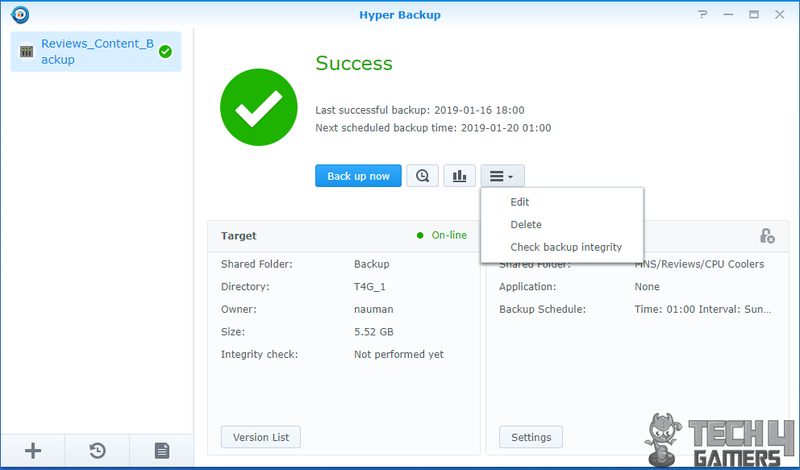 DSM version 6.0 and above only support Hyper backup so it would be about time to update the DSM if you are up to setting a backup task. 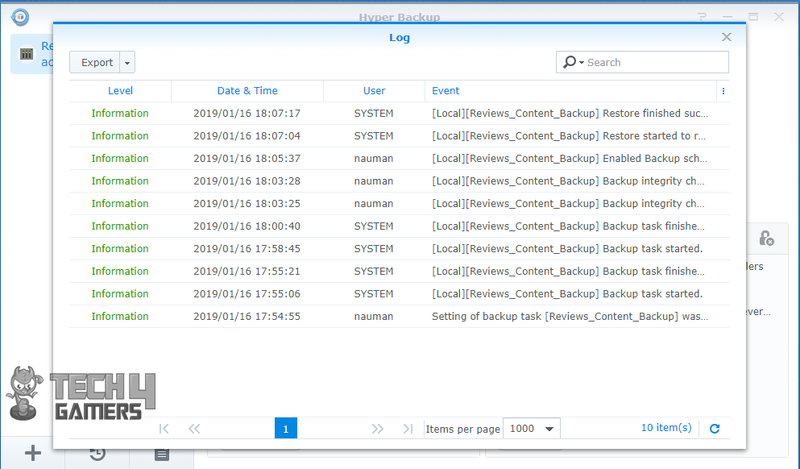 In the package center browse and locate the Hyper Backup app and click on Install. It will ask you to install related and required package(s) if not already installed. You would need to download and install those apps as well. Once, the Hyper Backup is installed, it can be accessed through package center in installed packages. You can also create its shortcut on DSM desktop. Launch the app by clicking it. It will launch the backup wizard. 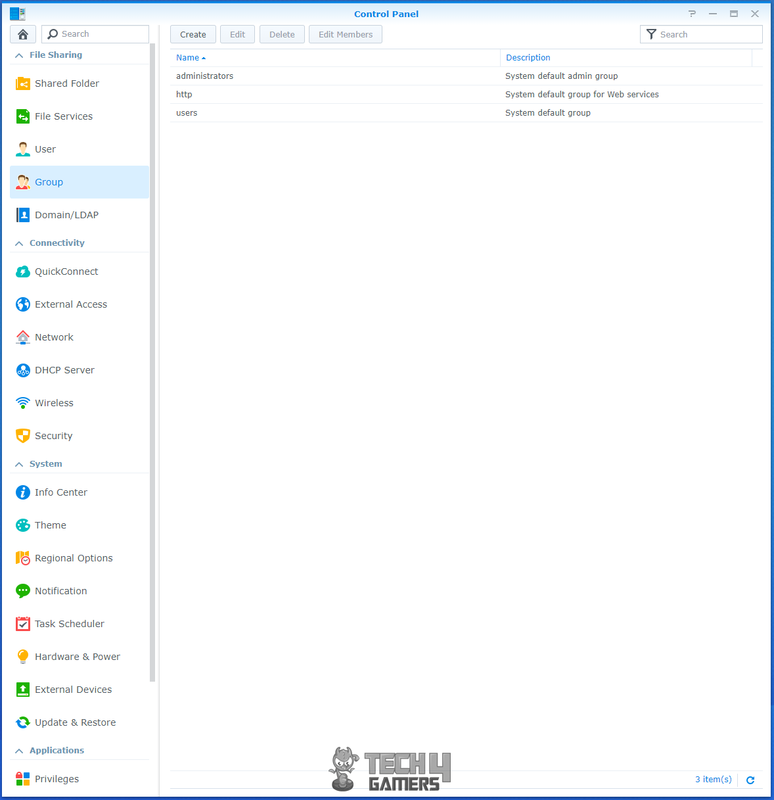 The first screen will show the three categories under Synology, File Server, and Cloud service. Click on Local Folder & USB and then click on Next. On the next page, under the Create backup task, select the shared folder. 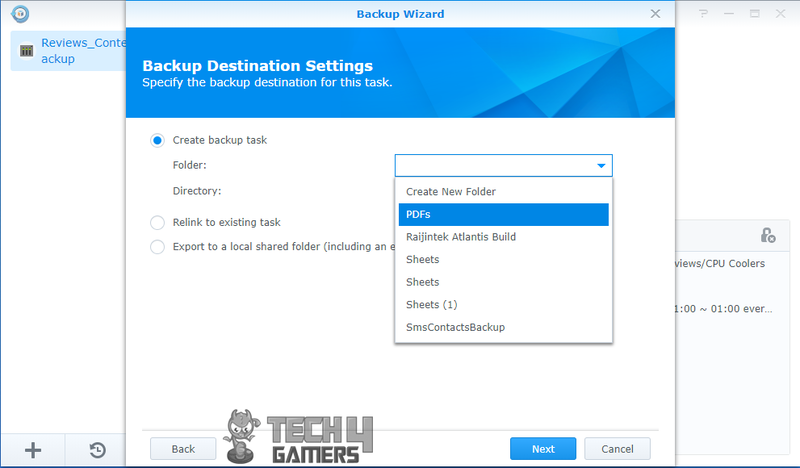 For the purpose of this demonstration, I have created a shared folder on the second volume with the name Backup. The user can also link the new task to the already executed task. Click on next. On the next screen, the user will be presented the volumes and will be asked to select the shared folder to be copied aka backed up. MNS is the name of the shared folder on Volume 1 having a folder Reviews which I will be backing up. Note that Backup under Volume 2 is disabled because it was previously set to be the destination folder. Click on next. On the next screen, the user will be asked to select the applications from the list whose settings/data are to be backed up as well. This will come in handy in case of restoring the device. It is an optional one. Click on next. On the next screen, the user will be presented with the backup settings. The user can define a useful name for this backup task. I have named it Reviews_Content_Backup. If you would like to receive notification about the task’s activities, check the Enable Task Notification. I would suggest using this feature as notifications on the desktop are quite handy in case user attention is required. If you are running out of space or using less capacity NAS drives then it is better to check the compress backup data. 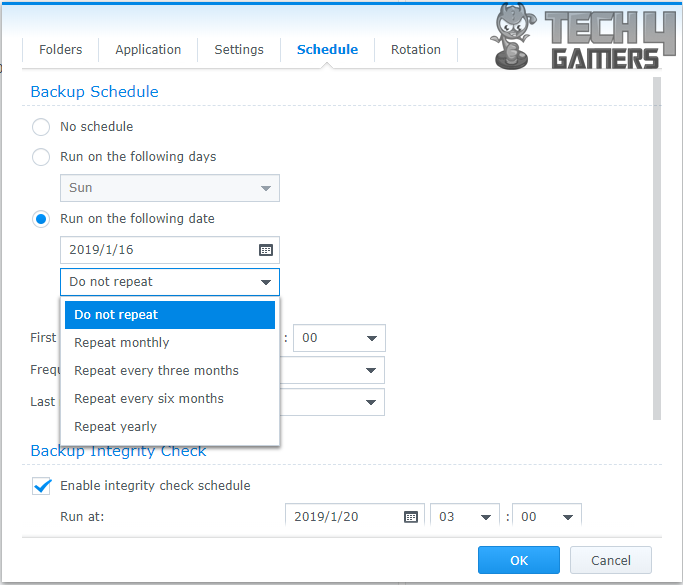 Checking Enable backup schedule will show the options to decide upon when the backup task will run automatically at specified data, time. The options are Daily, Weekend, Weekdays. Select the appropriate setting. Next is the Integrity Check schedule. I would suggest enabling this option to ensure the correctness of the backed up data. From the drop-down list, select the day on which the integrity test is to be run. You can define the time limit to test the data for integrity. This would come handy if network resources are to be freed up quickly for other tasking. The last option is for the protection of the data. The backed up data can be encrypted as well using a password. The same password will be needed to restore the data. After setting up, click on Next. Hourly versions from the past 24 hours: The system keeps the earliest version that is created each hour. Daily versions from the past 1 day to 1 month: The system keeps the earliest version that is created each day. Weekly versions older than 1 month: The system keeps the earliest version that is created each week. In case all the versions meet the above criteria, the system will delete the earliest version. The user can create a customized retention scheme as well. 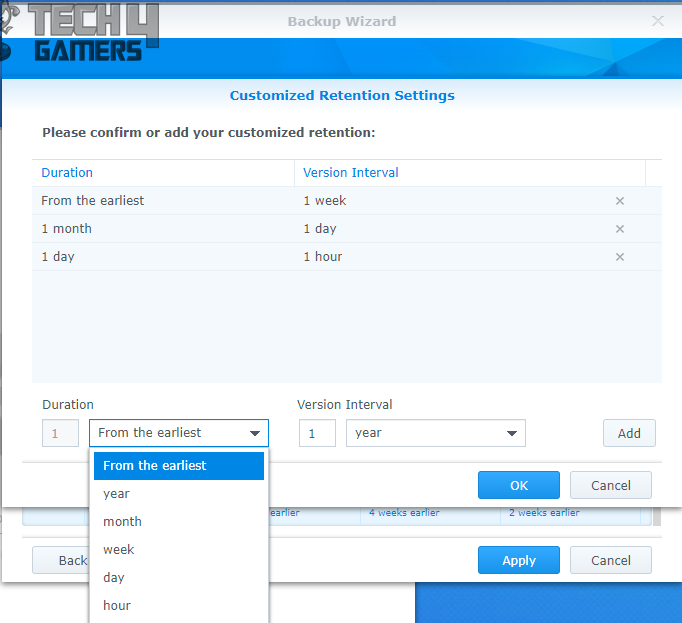 Select the Customized Retention and then click on the settings buttons. The user will be shown another screen. The above mentioned three criteria are already listed. The user can add more criteria to the list. To do that, settings are provided at the bottom of the screen. The user can define the duration from the earliest, year, month, week, day, an hour from the list and then define the interval from the next list. 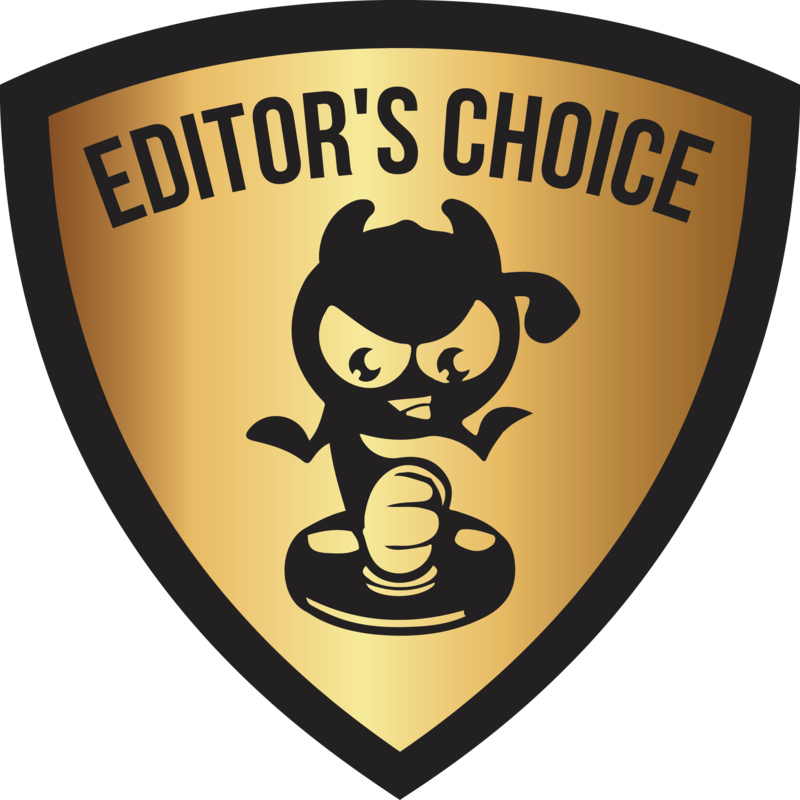 Once defined, click on Add to include the customized version retention scheme or criteria in the already populated list. Once you are done defining the rotation scheme, click on Apply. This is the last step of the wizard and it will ask the user to run the back up now. It is not needed but the user can choose so if so desired. Once done, a new screen will be shown. 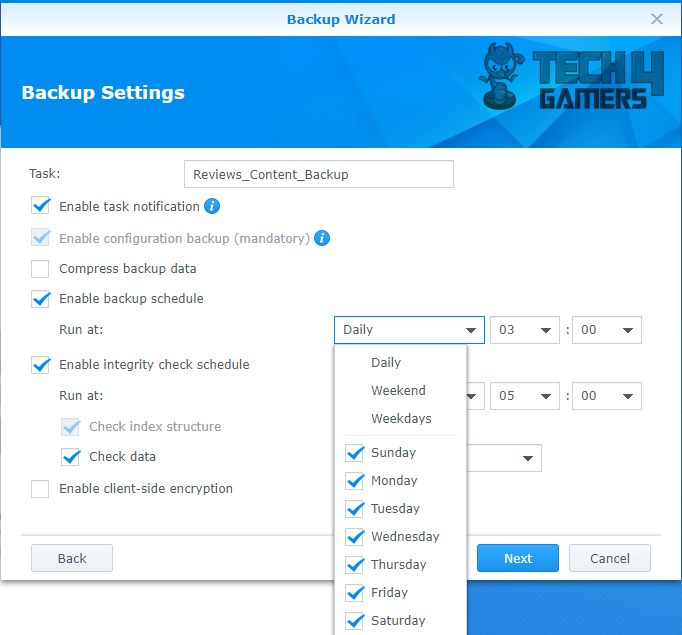 The left column will show a list of the user created back up tasks. On the right side pane, a summary of the tasks will be shown. Please, note that system configuration is backed up by default. 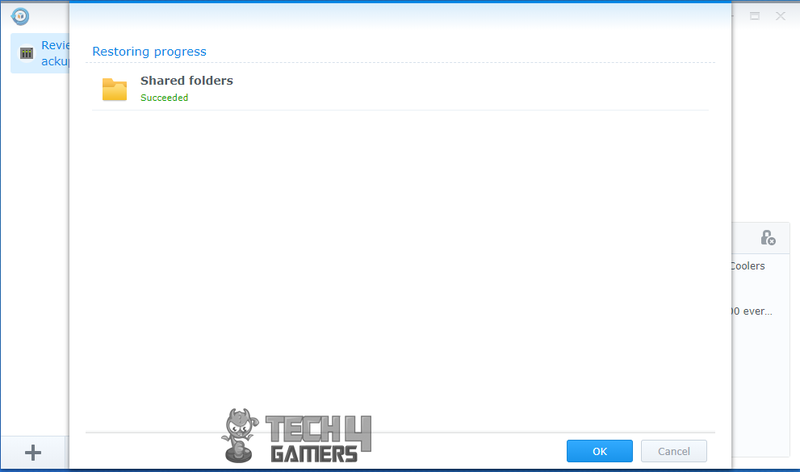 The top portion will show the progress in the percentage of the backup task and files scanned along with the size of the backed up data. The Target pane will show the summary of the target share folder whereas the Task Setting will show the summary of the task. 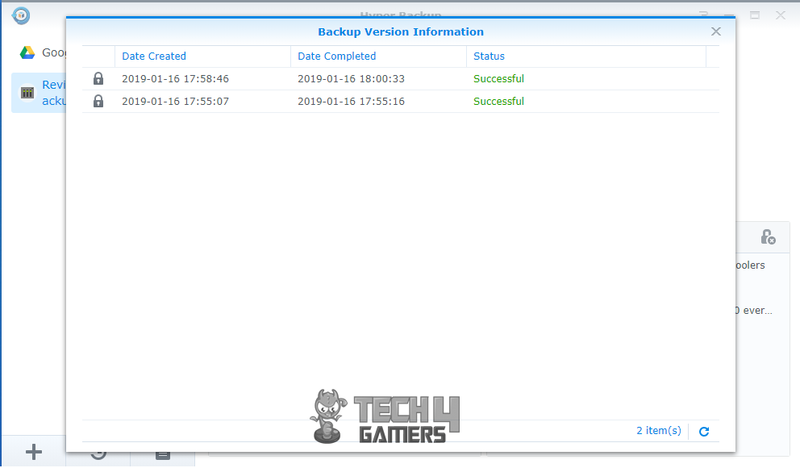 Once the backup task is successfully completed, it will show the Success label along with the date and time stamp of the last back up as well the date/time stamp of the next backup. 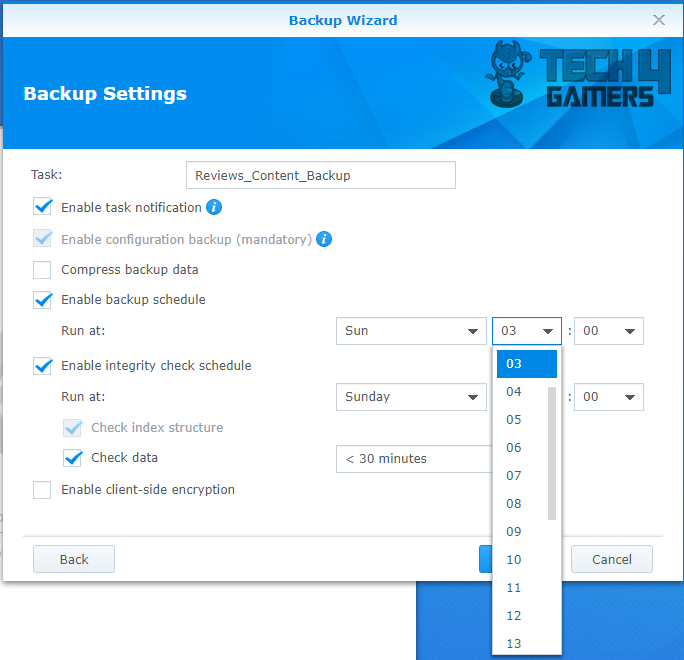 The user can click on Back Up Now to manually back up the data if needed. There are three ore option buttons on the right side of the Back Up Now button. The first is the Backup Explorer. The second one is the Backup Statistics. 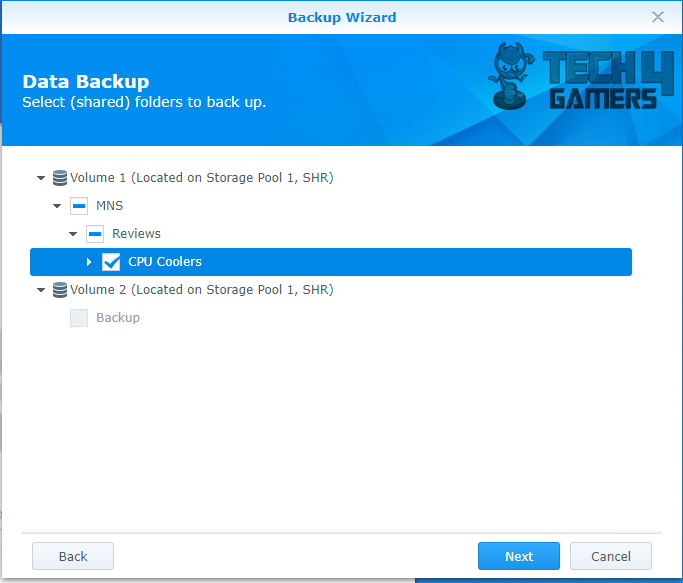 The backup statistics screen has three options. The detention usage shows the size of the backed up data and allows the user to setup alarms if size reached the defined threshold limit. 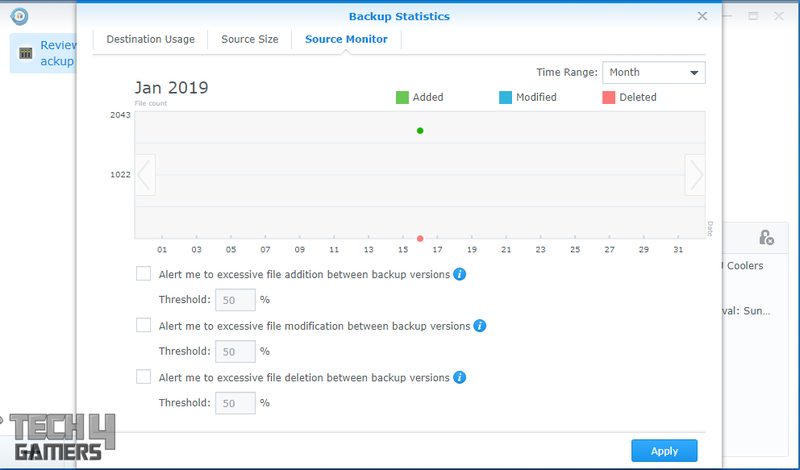 The source monitor shows the number of files backed up between the backup versions and allows the user to create alarms for files addition/modification and deletion between backup versions. 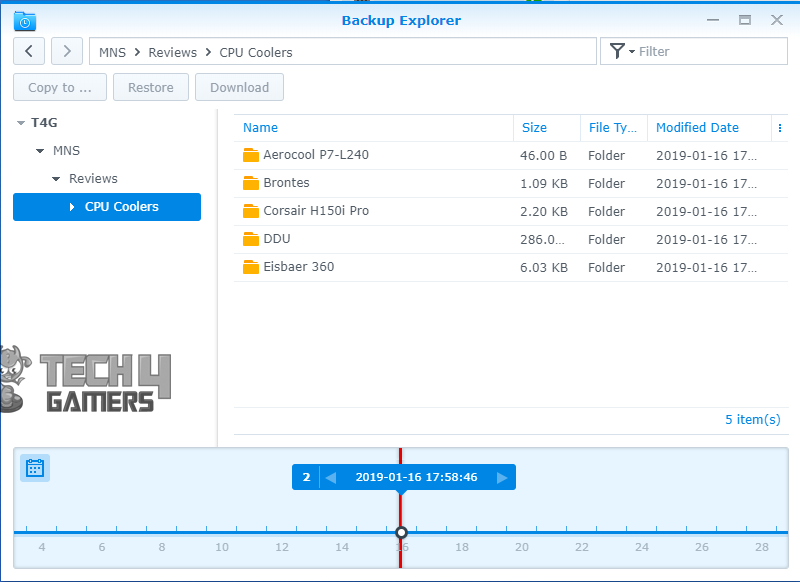 The Backup Explorer allows the users to view the contents of the source data in the typical Windows directory format. The backed up data can be restored from this interface as well. The three bars buttons on the rightmost side of the Back Up Now button has three further options. Which are Edit, Delete, Check backup integrity. 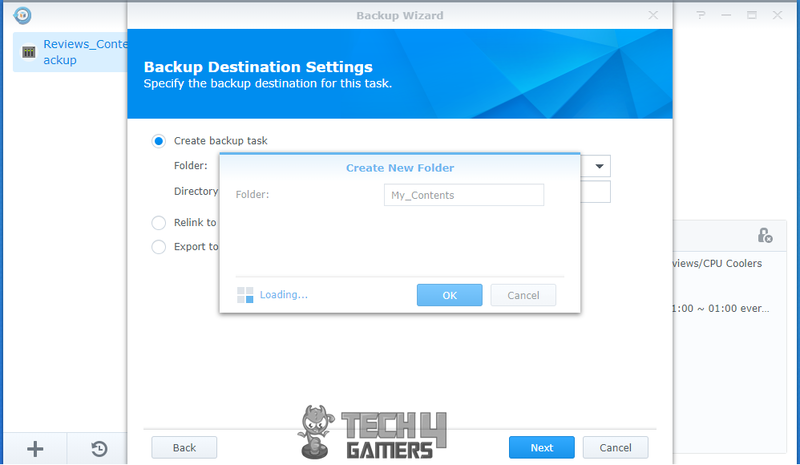 The delete button will allow the user to delete the selected backup task. 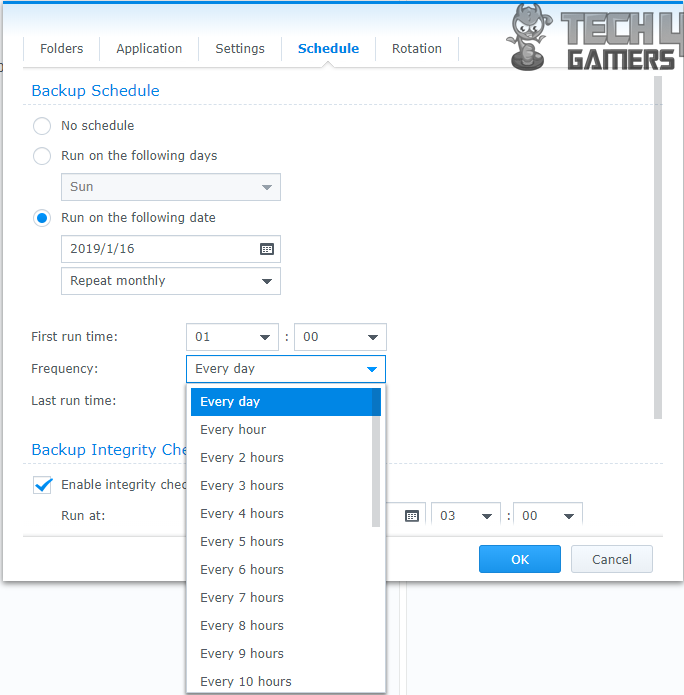 Check backup integrity button will run the integrity check for the duration as selected by the user when defining the backup task. I would particularly like to discuss the Edit button here as it will show the backup settings screen again but with one major change. 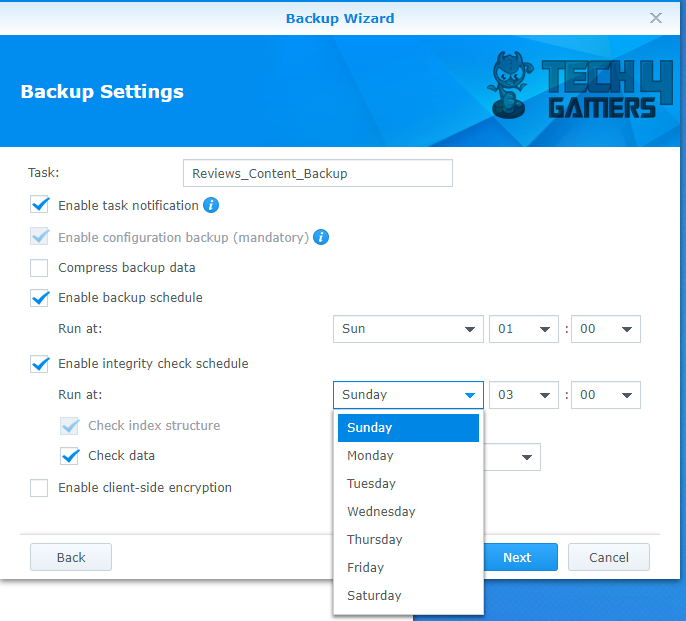 This time, the user will get to see the plethora of backup schedule settings which were not visible during the wizard run. 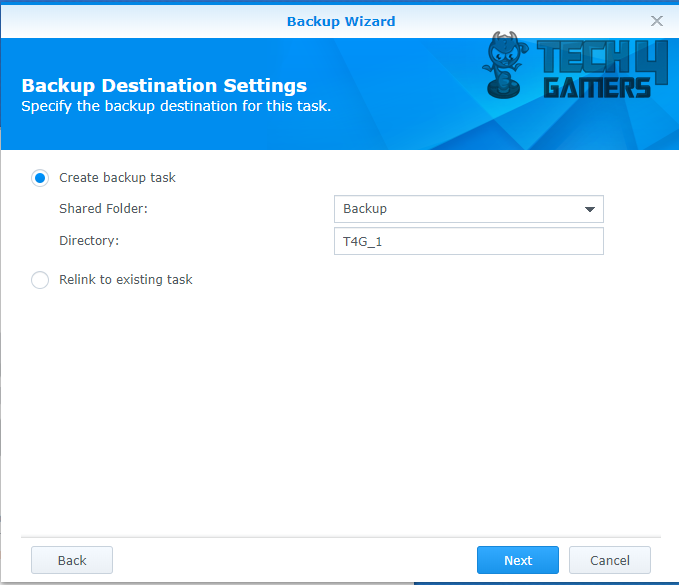 The first option in the Backup Schedule is No Schedule that would mean one time run of the backup task. The next option is the Run on the following day. 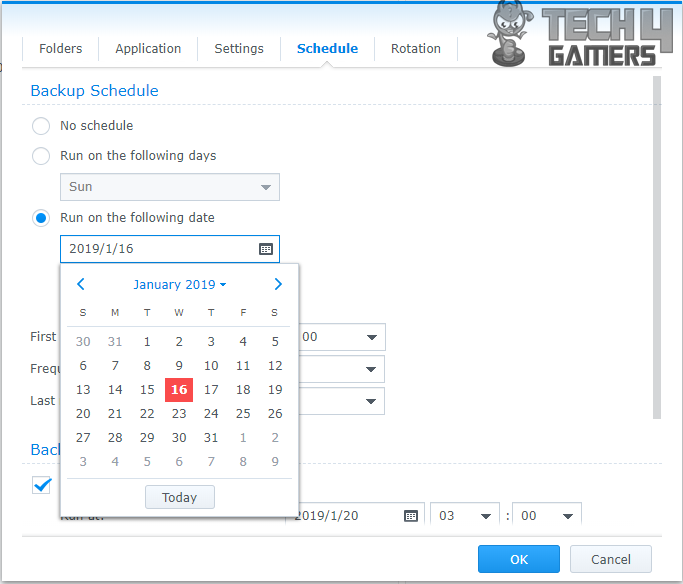 There is a drop-down list showing the days allowing the user to select the days as per the requirement. The next option is Run on the following Date. There are two options under this field. 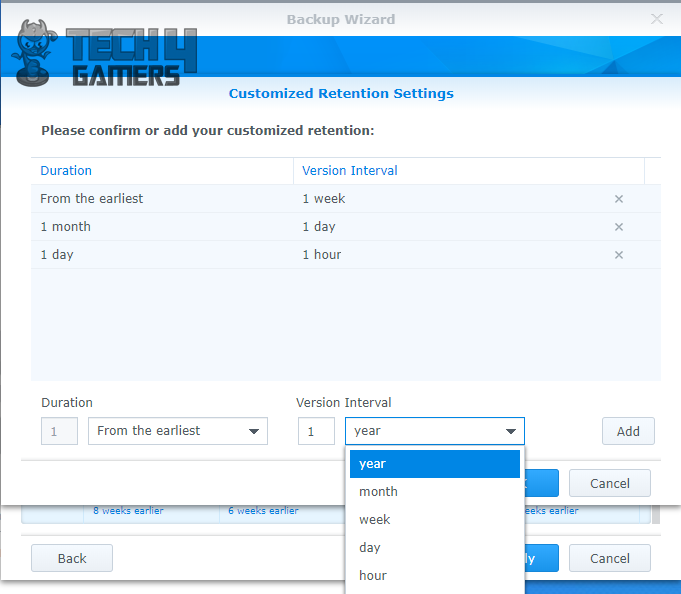 The top one is the Calendar in drop down format from which the user can select the date on which the backup task will be executed. The second option under Run on the following date is about the frequency of the task execution. 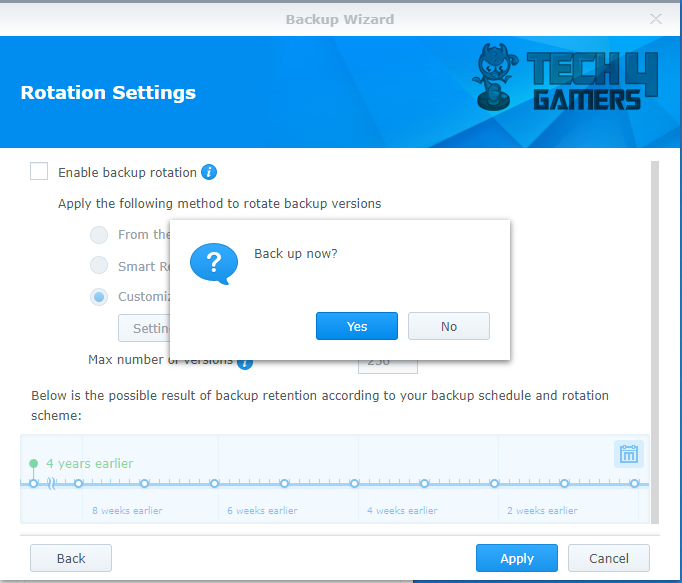 The options are Do not repeat which would mean one-time execution of the backup task. Then we have options like Repeat monthly, every 3 months, every 6 months, and yearly. 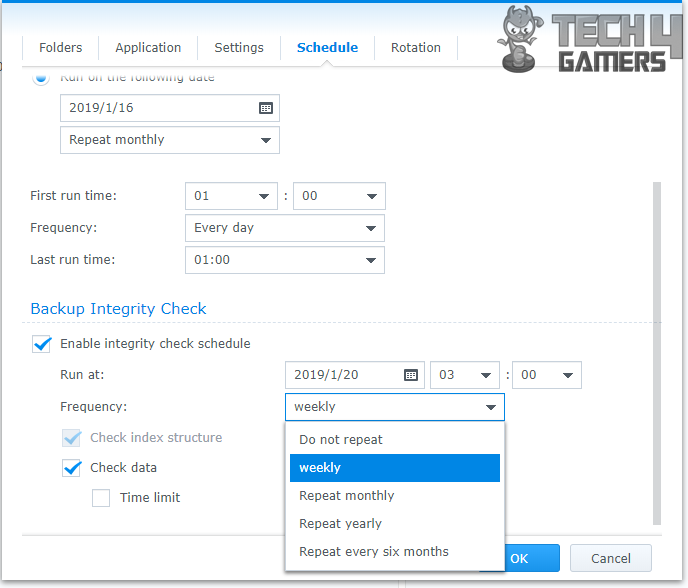 That would mean the selected backup task will run from the selected date in the calendar with the frequency of task execution after every time interval as specified. 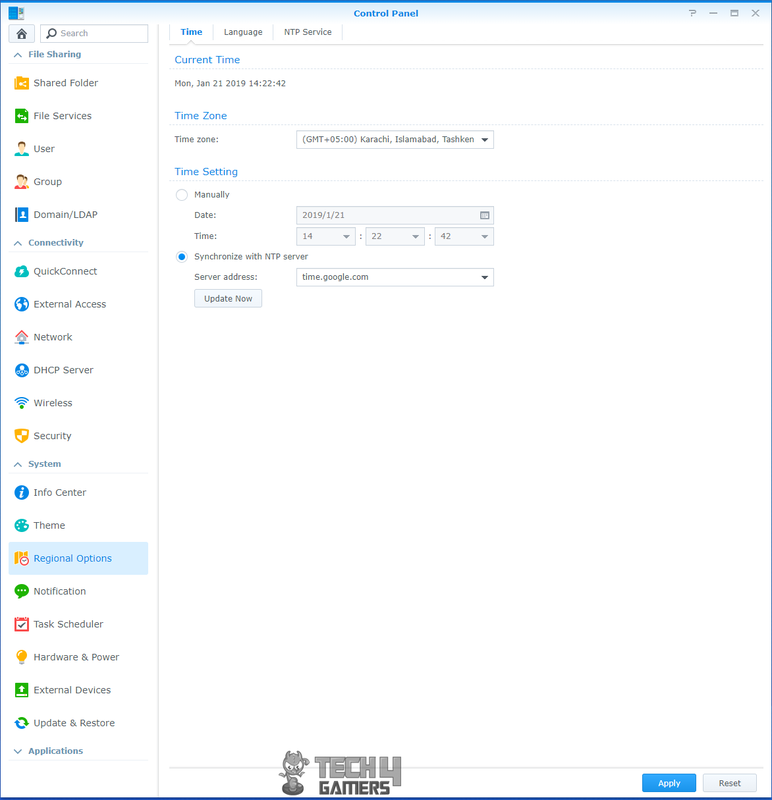 Another option for scheduling is to set the first run time of the backup task and then define its frequency in terms of Every day, Every hour, Every 2 hours, and so on. The user can also set the last run time. 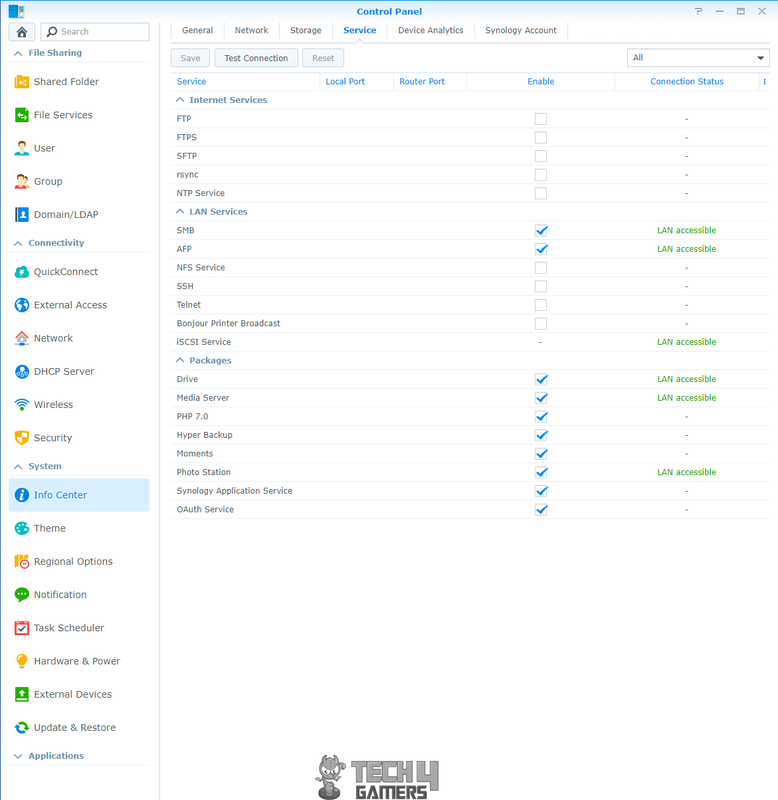 Clearly, Synology has provided very flexible yet a plethora of scheduling options/settings for the user convenience. They have almost covered every possible option in which user would want to set up the scheduling. 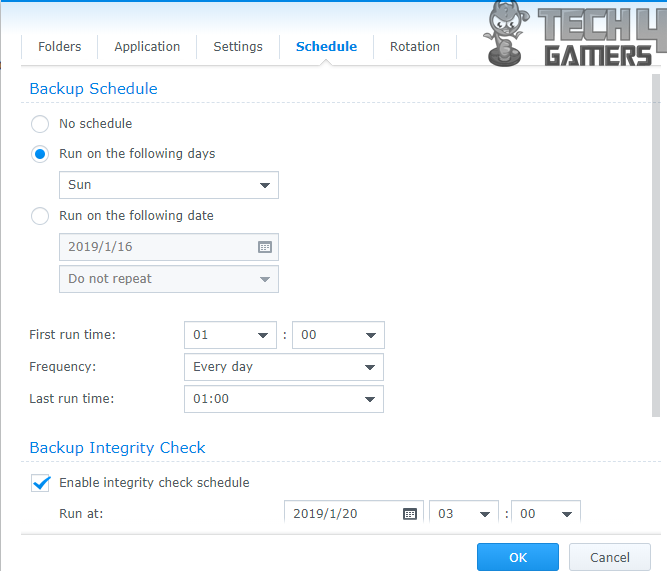 Similarly, there is a greater extent available to setup backed up data integrity checking the schedule. So far, we have discussed creating and executing the backup task. There is also an option to restore the backed up data. 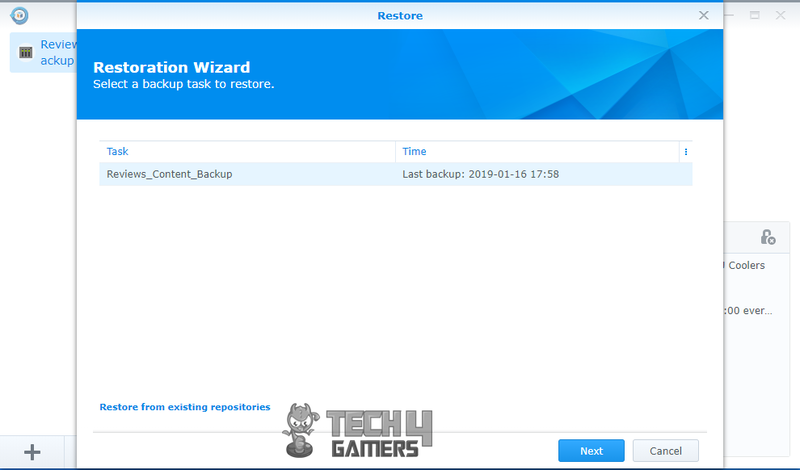 The restoration wizard will show the selected backup task. Click on Next. In the system configurations, the first option is Do no restore System Configuration. The second option allows the user to select the system configurations that he/she would like to restore from the date and time stamp. Click on the desired option and then click on next. 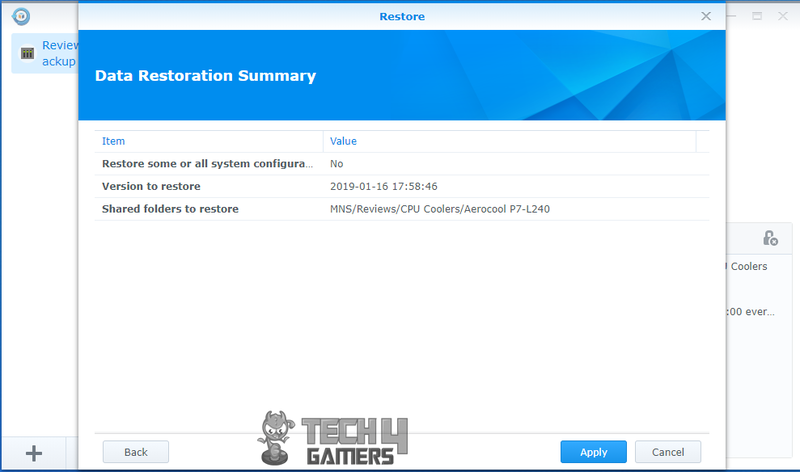 The next screen will show the data restoration options. The user can select the folder which is to be restored to and click on next. The next screen will show the summary of the restoration task including the version of the data to be restored. Click on the Apply button to restore the version of the data. This screen will show the progress of the restoration task. Once the task will be completed, the Ok button will be enabled. There is an event log available in the software that will show the details of the event along with its level and date/time. Similarly, the user can view the backed up versions and lock/unlock them from the same view. 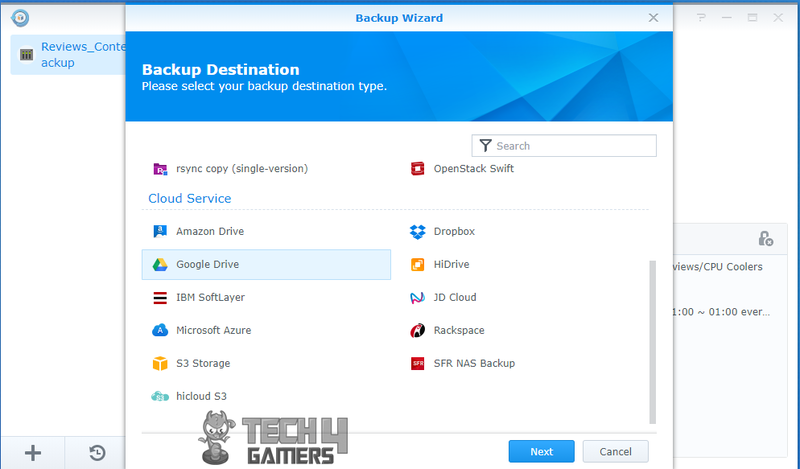 Now, I will walk you through the step needed to set up a backup task for Google Drive. Run the Backup wizard. Click on the Google Drive under the Cloud Service in the screen. Click on next. You will be re-directed to the Google Accounts in which it will be informed that Synology Hyper Backup wants to access your Google Account. It will also show what the Hyper backup would like to do with the account. Click at Allow. This will ask you to login if you have not already and will redirect you to a page asking for the permissions. Click on Agree. This will close the page and you will be back on the wizard screen. If the connection is successful, you will get to see the list of the folders on your Google drive. Click on the Create New Folder if you have not done so already. I created a folder named My_Contents. This will create a folder on my Google drive using the name mentioned above. Click on next and the rest of the steps are exactly the same as mentioned above. Hence, I am not repeating them here. 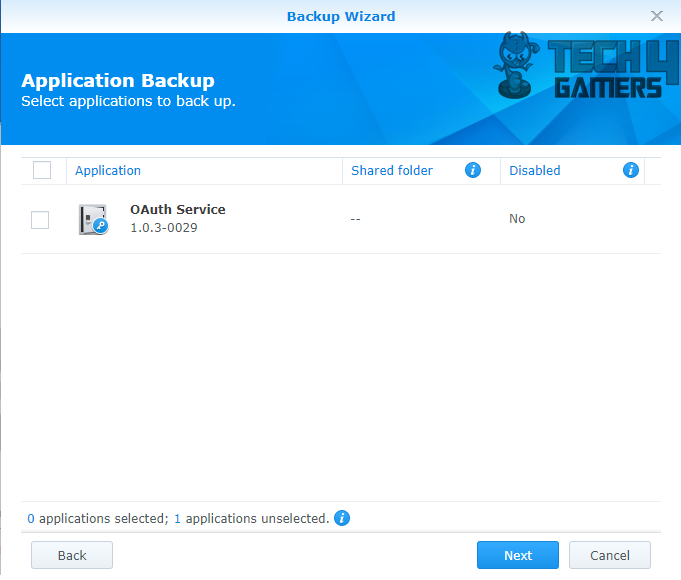 Once, you have defined all the settings, it will take you to the main interface of the Hyper Backup where the current status of the backup task will be displayed. The Action button will have a small down arrow on it indicating that there are further options available under it. Hovering the mouse over it will show two options which are Suspend and Cancel. Suspend will pause the backup task and Cancel will end the backup task. 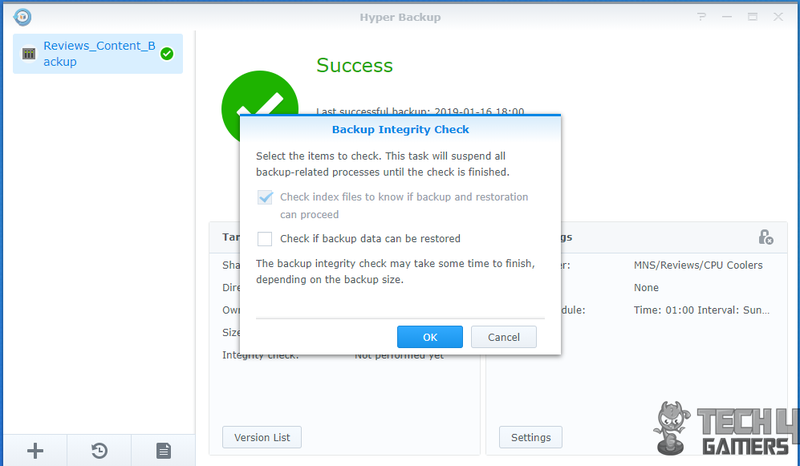 Once the backup is complete successfully, it will show the success message on the same screen. 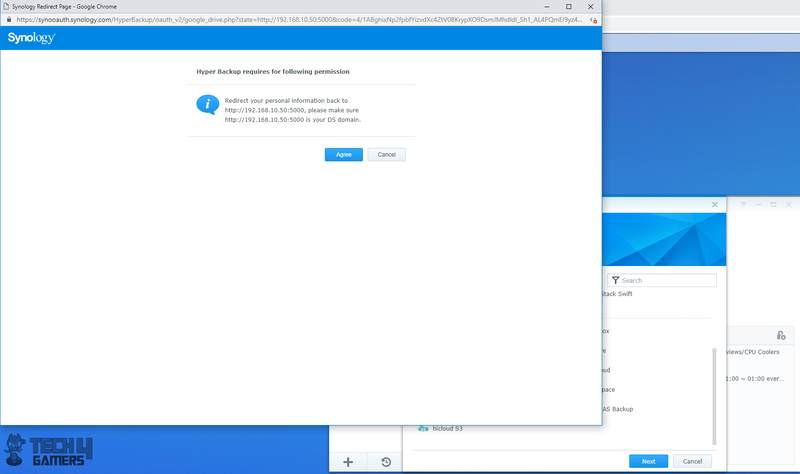 Please, note that the duration of backing up the data from the Synology to the cloud service is dependent upon the speed of your internet connection. I am hoping by now, you would have had a clear idea how flexible and features rich the Hyper backup from Synology really is to bring the convenience at the doorstep of the user when it comes to backing up your precious data. Ever increasing base size of the modern games. Continuous roll out of games updates that could take from few MBs to GBs of storage need. Once the drive on PC reaches its storage limit, you will have to consider adding more storage hence more cost or deleting older installations. DiskStations definitely make their case in these scenarios. I offloaded most of the games that I simply did not want to delete, to the DiskStation. This creates room for more games. Not only that, but I also installed and played a few games directly from the DiskStation. The average load time of the game from the DiskStation was roughly 38 seconds whereas it was like 20 seconds loading from the PC connected HDD. Load time will definitely be much less from SSD. Remember, the better the network speed, the better the load times as well and adding more RAM to the DiskStation would be beneficial. For the games with Single Player Campaign, I did not encounter any lag except that of slow load time. But the same was not true for the Online or Multiplayer Campaign side of the games as lag was quite noticeable. Without a doubt, DiskStation is useful for gamers with a large library of the games. Also, by centralizing the games, I was able to easily access them from my both PCs without copying pasting from drive to drive and then PC to PC. This is my personal opinion based on my experience. Synology needs no introduction when it comes to Network Attached Storage solutions, Cloud services, IP Surveillance solutions, and network equipment. 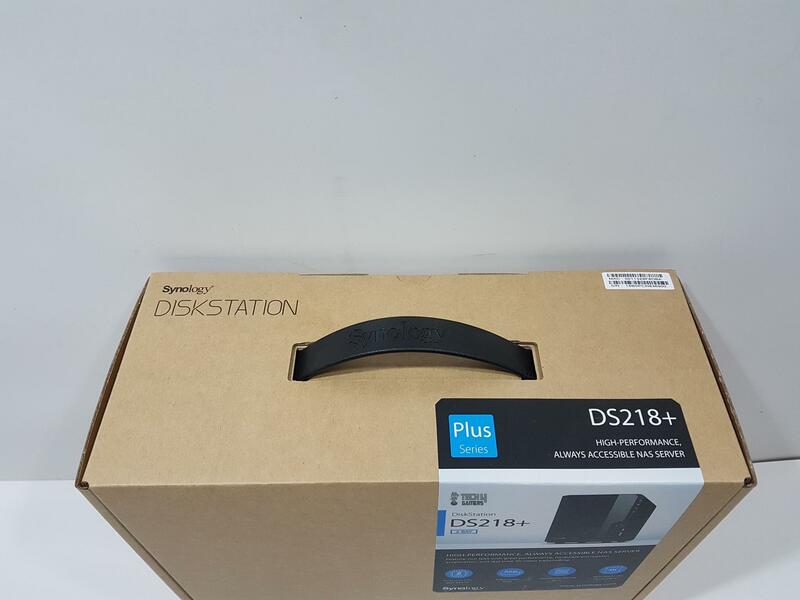 They were kind enough to let us take a spin on their Plus series DiskStation DS218+. The DS 218+ is a two-bay NAS solution aimed at the home user and small size office set up. This DiskStation is engineered for high-performance and data-intensive tasks, designed to meet on-the-fly encryption and scalability demands. The DS218+ is a compact yet powerful dual-bay NAS box which is equipped with a dual-core CPU, AES-NI hardware encryption engine with 2GB DDR3L RAM module. It is compatible with 2.5” and 3.5” HDDs/SSDs with a maximum single volume size of 108TB and maximum internal raw capacity of 28TB. In terms of the file system, this box supports Btrfs, EXT4 for internal drives and Btrfs, EXT3/4, FAT, NTFS, HFS+, exFAT for external drives. 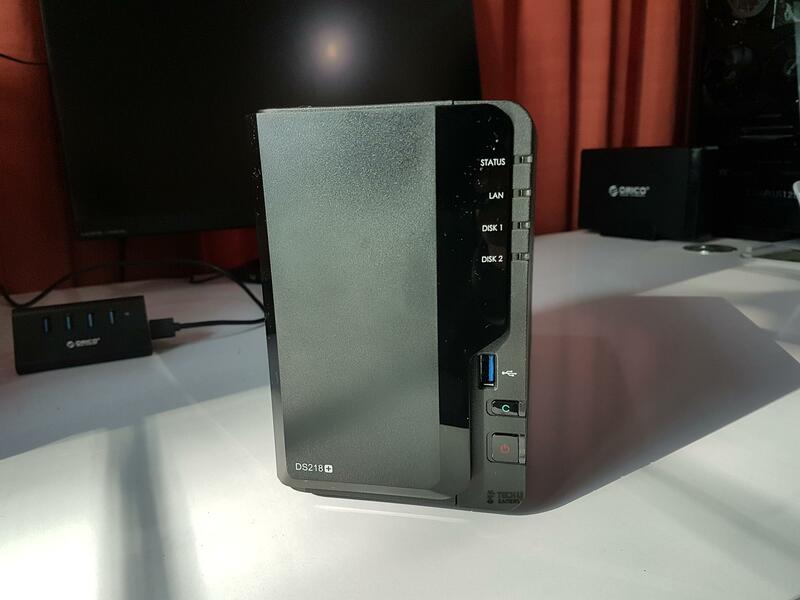 In terms of connectivity, this box has a single 1GbE LAN port, 3x USB 3.0 port, 1x eSATA port and also features a copy button. The DS218+ supports Synology Hybrid RAID which is a default RAID, Basic, JBOD, RAID 0/1 with the flexibility to expand the storage by adding an HDD yet supporting Synology Hybrid RAID. We can create a maximum of 2048 local user accounts with 256 maximum share folders and local groups. Up to 400 events can be logged per second. In terms of cloud station server, it can host up to 500 maximum numbers of concurrently connected devices. By adding more RAM (up to 4GB more), this count can be expanded to 1500 at a time. It can host a maximum of 80 concurrent downloads. If setting DS218+ up as a surveillance station, then maximum 25 IP Cams can be hosted. Using H.264 protocol, this device supports 120 FPS at 4k whereas this count is 200 FPS using H.265 and 130 FPS using MJPEG. The maximum no of hosted files is 500,000 under Synology Drive. It can feature a maximum 2 channels transcoding using 30 FPS at 4k and FHD resolutions. 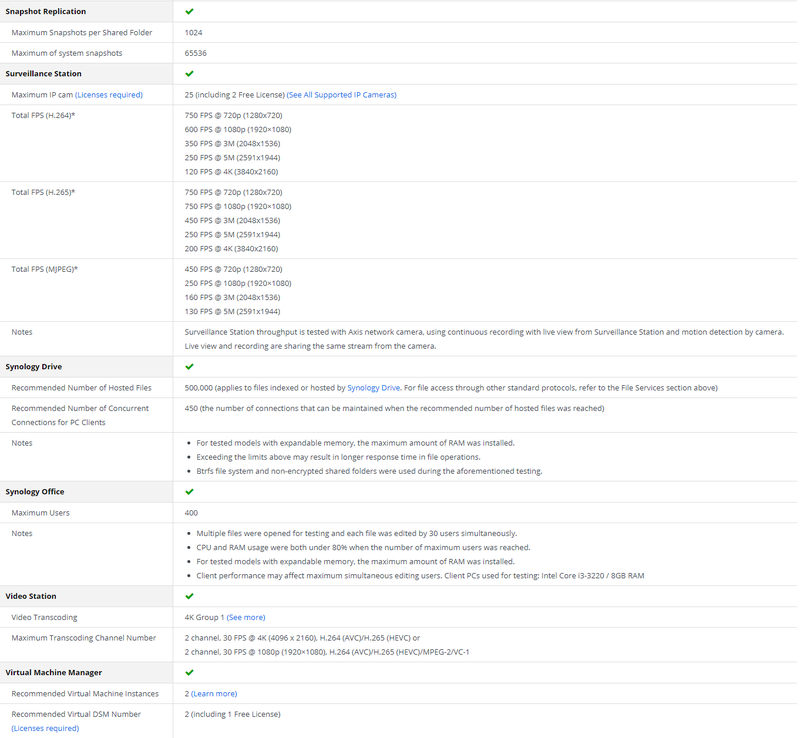 Maximum 20 connections are supported as a VPN server and maximum of 2 virtual machine instances are supported which is understandable given the basic RAM and CPU configuration. I am sorry, there is so much to talk about but I can’t do in a single content. Make sure to check the specifications area of the content for more details. The enclosure is made of the plastic outer frame which is rugged. The dimension of the unit is 165x108x232.2mm (HxWxL). The power supply unit/adapter is rated for 60W using 100V to 240V AC. The power frequency is 50/60Hz using a single phase. The power consumption is 17.23W (Access) and 5.4W (HDD Hibernation). British Thermal Unit rating is 58.79 BTU/hr (Access) and 18.43 BTU/hr (HDD Hibernation). The operating temperature rating is 5°C to 40°C which is a question mark from my side as during summers my ambient temperature ranges from 45°C to 49°C without AC. Storage temperature rating is -20°C to 60°C. Relative humidity is rated between 5% to 95RH. The product carries EAC, VCCI, CCC, RCM, KC, FCC, CE, BSMI certifications and has 2 two years of warranty. Since it is a complete processing unit, we can think of it as a small size PC which in fact it indeed is. The CPU is Intel Celeron J3355 which is a dual-core chip with a turbo boost of 2.5GHz. It has hardware encryption AES-NI engine and supports H.264 (AVC), H.265 (HEVC), MPEG-2, and VC-1 with a maximum resolution of 4k (4096×2160) with maximum FPS of 30. The system memory is 2GB DDR3L with one more slot at the user’s disposal to add up to 4GB more to make the total count of 6GB. The box is rated at 113 MB/s encrypted reading and 112 MB/s encrypted writing. The front side of the DiskStation bears a beautiful and bold design which looks that in good in person. There is a removable cover which has its both ends in a glossy finish while the main body is in a matte finish. On the right side, we have 4 indicator LEDs informing about the Status, LAN, Disk 1, and Disk 2 activity. Their labels are printed on the glossy side of the front cover. 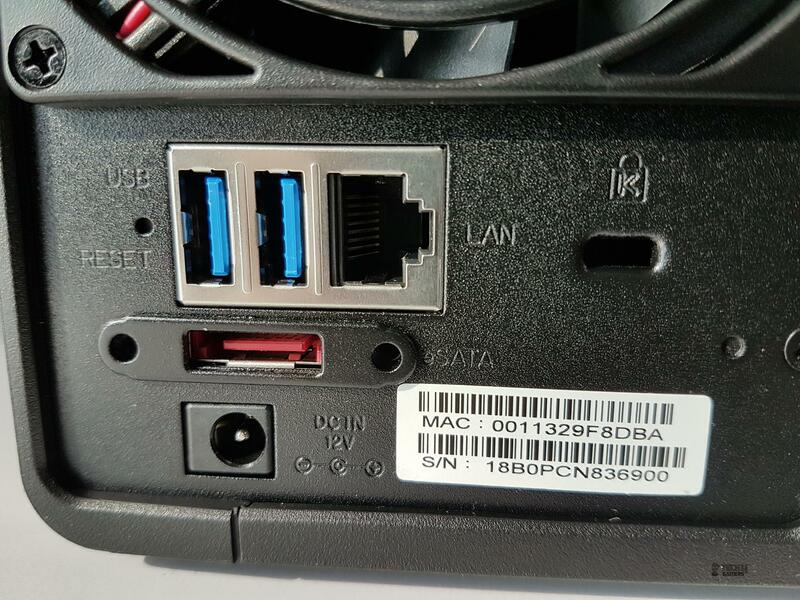 There is a USB 3.0 port at the bottom followed by the Copy button. The last button is the Power on/off. The rear side of the unit has 92mmx92mm system fan to exhaust the heat of the system. There are three modes that the user can access in the control panel of DSM to control the speed of the fan. These are Full Speed Mode, Cool Mode, and Quiet Mode. The default is the Quiet mode and it serves the purpose very well. During my testing when some 200GB of data was being copied to the drives with RAID on the maximum temperature on Disk 1 was 27°C and that of Disk 2 was 28°C. This was with the ambient temperature of 16°C and fan in the Quiet mode. This fan is rated at 19.3 dB(A). the fan grill is plane of the main housing. The unit is not audible with the fan in quiet mode however, it makes certain hum noise of short pitch which is coming from the vibration of the disks. Although there are rubber mounts on the four feet of the unit, they seem to be inadequate to absorb the vibration sound. I simply lifted the unit up and the noise was a goner. I added a thick Styrofoam padding under the unit and the noise was gone like forever. In terms of the connectivity, we have two USB 3.0 ports, one RJ 45 GbE LAN port, one Kensington lock, a reset button, and an eSATA port and the DC input. 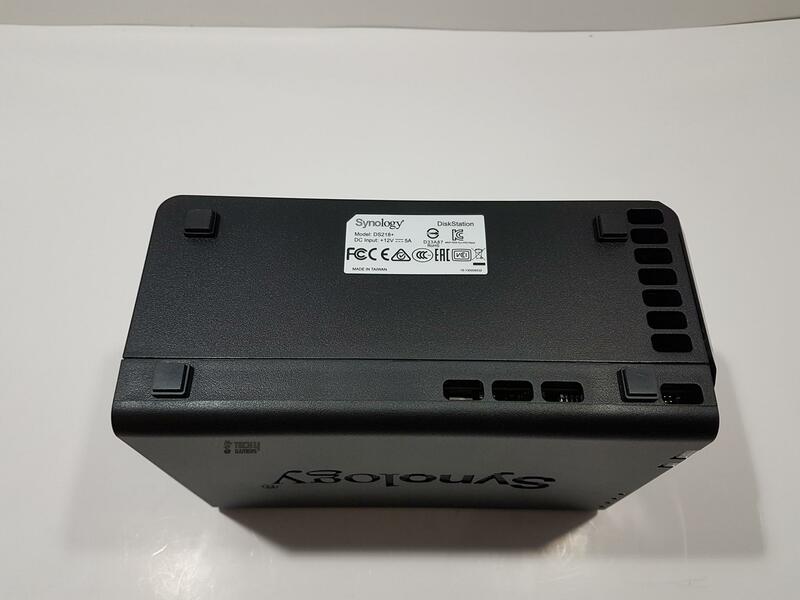 Synology has provided the power adapter and Rj 45 LAN cable which is Cat 5e rated. The hard drives/solid-state drives are secured on the caddies using the arms on the caddies or the bundled screws. For a complete listing of supported drives, please visit the Synology website. 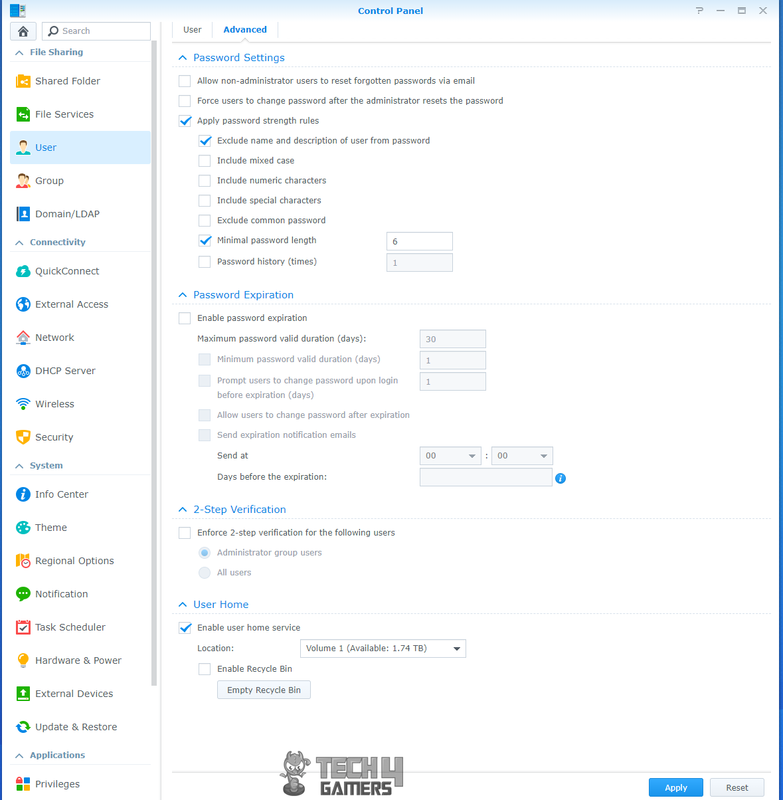 For each of these functions, there are packages and settings that the user can download and configure the DiskStation accordingly. 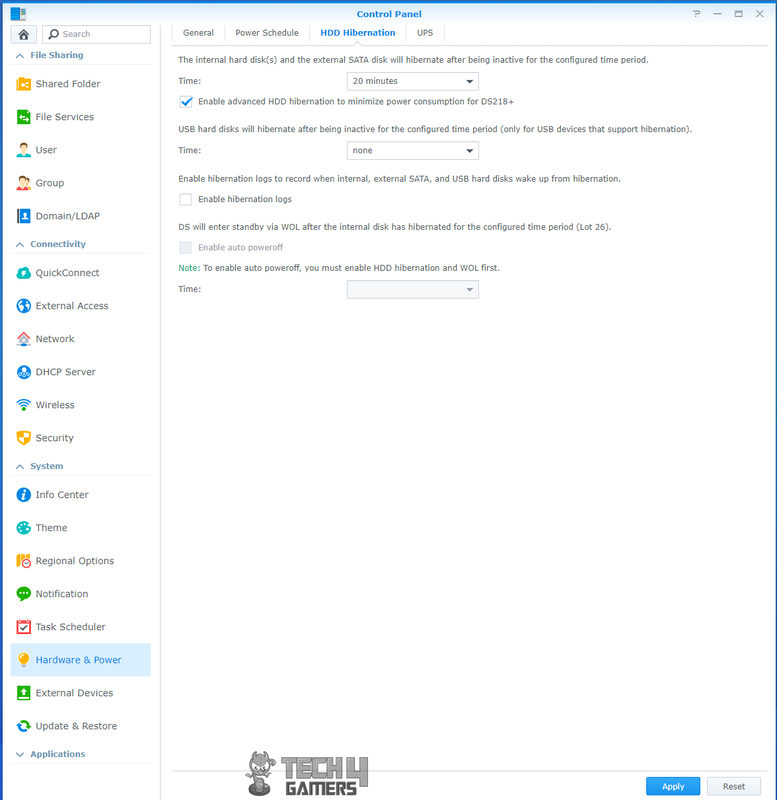 The knowledge base on the Synology website will help you walk through easily to set up what you need. Some of the important packages that are at the very heart of the DSM are Drive, File Station, Snapshot, Hyper Backup, Moments to name a few. Make sure to spend your good time with the Control Panel as it is the hub of all the settings needed to configure and drive your DiskStation. Also, make sure to regularly update the DSM and installed packages. Being the web-based client, there are certain limitations on what type of files can be uploaded using the web-browser based package but Synology has overcome this issue by using JAVA run time library. The user would need to download and install the JRE from their website. This would allow uploading many of the previously unsupported file types. The widget is a powerful yet a simple way of letting the user taking a quick look at the summary of their hardware and software. 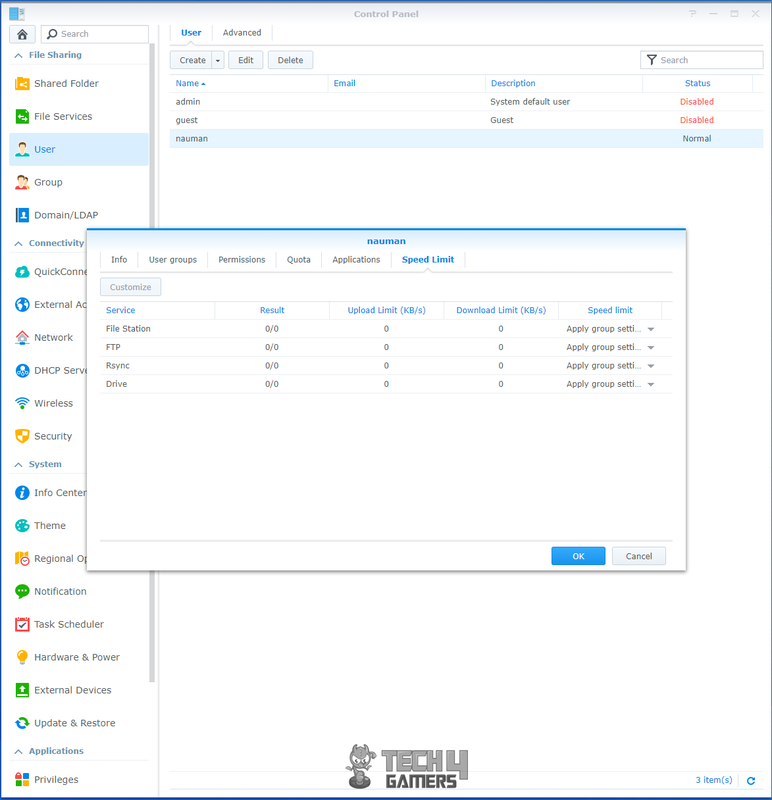 It allows the monitoring of the CPU, RAM, and LAN statistics, the overall health of the DiskStation, Volume(s) and Disk Drive information, connected users information and much more. For more information on DSM and its functions, please read our related sections above. While, the DiskStation is an effective solution for the content creators that would enable them to sore their ever growing digital data on the scalable storage solution which can be remotely accessed as well using the Synology mobile applications like DS Photo, DS File, DS Cloud to name a few, the gamers can also utilize the centralized storage solution for their large size of games library which is occupying lot of their PC connected storage solution. I have moved a bulk of my games to the DiskStation making more room on my local disks. I have installed and played a few games on the DiskStation. The average load time of the game from the DiskStation was roughly 38 seconds whereas it was like 20 seconds loading from the PC connected HDD. Remember, the better the network speed, the better the load times as well and adding more RAM to the DiskStation would be beneficial. For the games with Single Player Campaign, I did not encounter any lag except that of slow load time. But the same was not true for the Online or Multiplayer Campaign side of the games as lag was quite noticeable. 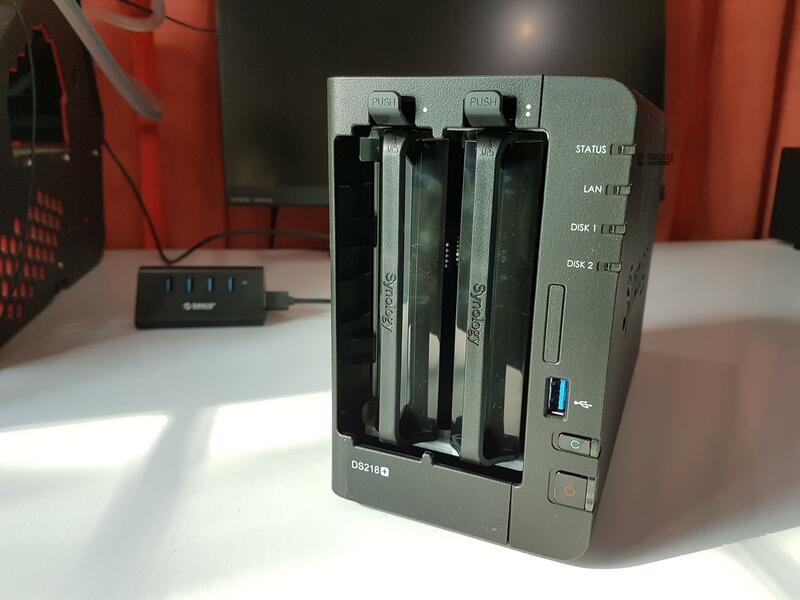 My overall experience with the Synology DS218+ has been exceptionally good. I have two PCs, a laptop and 3 mobile devices. After setting up a home network and putting the central storage on this network, I was able to better harness this power. Now, my wife and I are free of the hassle that we had when data was needed on multiple devices and we were largely USB flash drive dependent which has its own considerations. Similarly, now, our photos and videos are being backed up automatically and we can enjoy video streaming from the DS218+. 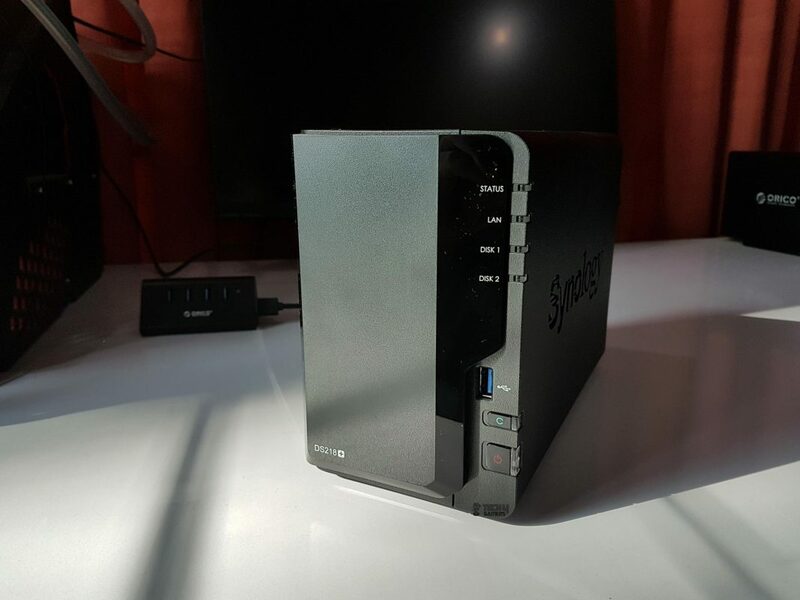 The possibilities are endless with the DS218+ and surely with the other Synology NAS. 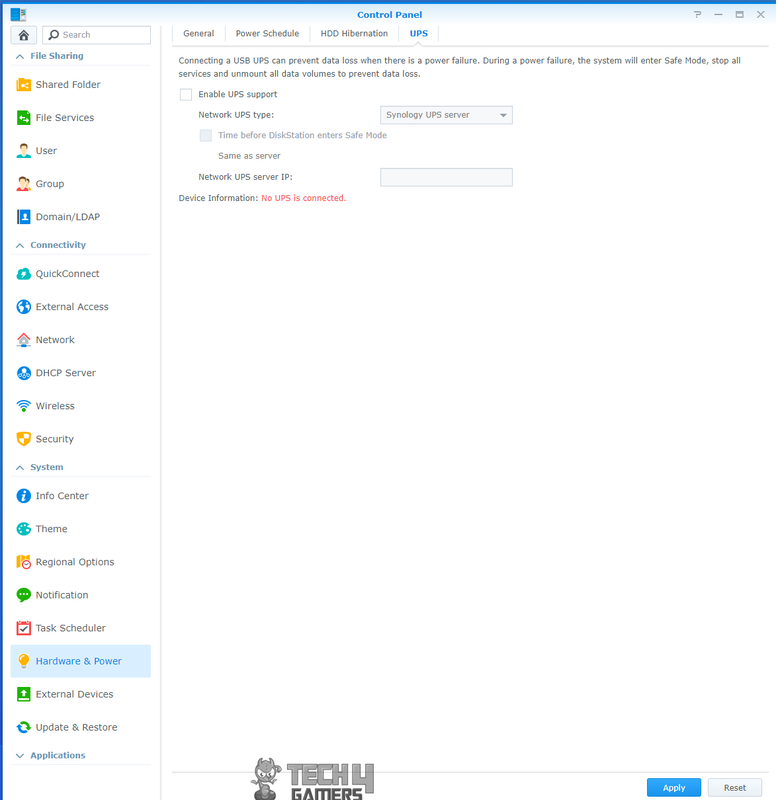 Synology has made it possible to connect another Synology NAS to the current one to expand the storage requirement without affecting the current storage. Flexibility, user-friendliness are written on the forehead of the Synology NAS solutions. If you are a home user with multiple devices and in need of a proper centralized storage solution then look no further as Synology DS218+ has got you covered. 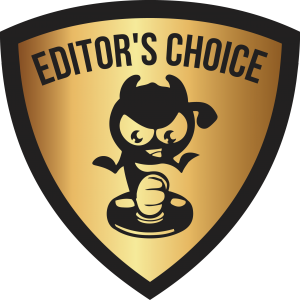 Though the pricing for a two-bay enclosure is steep i.e $298 (at the time of the review) but it is totally worth it and it has earned our Editor’s Choice. 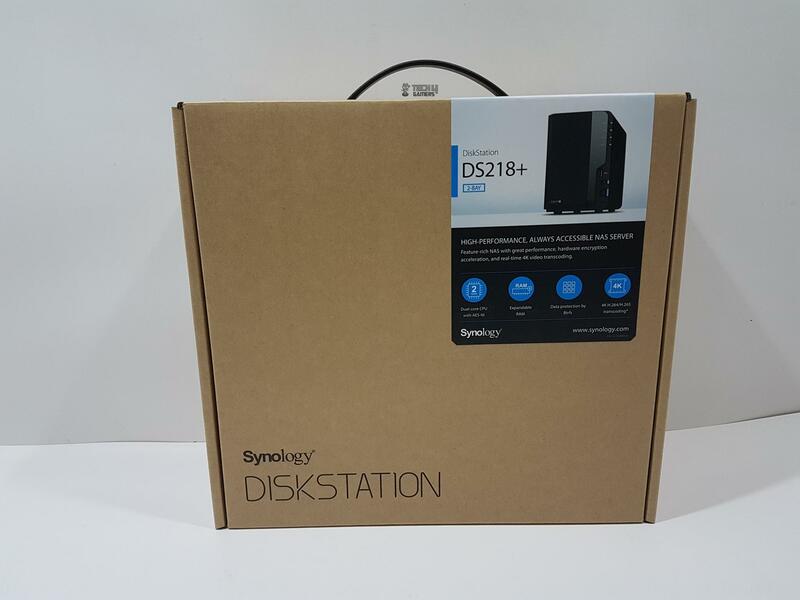 We are thankful to the Synology for giving us the opportunity to test their DS218+ DiskStation.